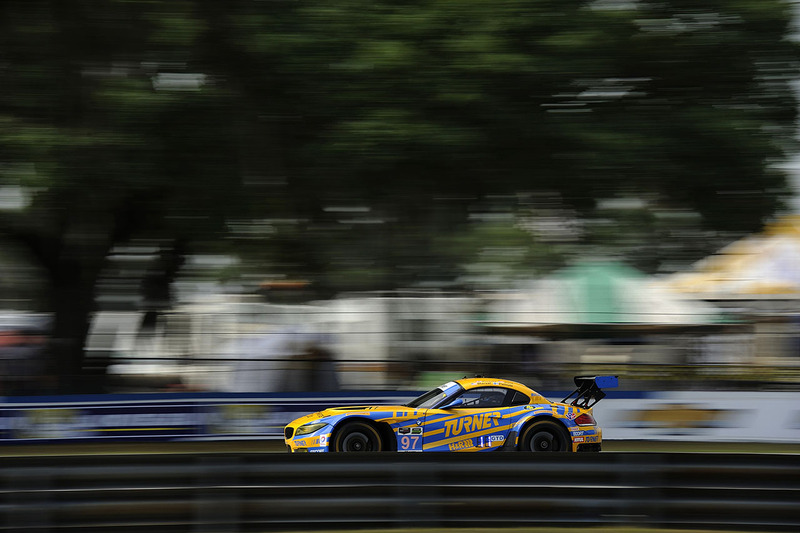 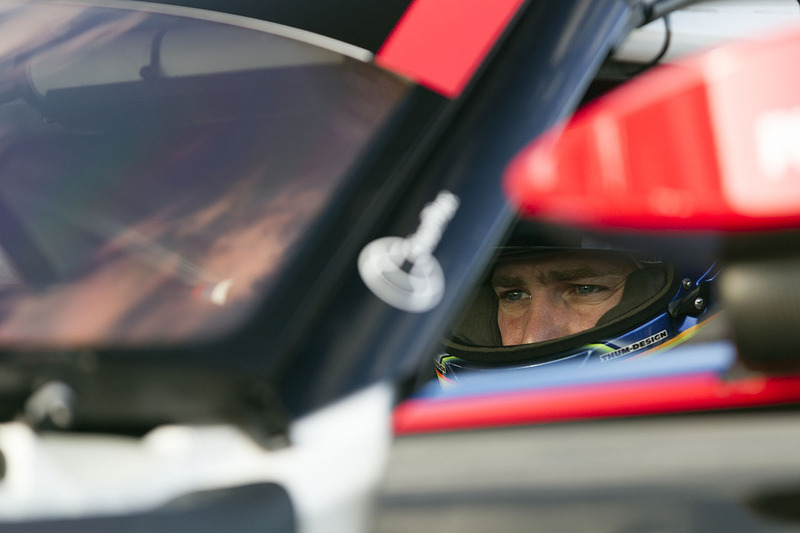 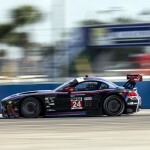 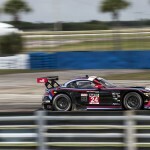 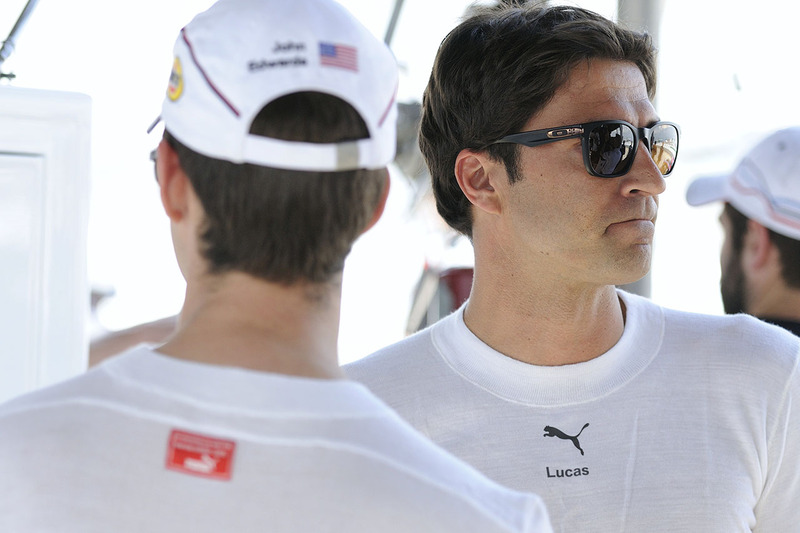 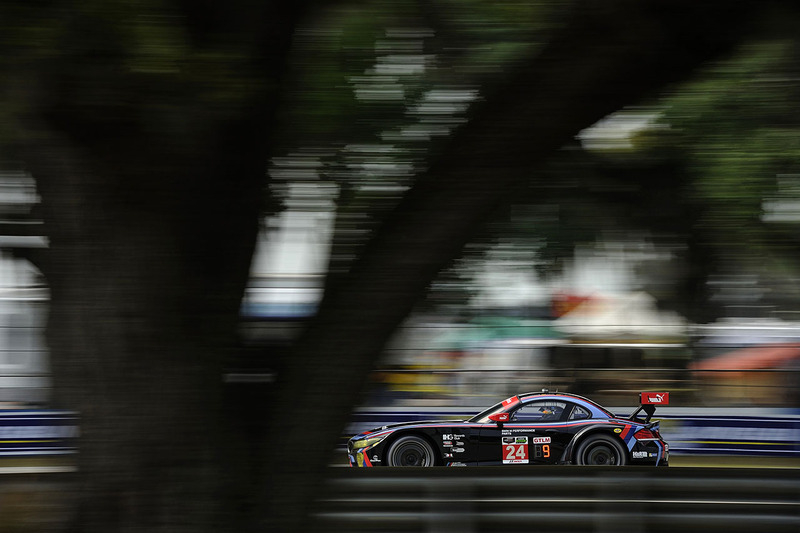 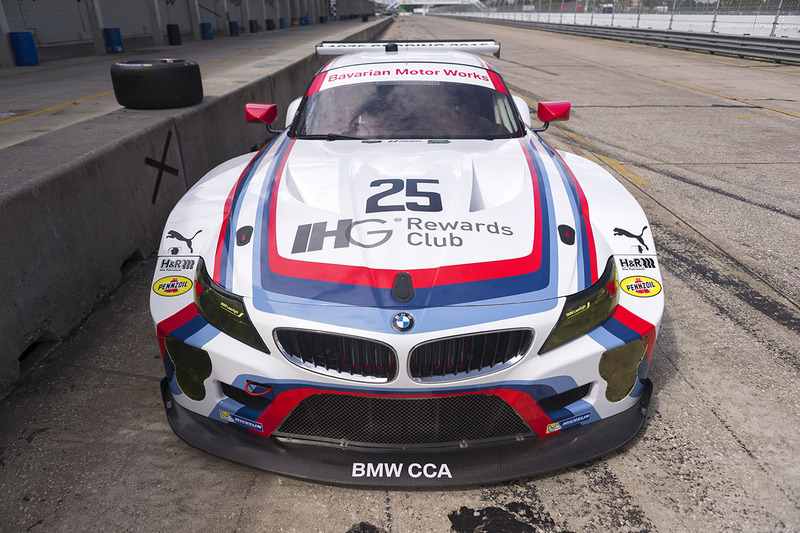 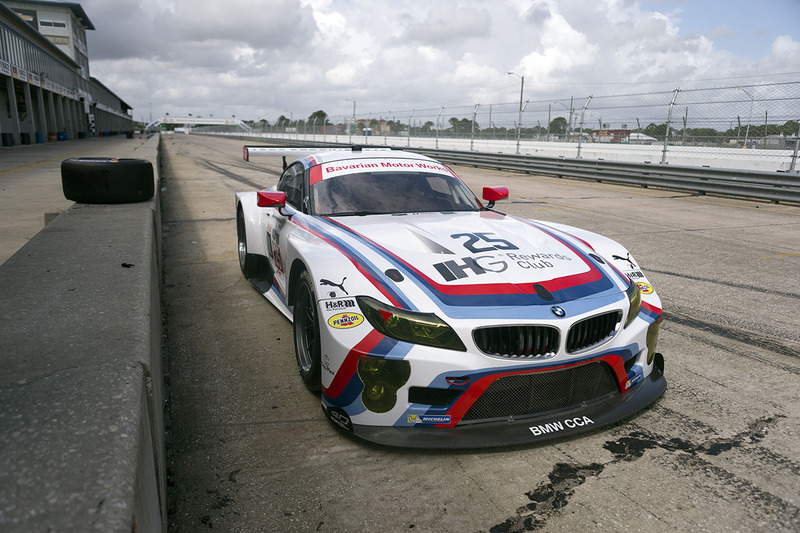 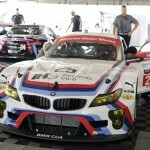 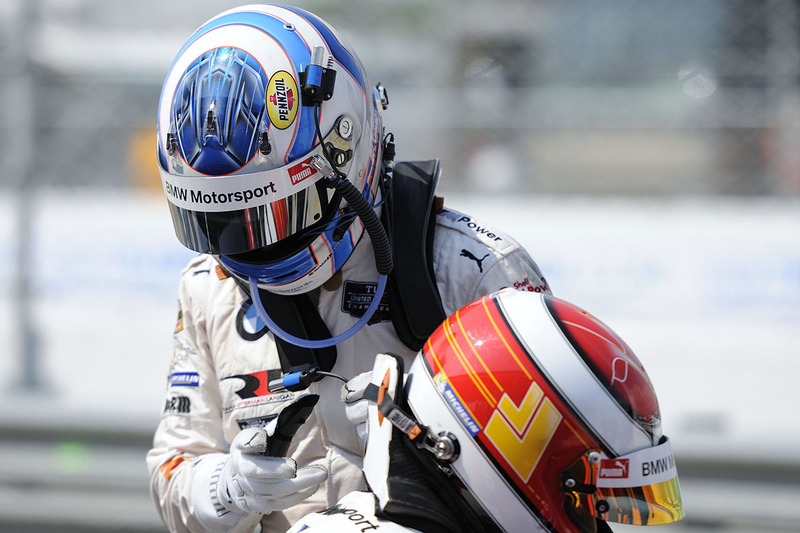 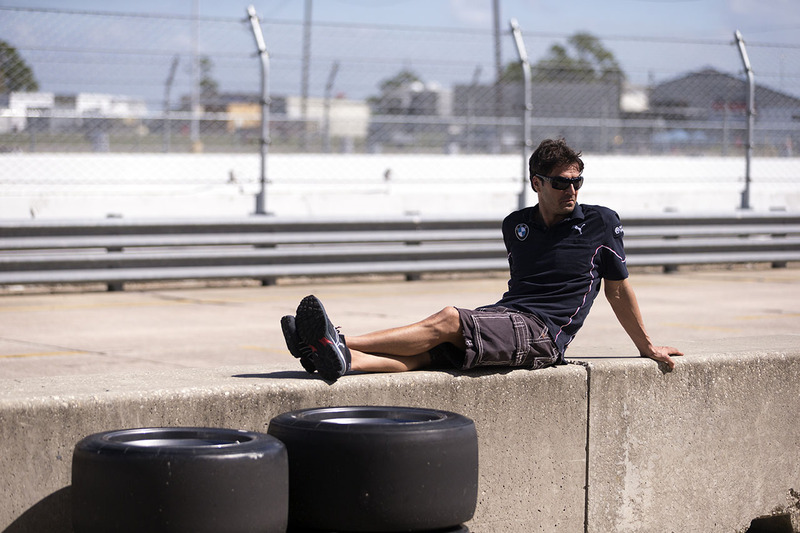 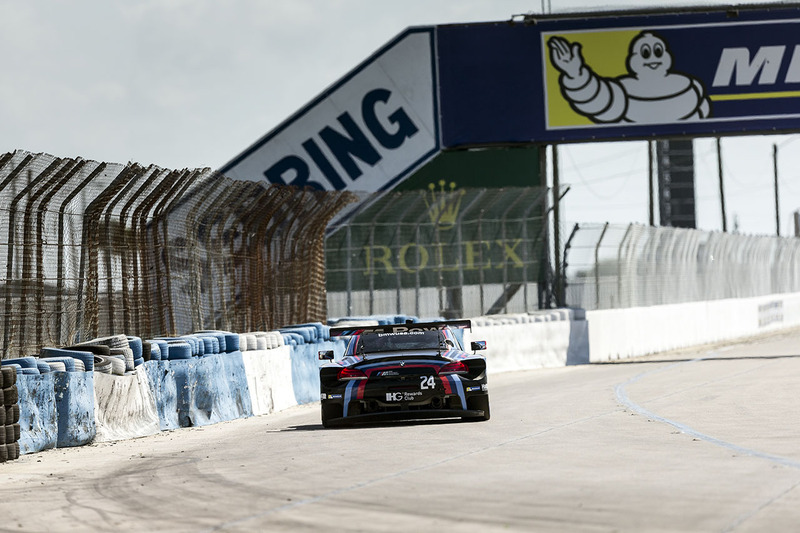 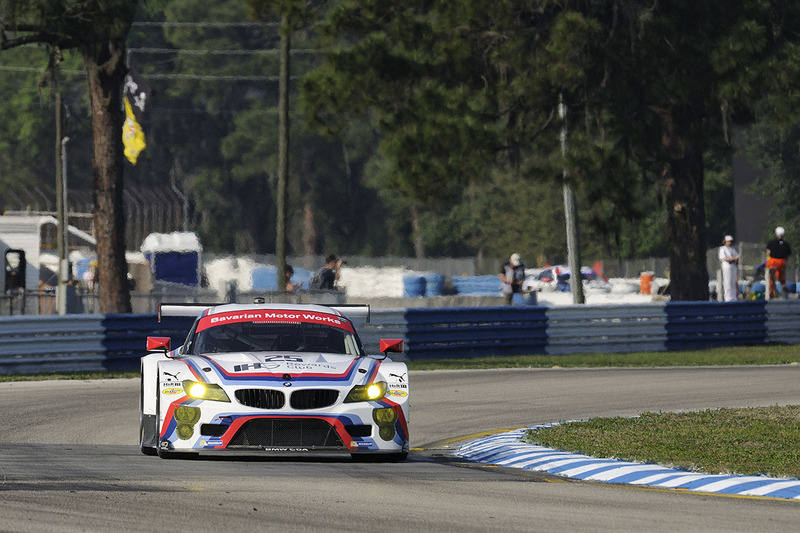 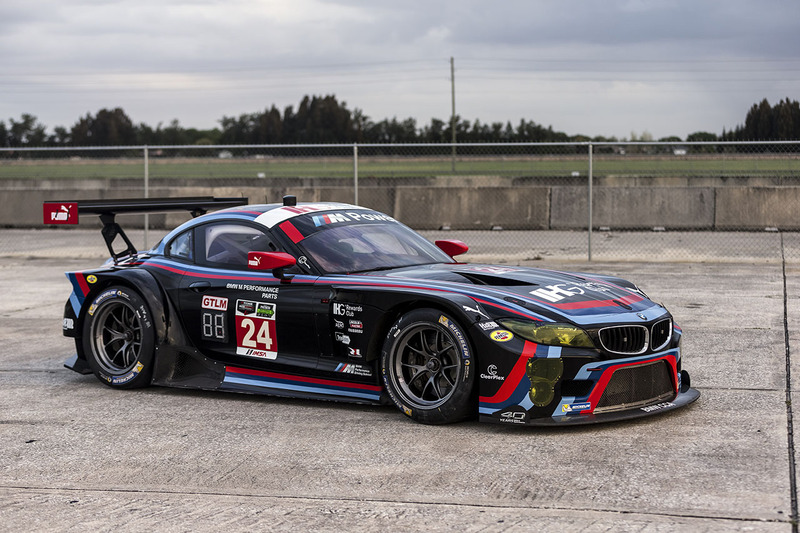 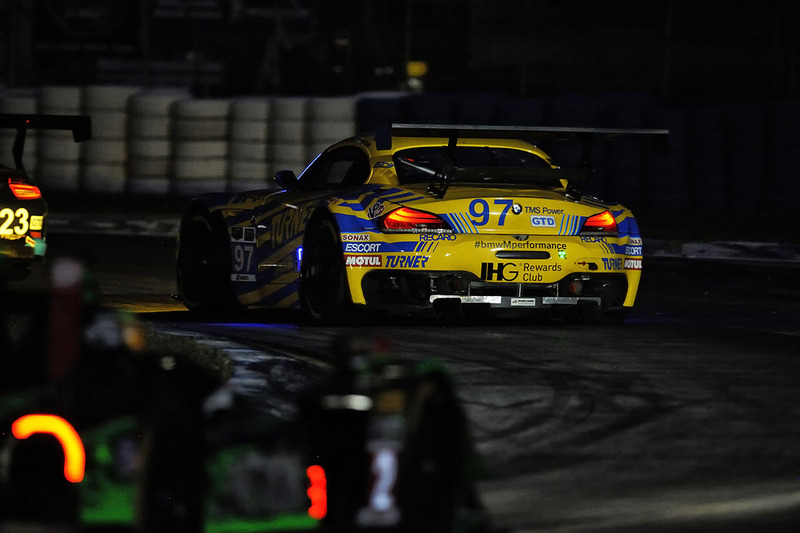 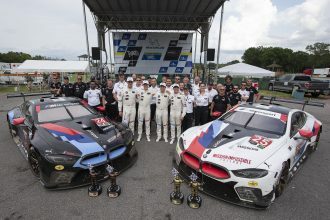 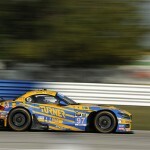 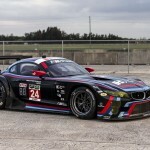 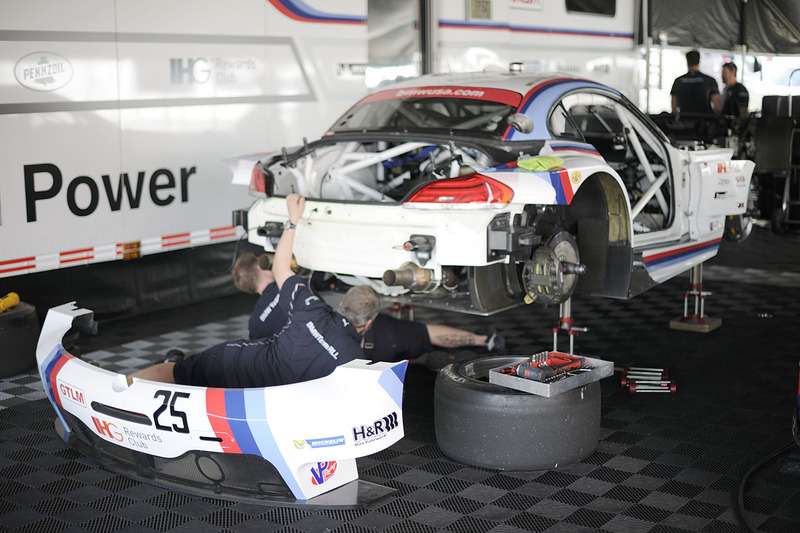 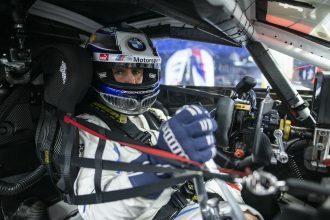 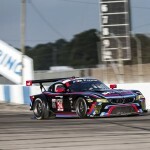 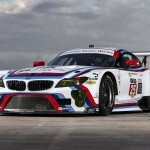 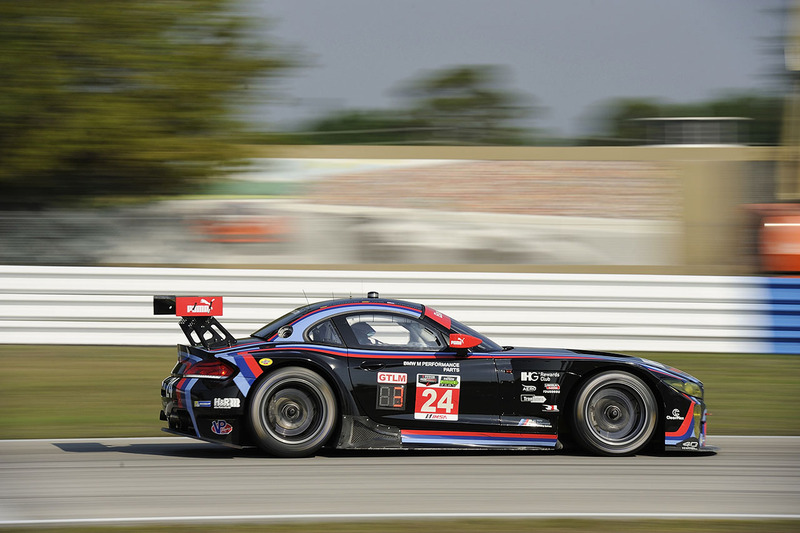 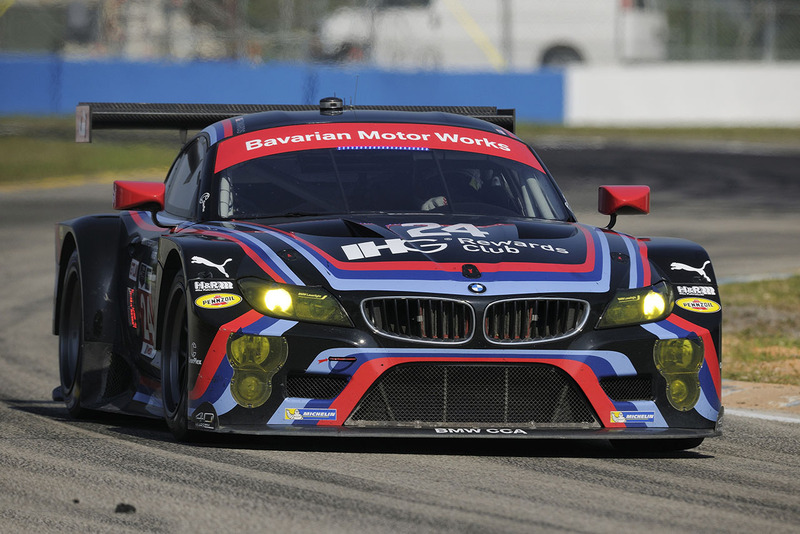 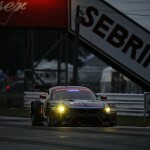 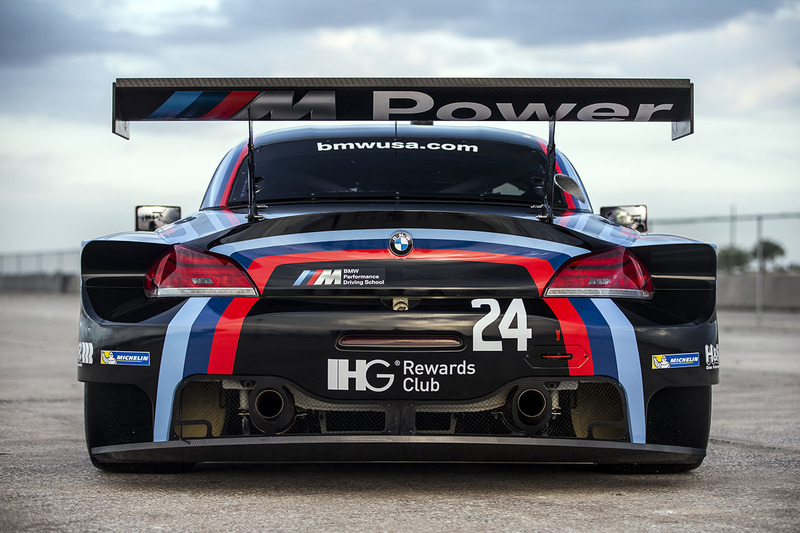 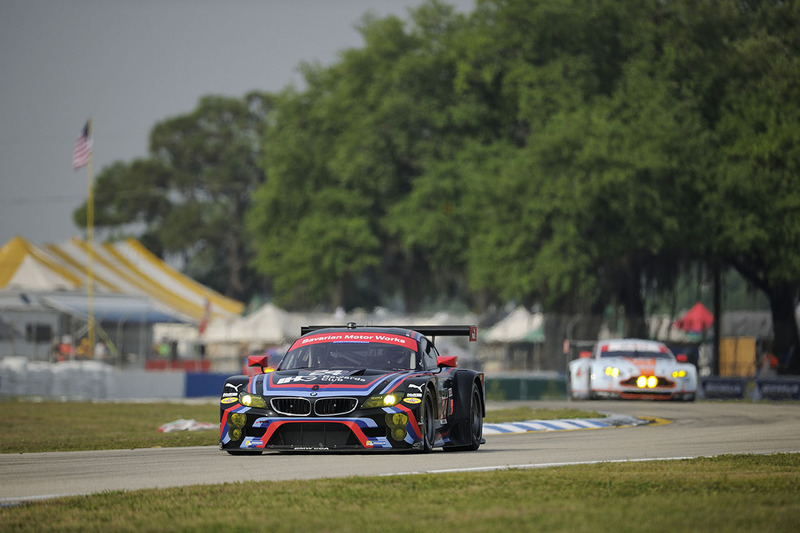 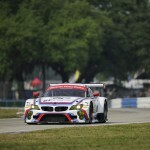 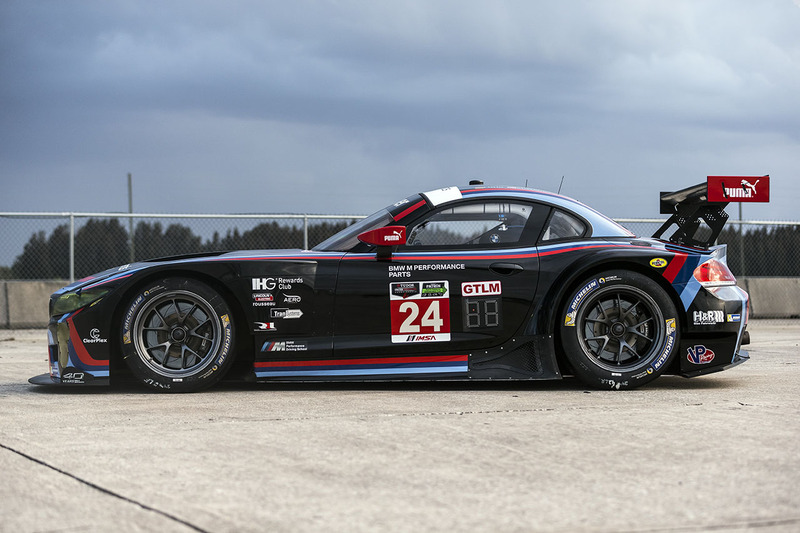 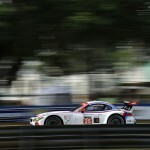 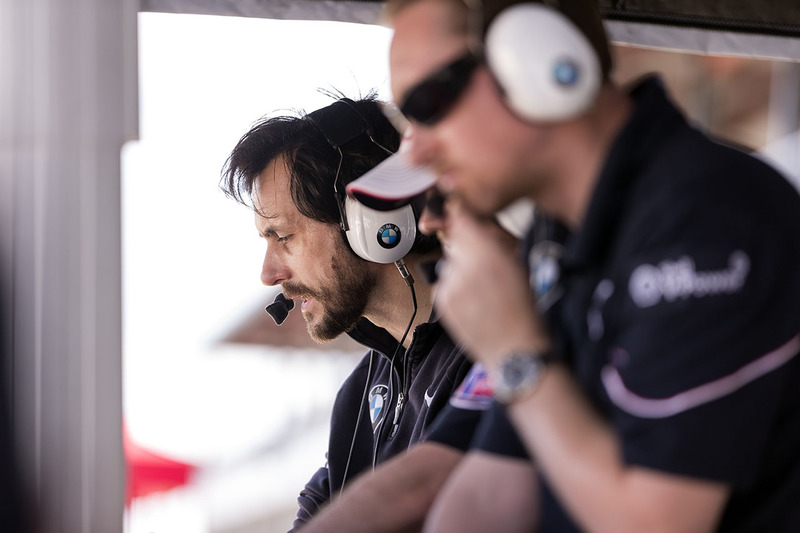 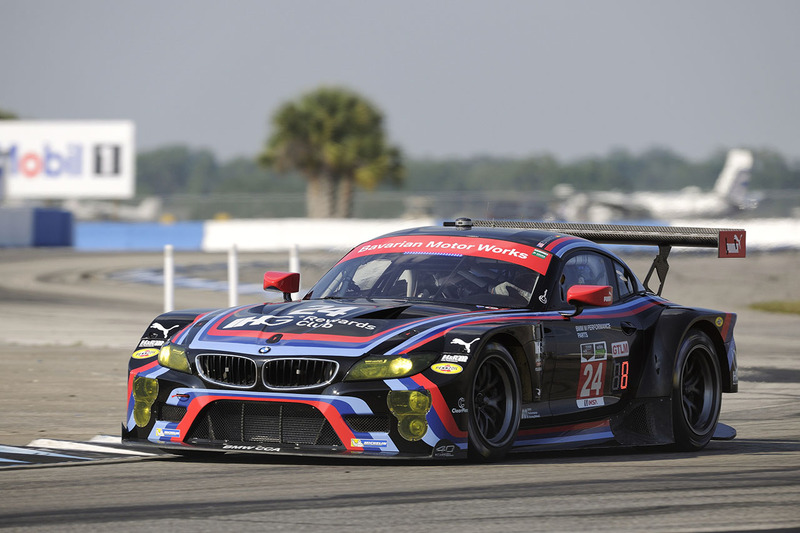 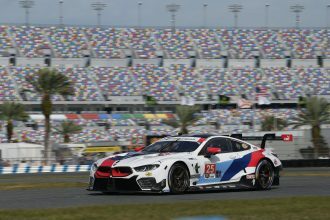 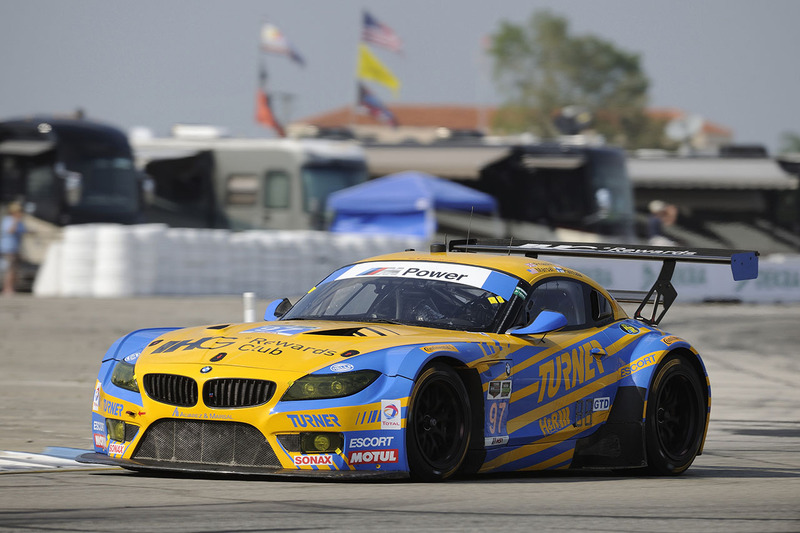 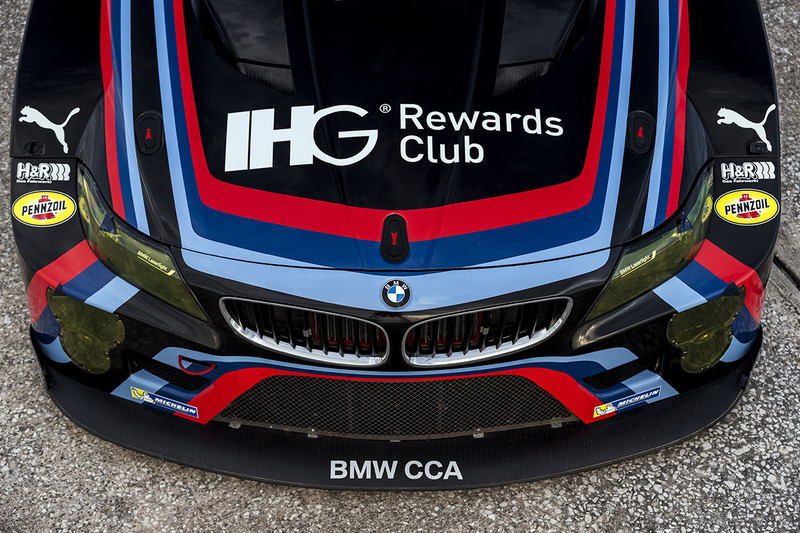 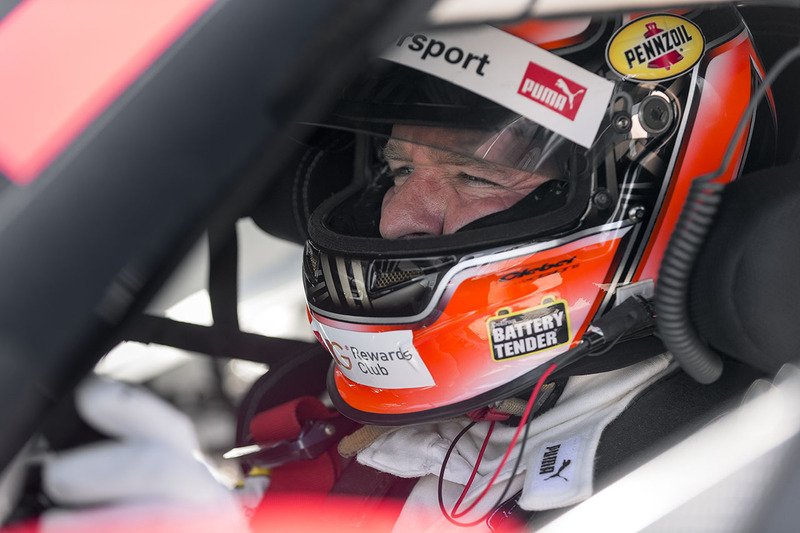 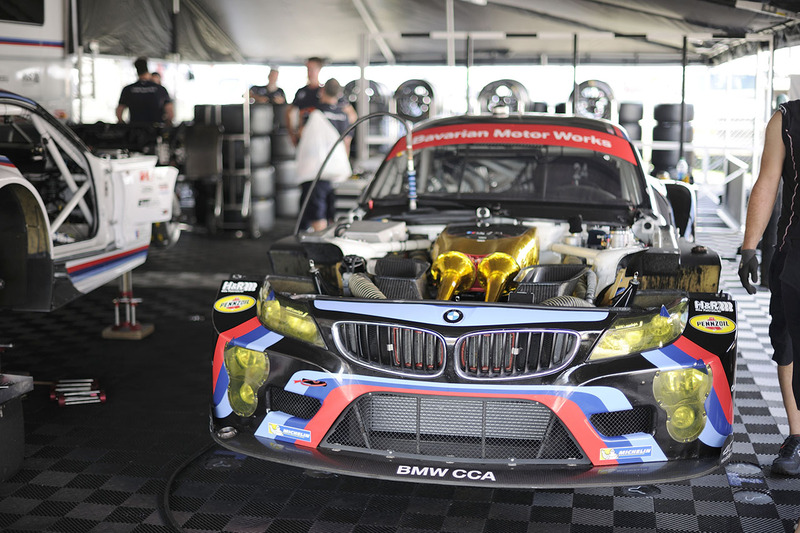 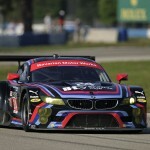 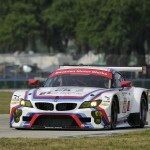 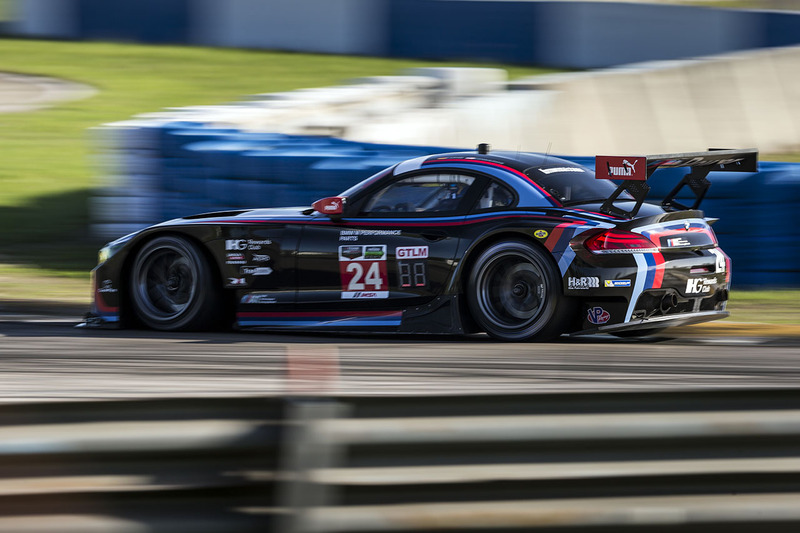 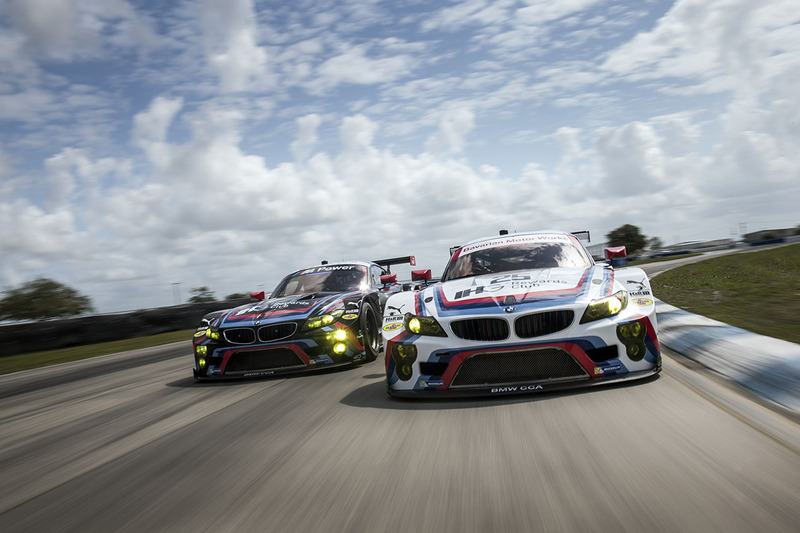 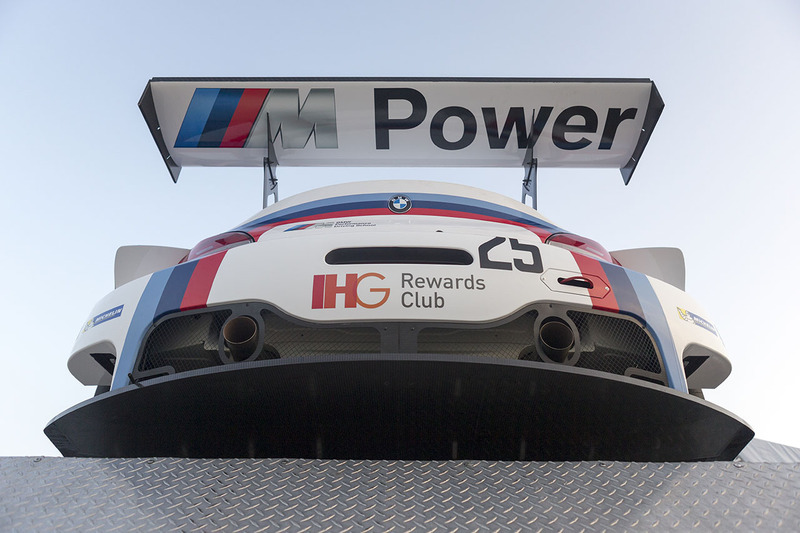 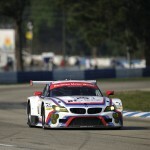 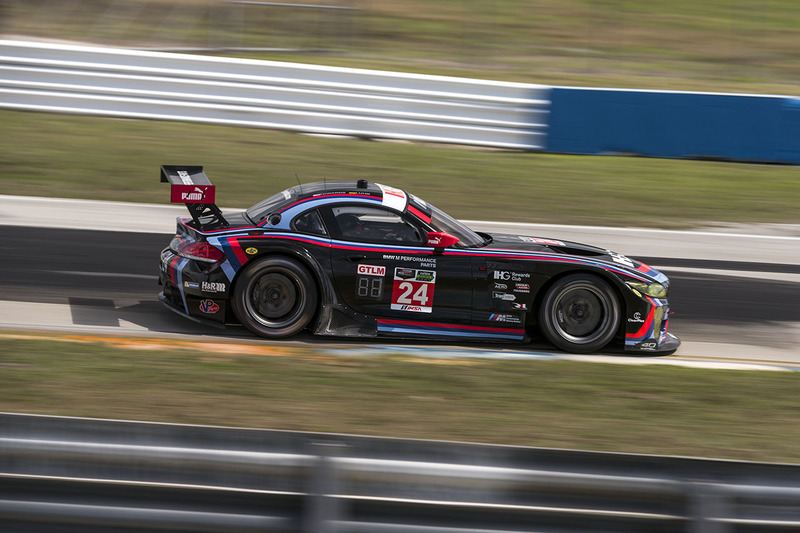 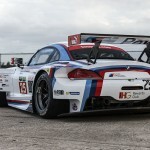 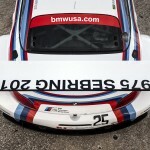 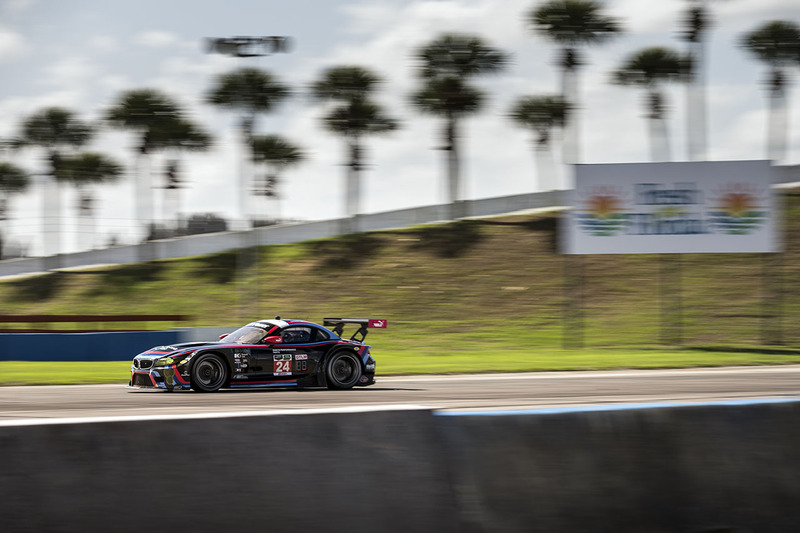 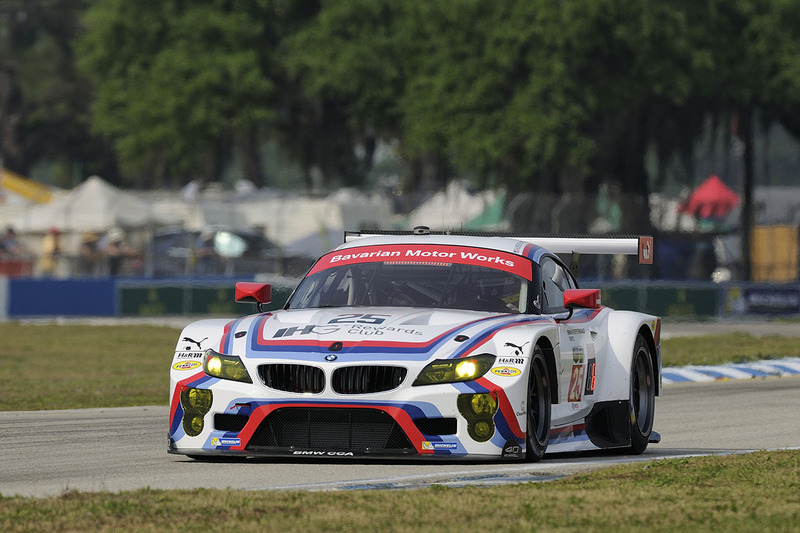 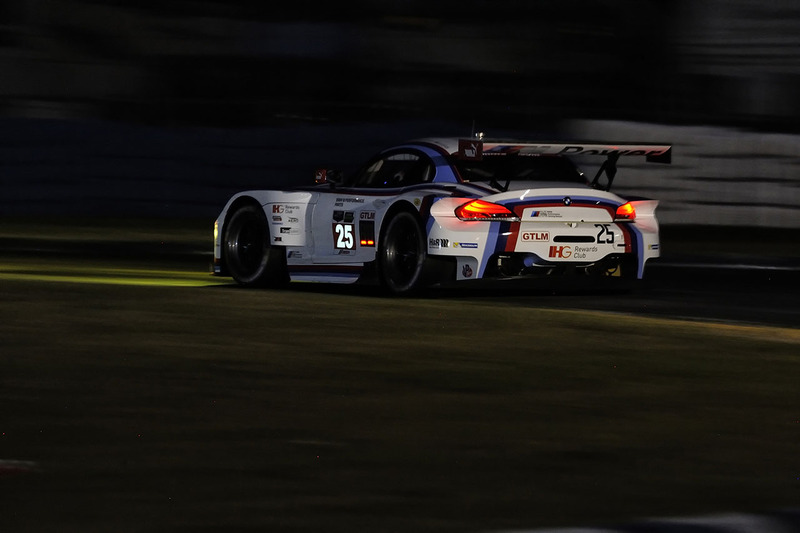 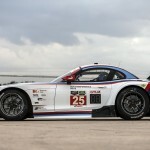 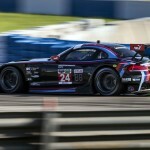 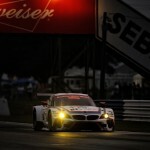 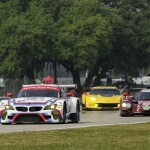 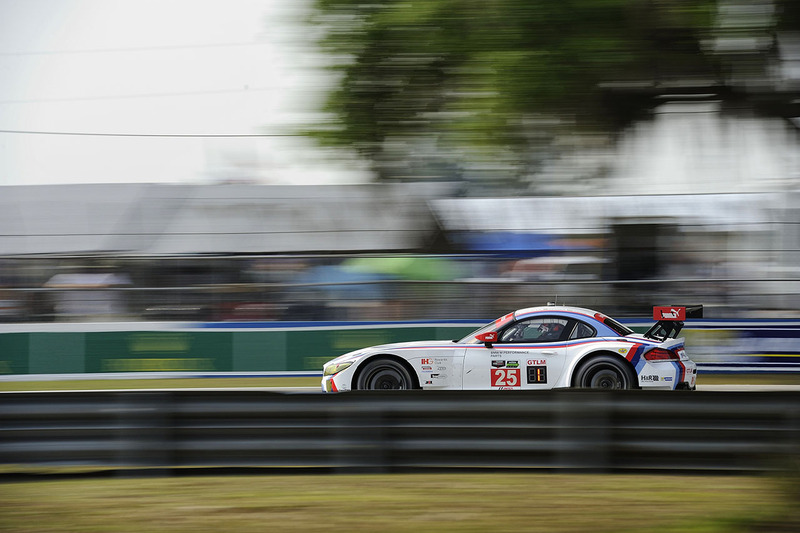 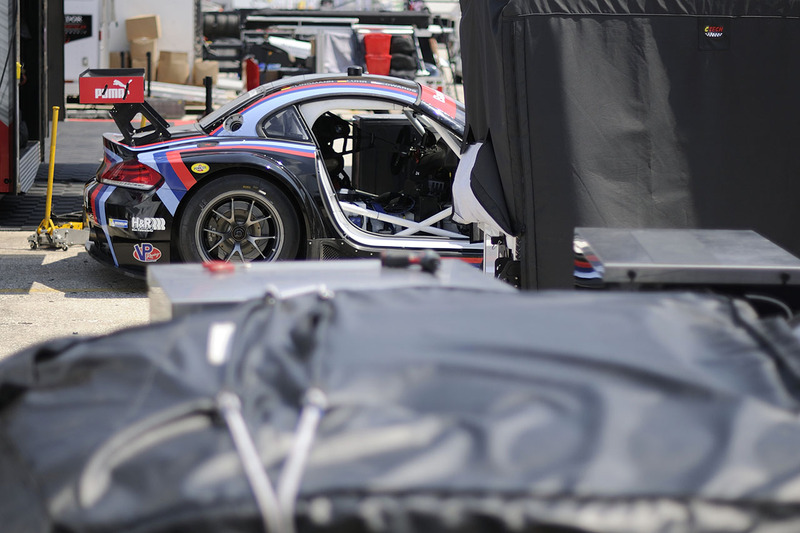 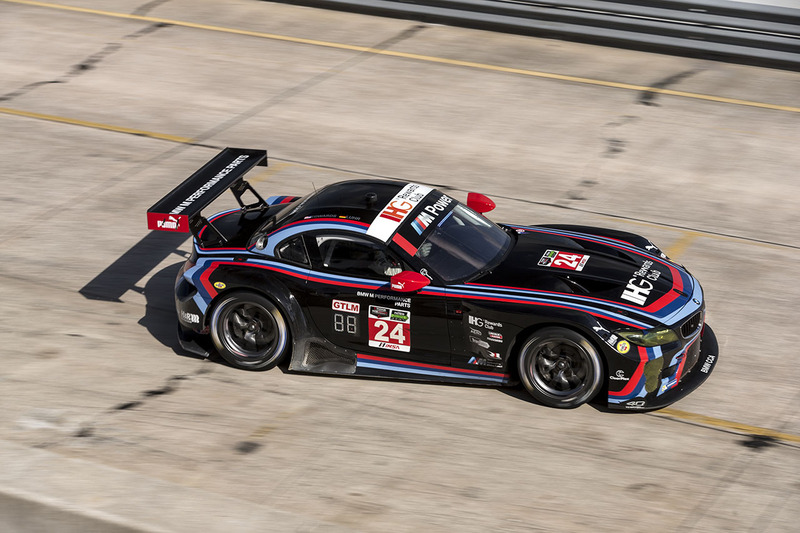 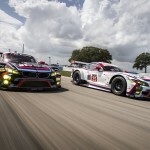 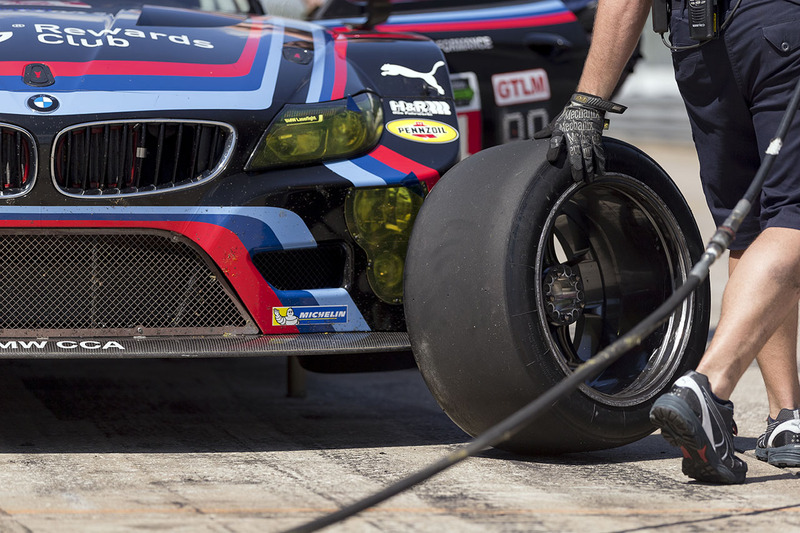 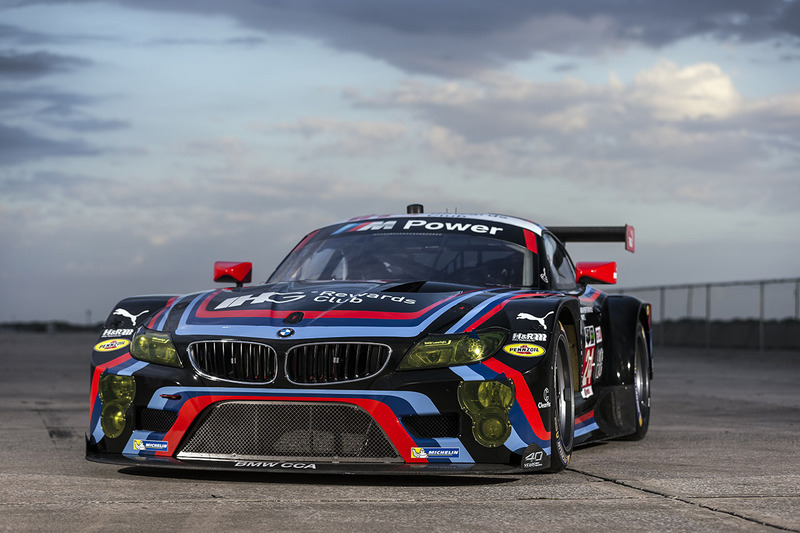 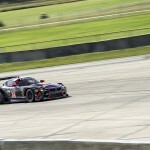 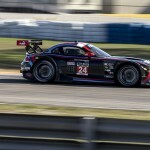 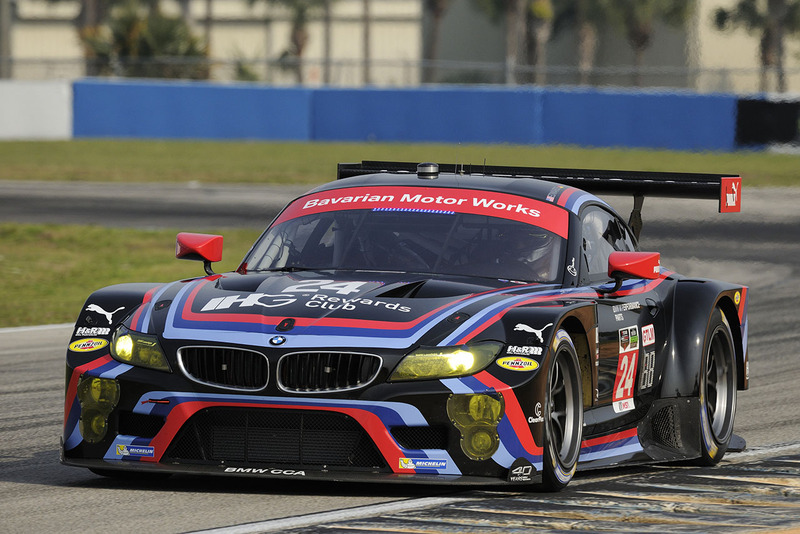 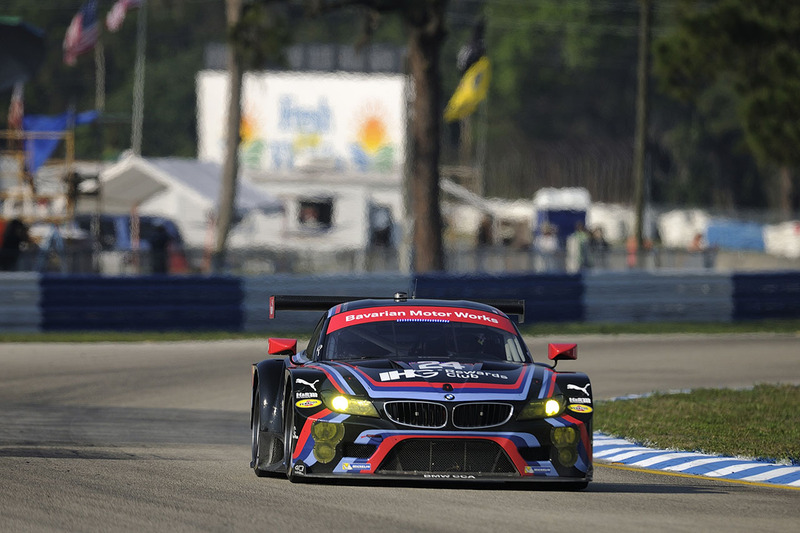 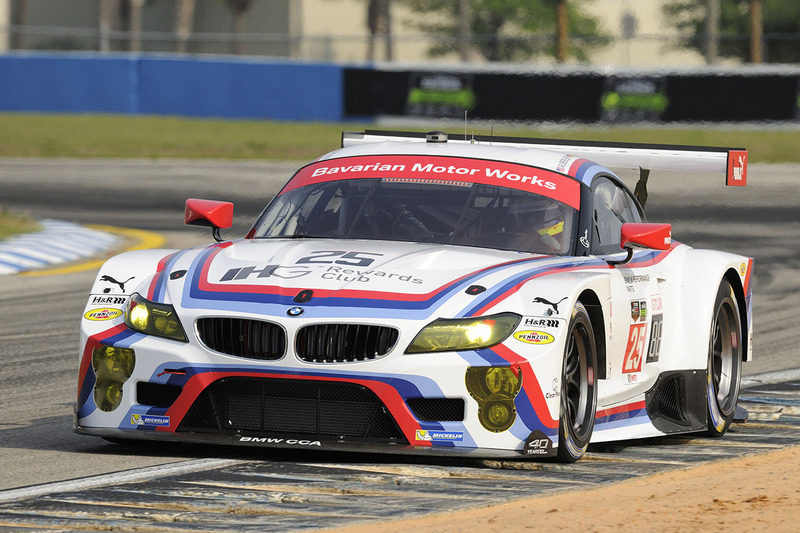 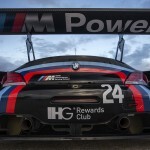 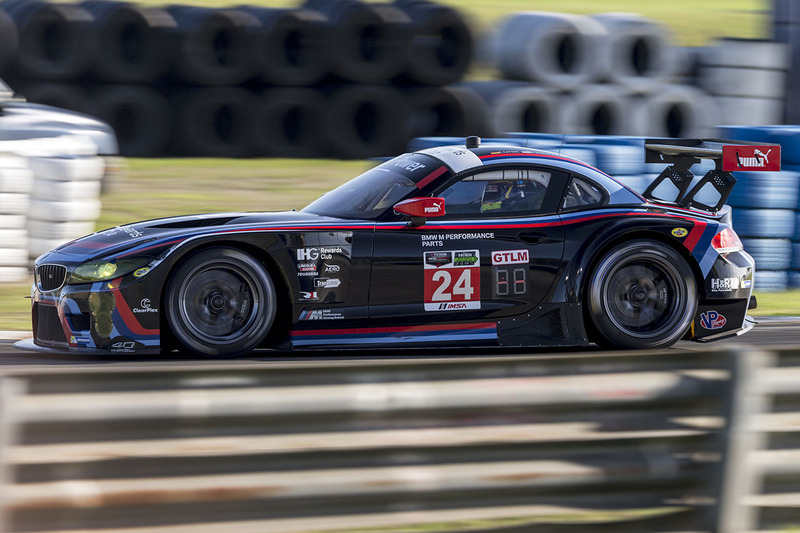 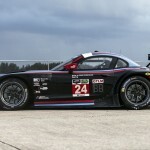 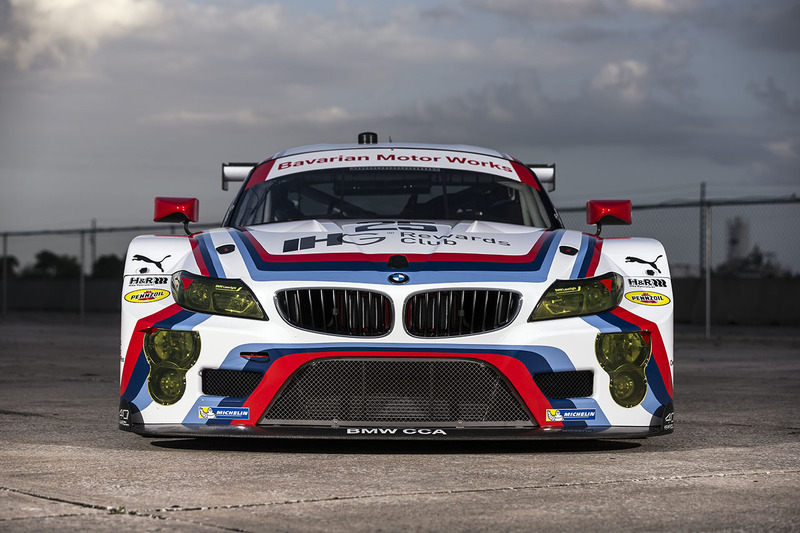 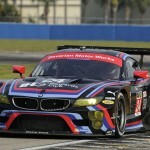 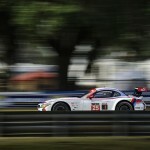 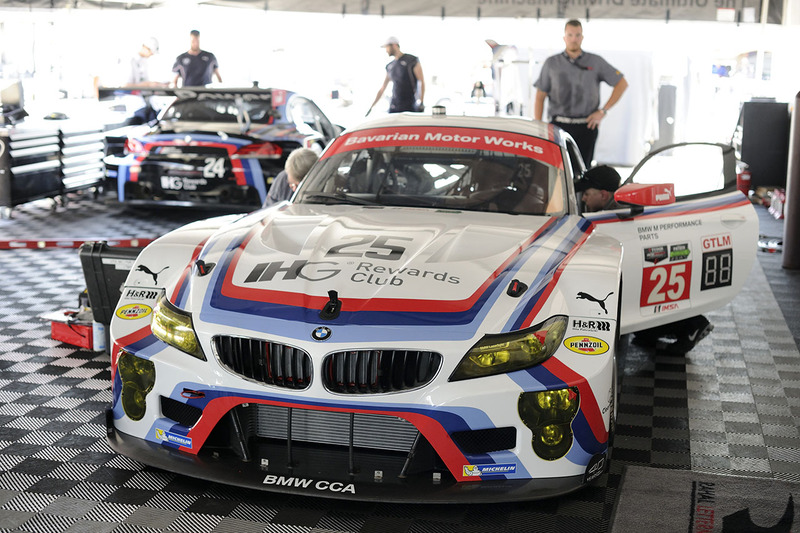 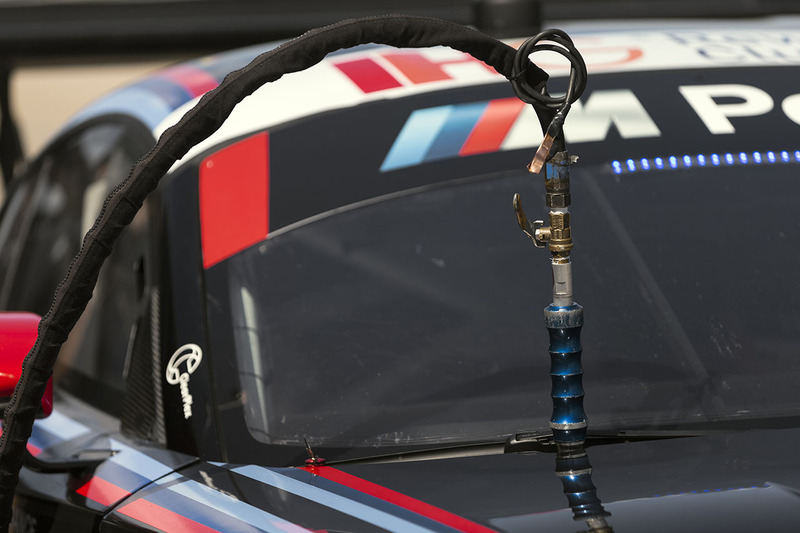 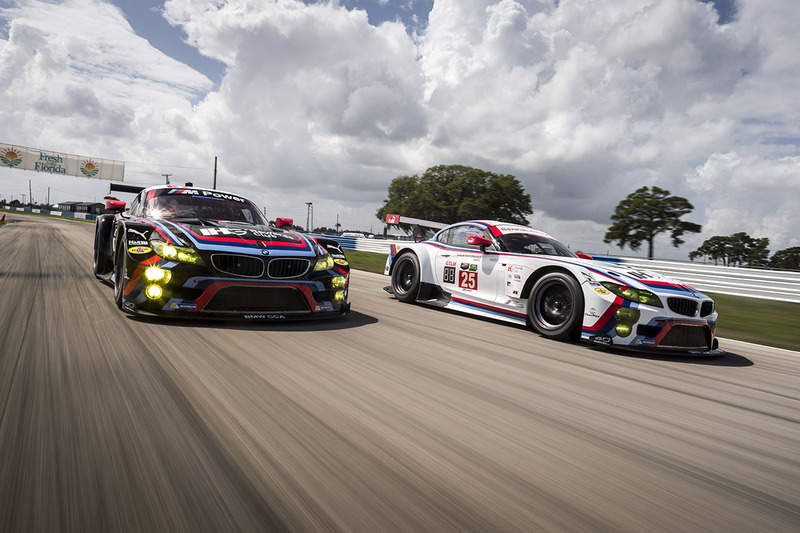 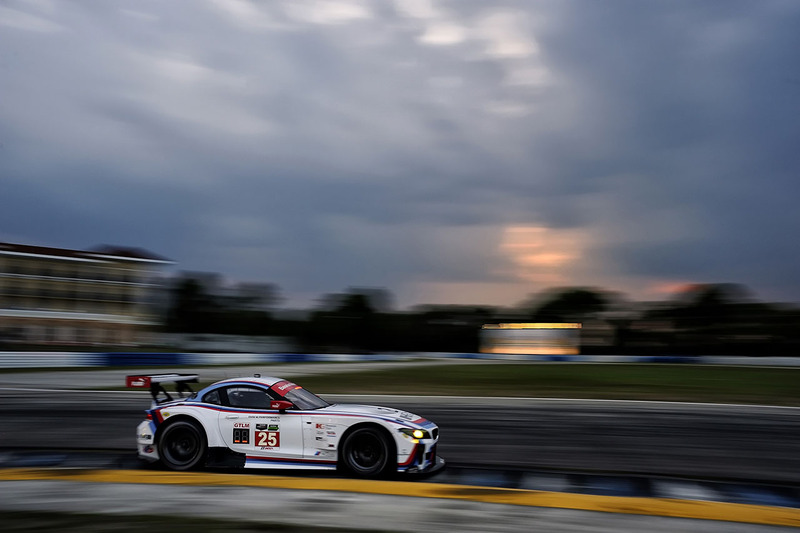 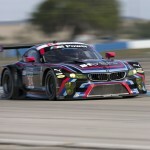 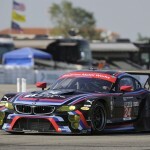 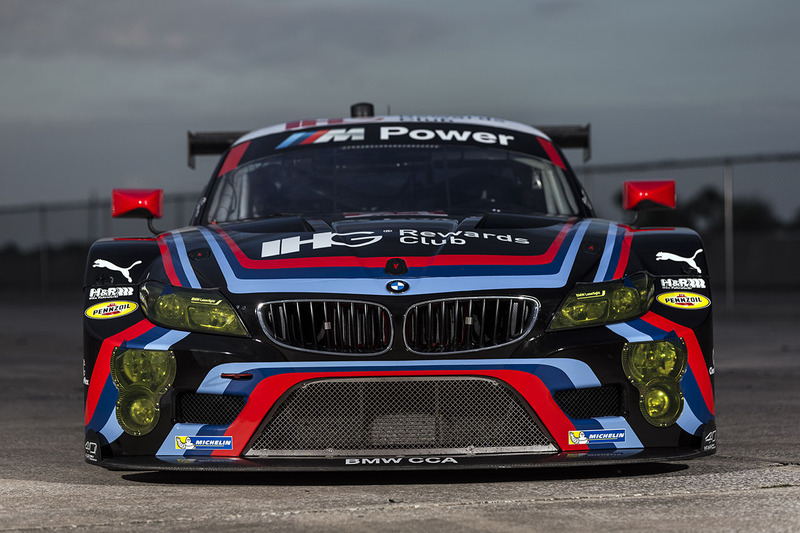 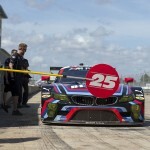 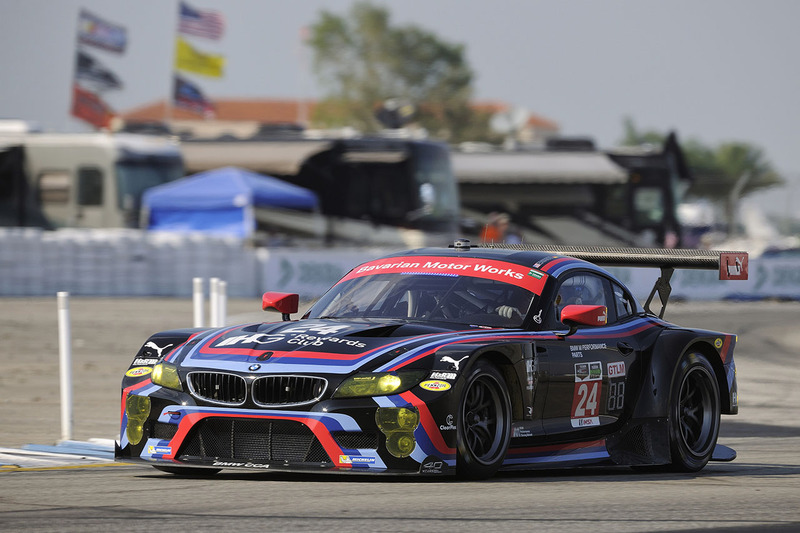 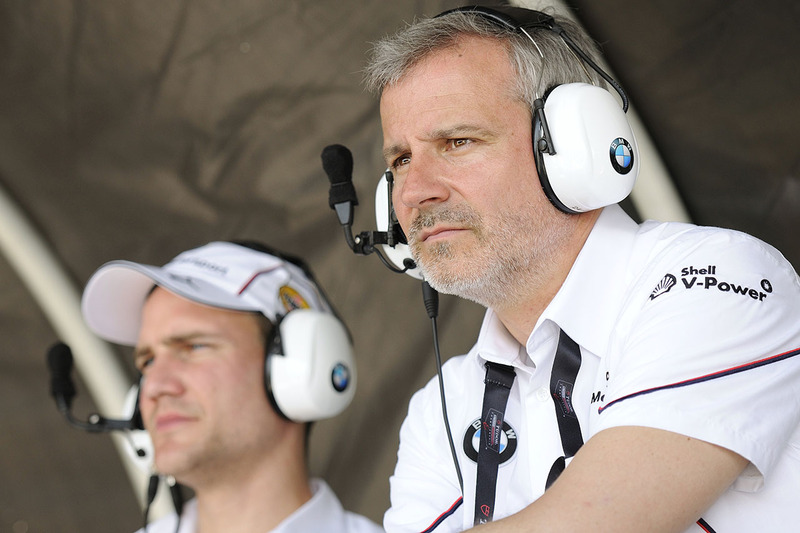 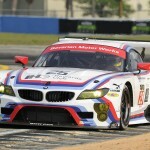 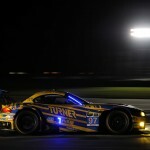 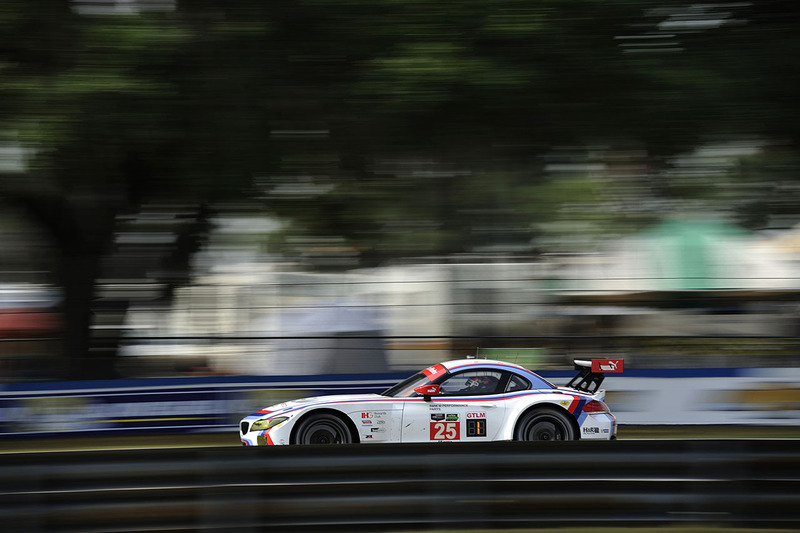 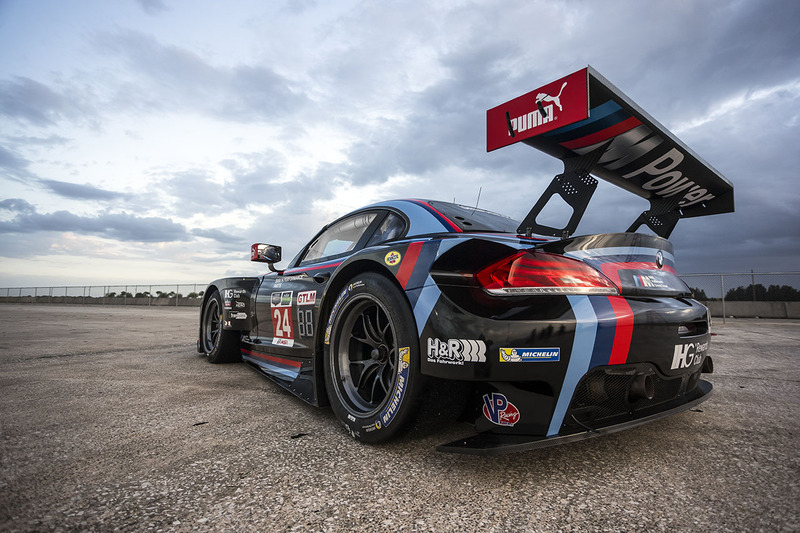 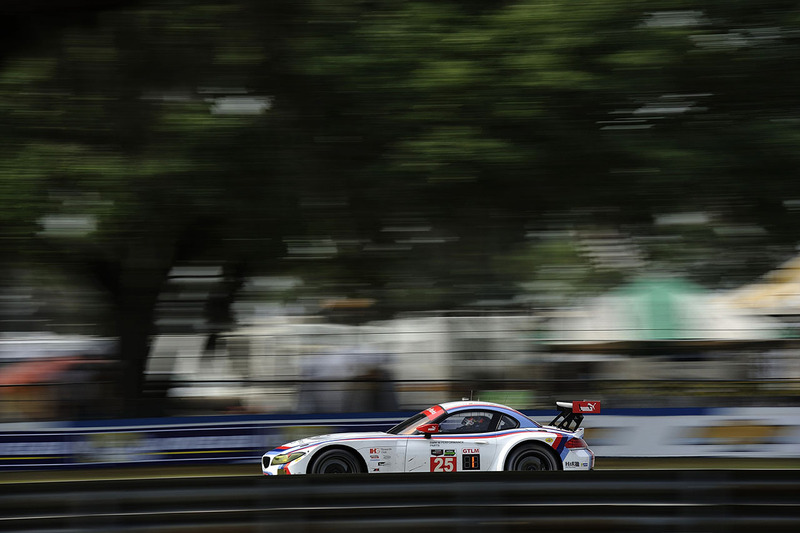 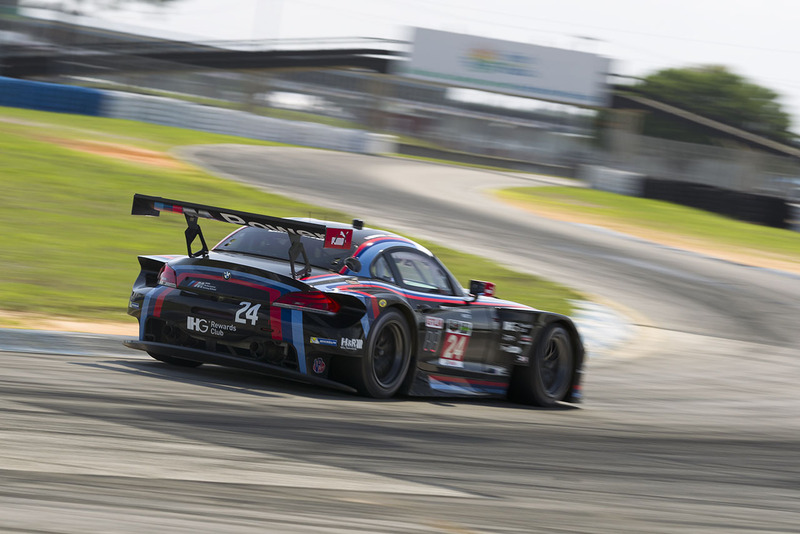 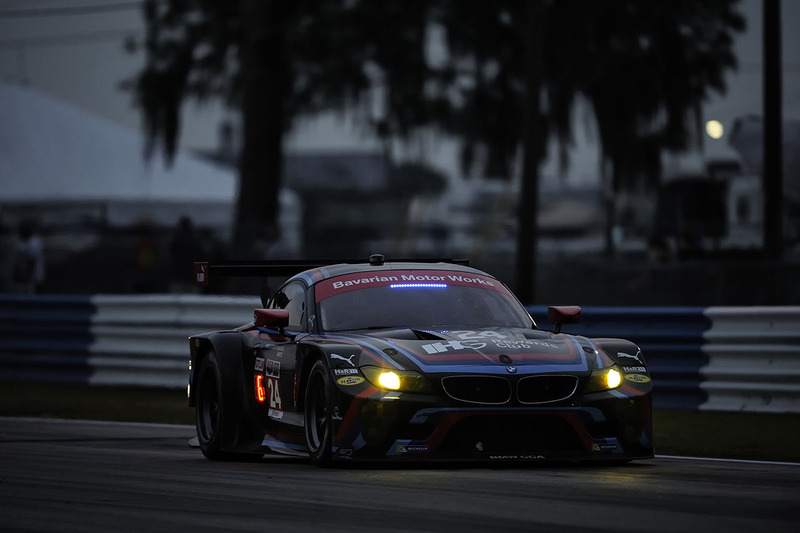 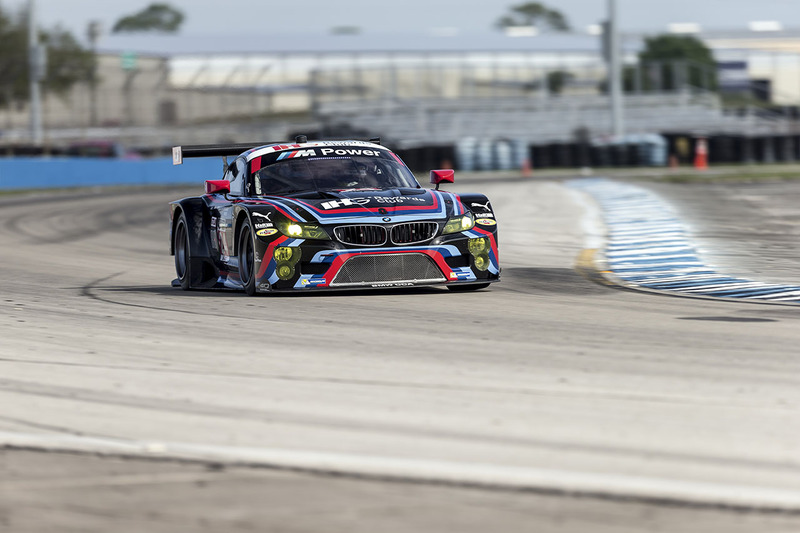 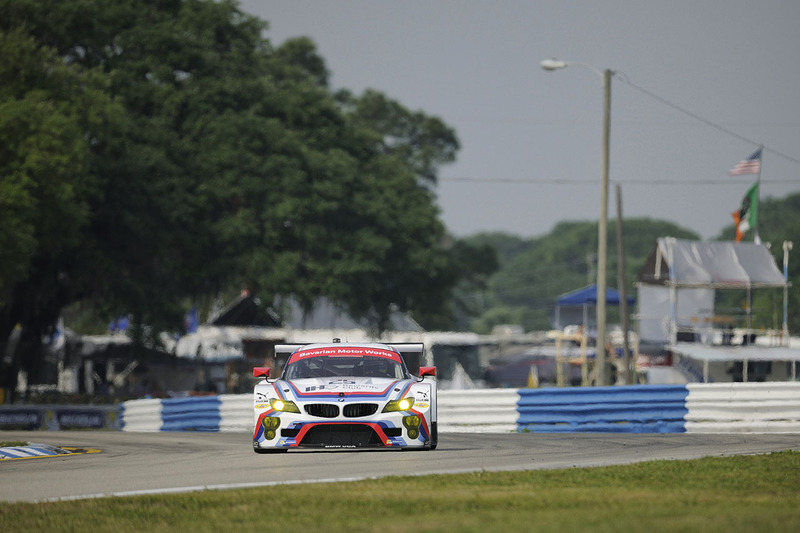 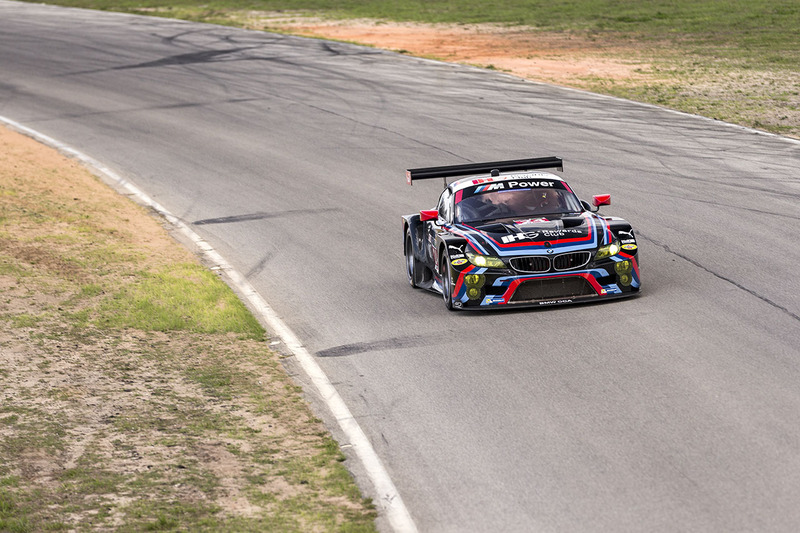 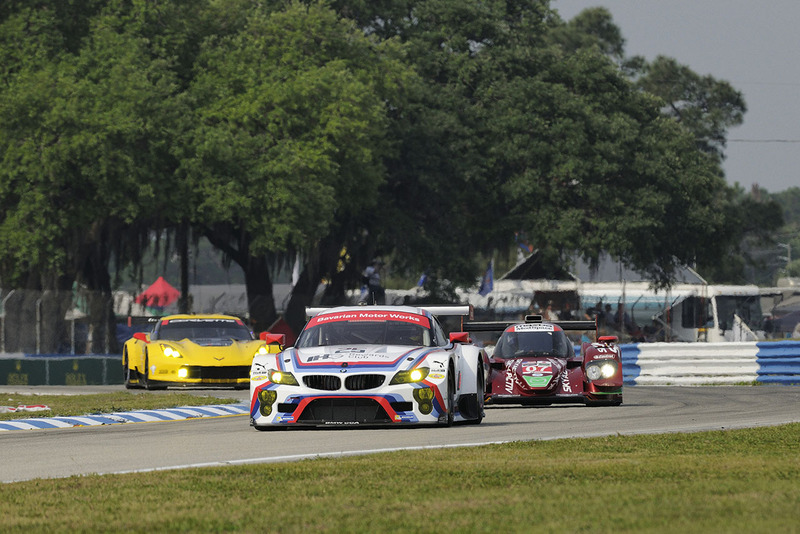 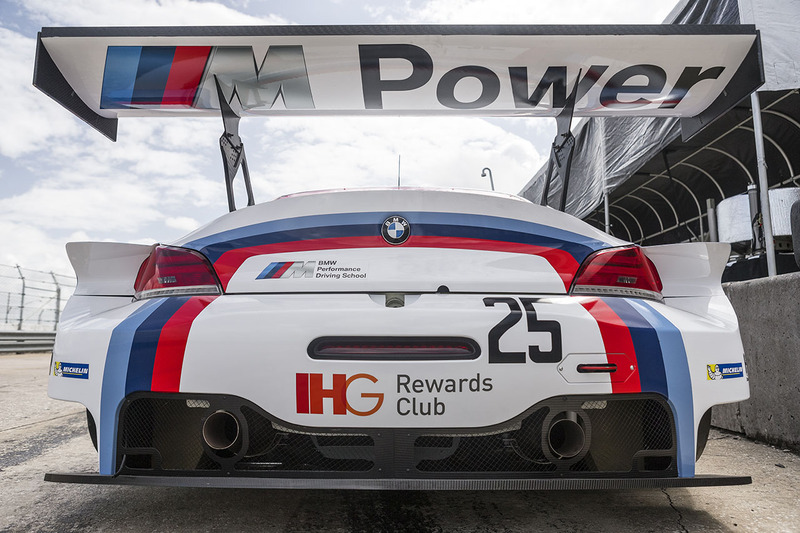 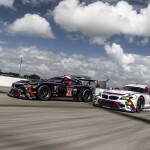 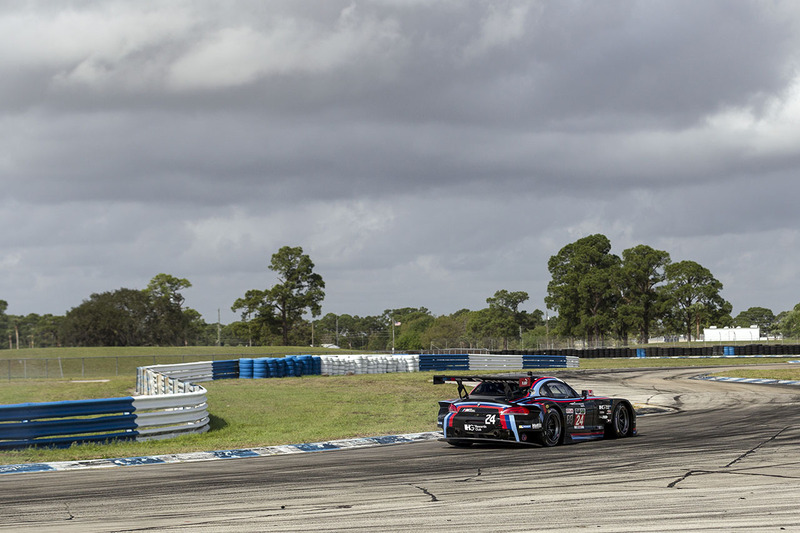 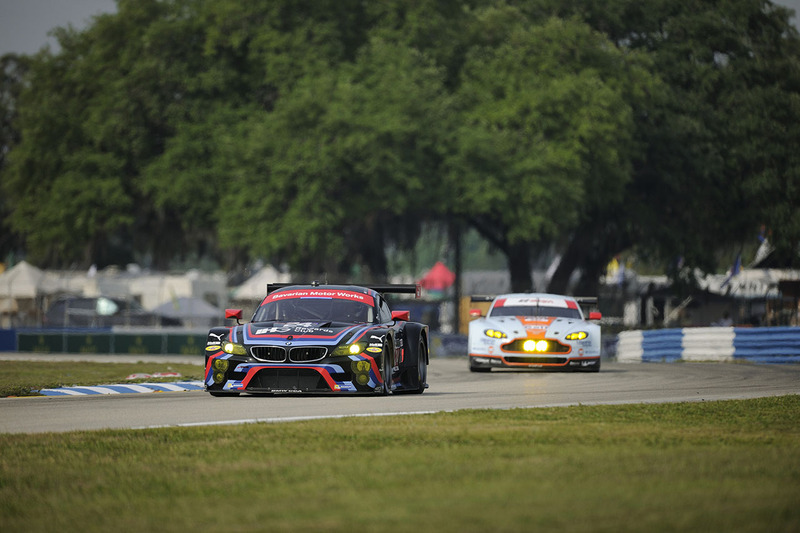 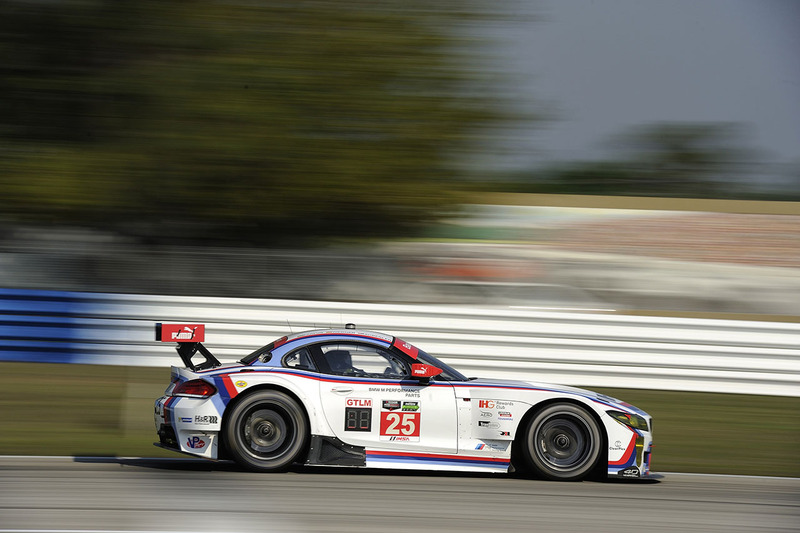 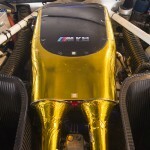 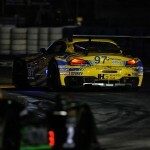 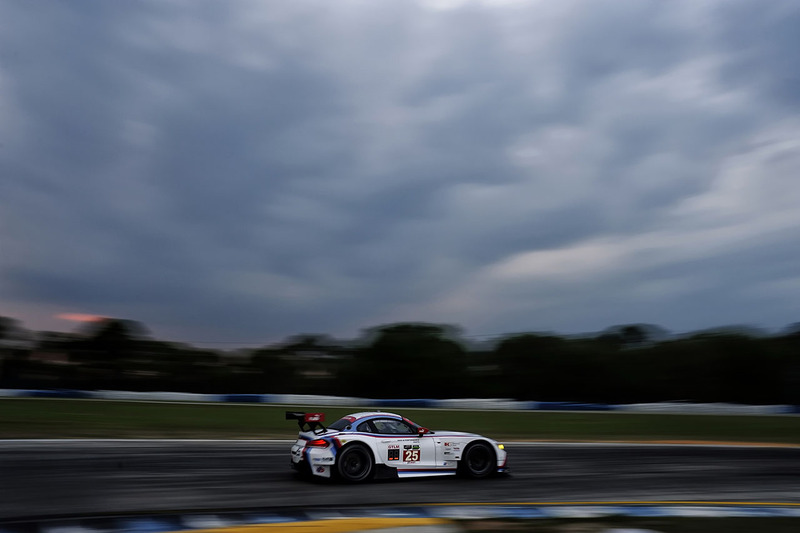 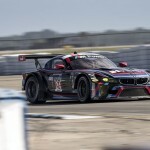 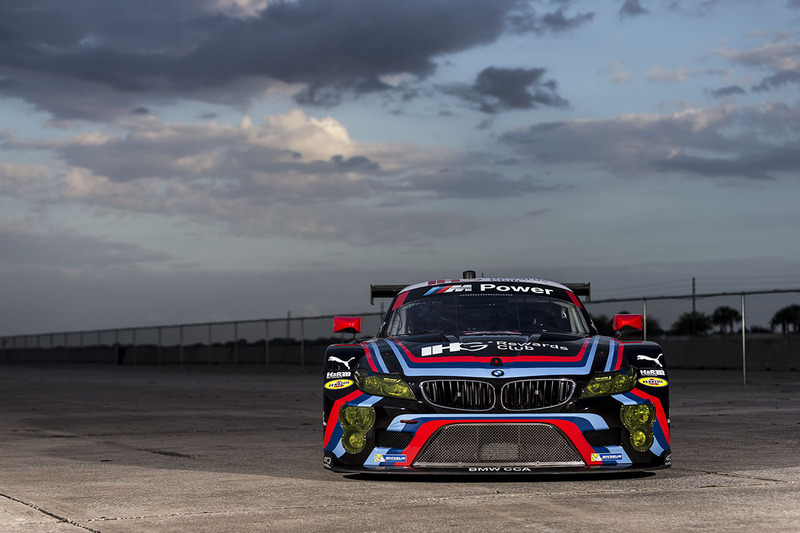 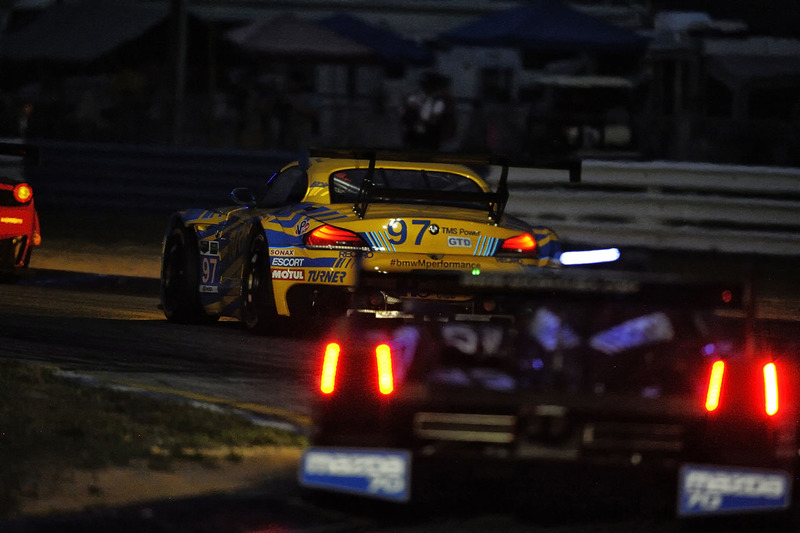 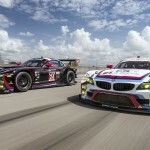 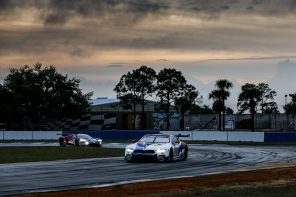 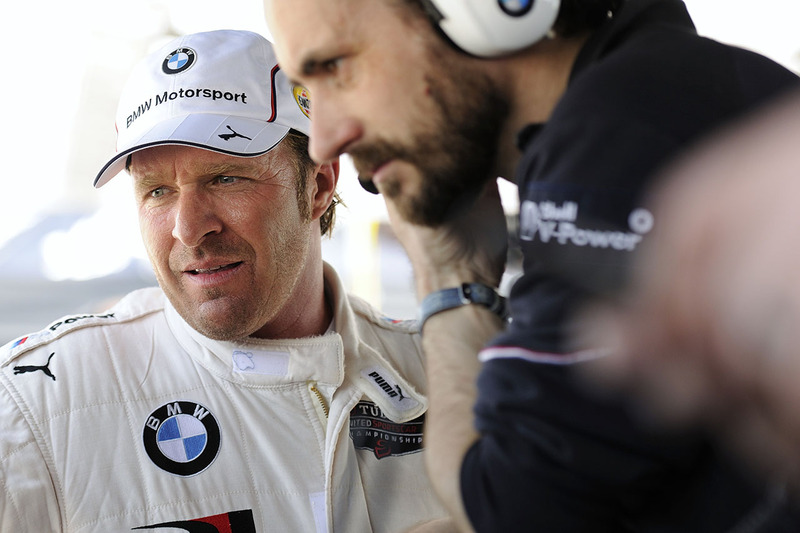 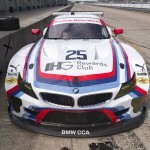 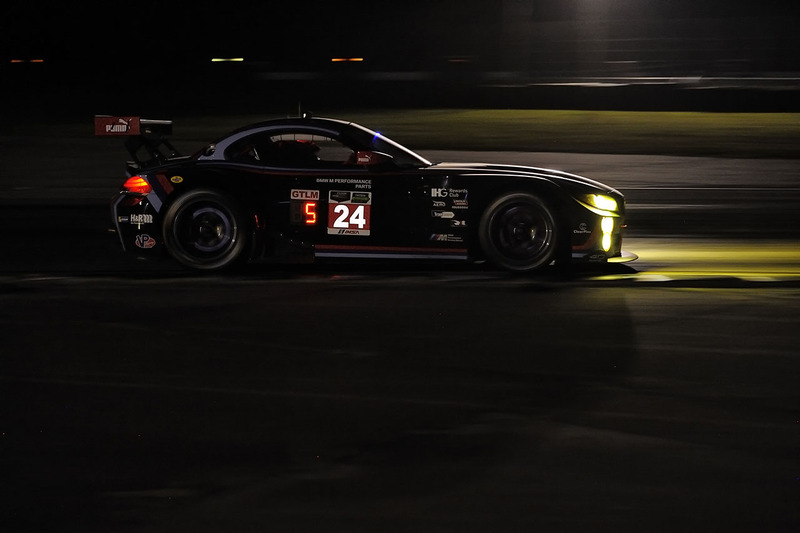 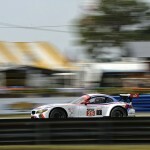 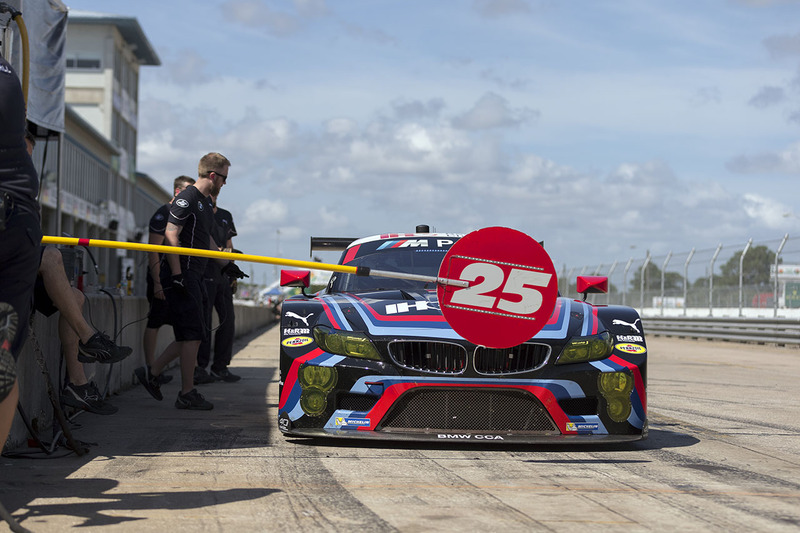 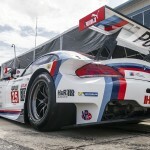 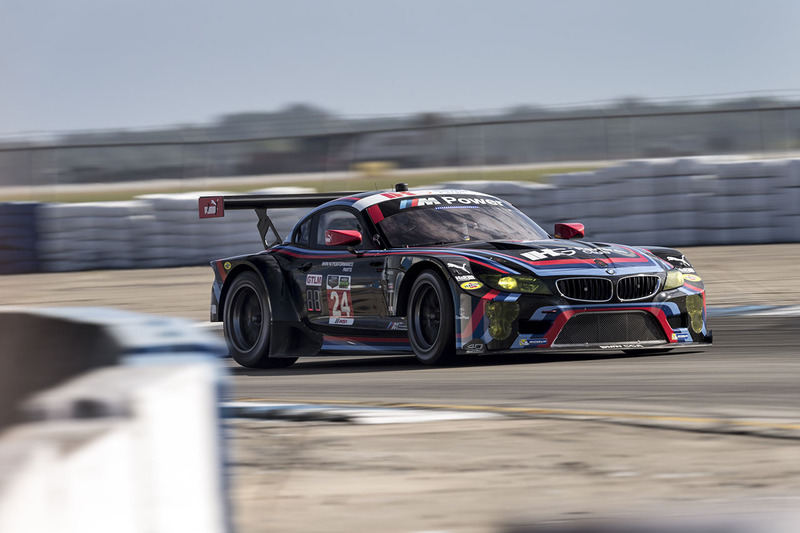 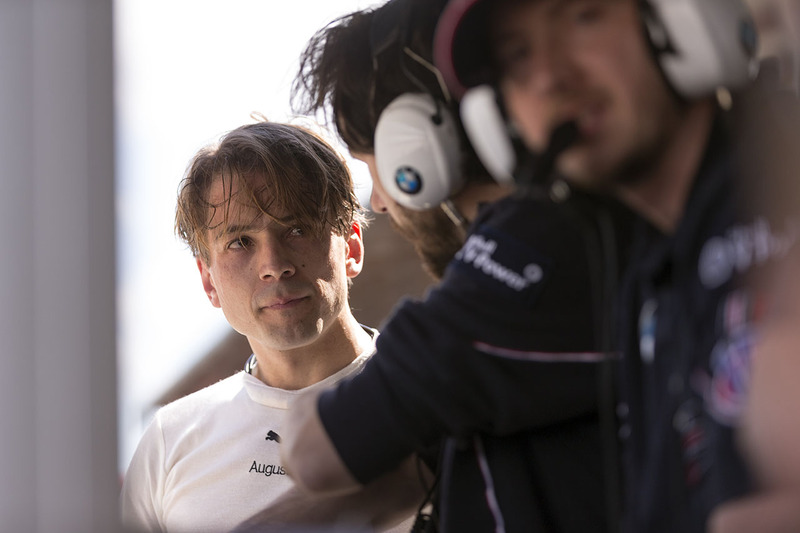 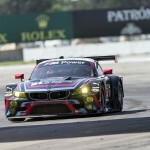 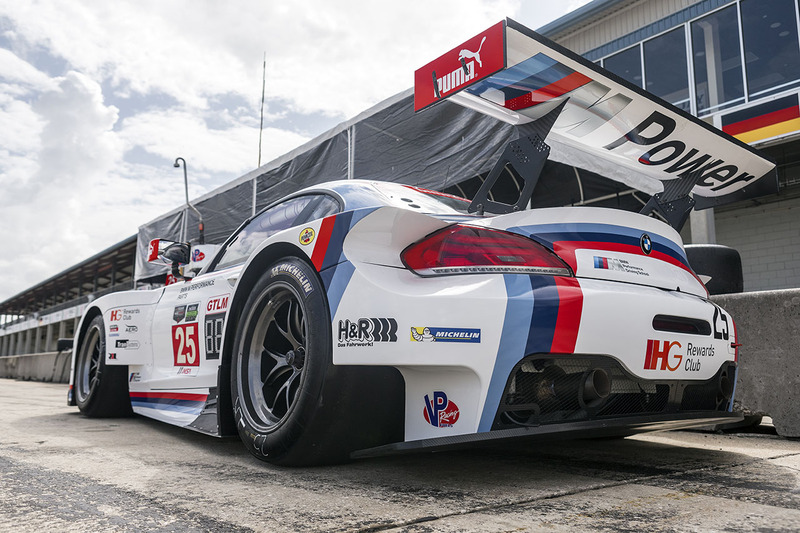 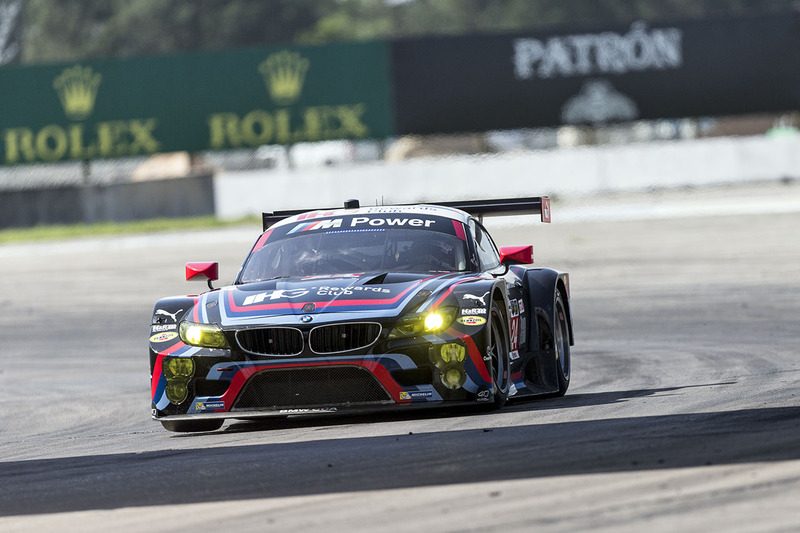 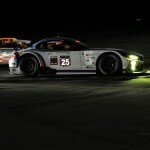 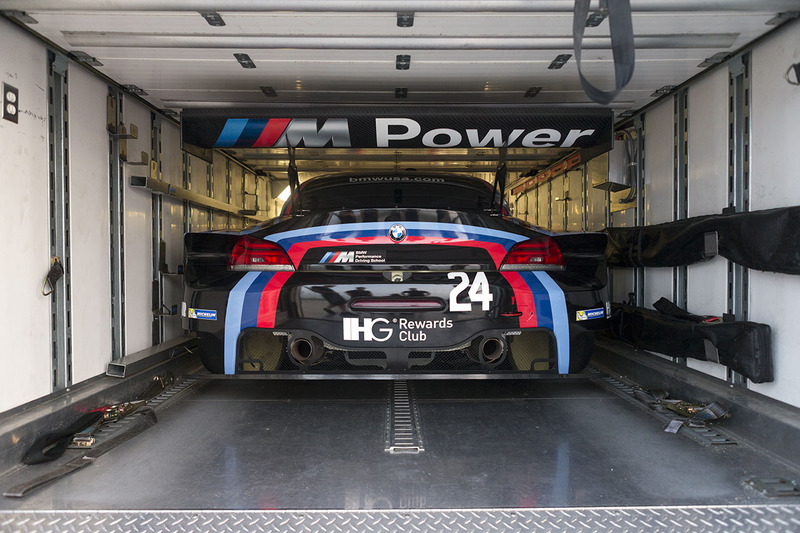 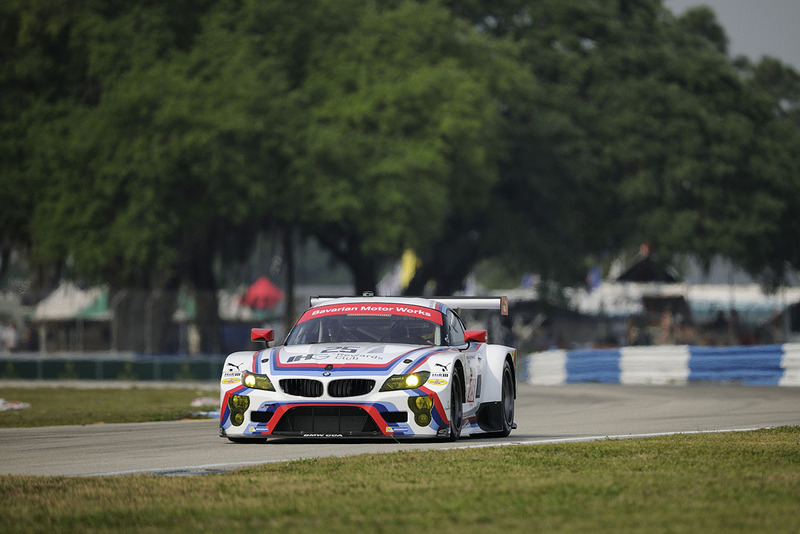 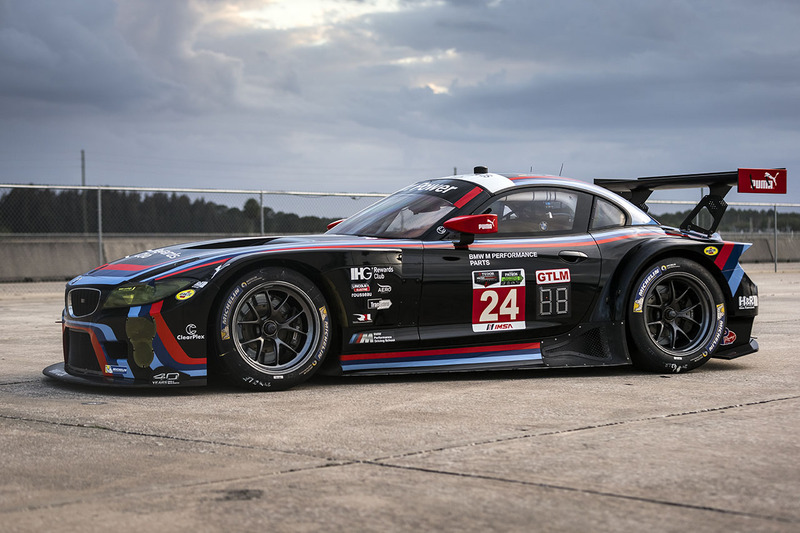 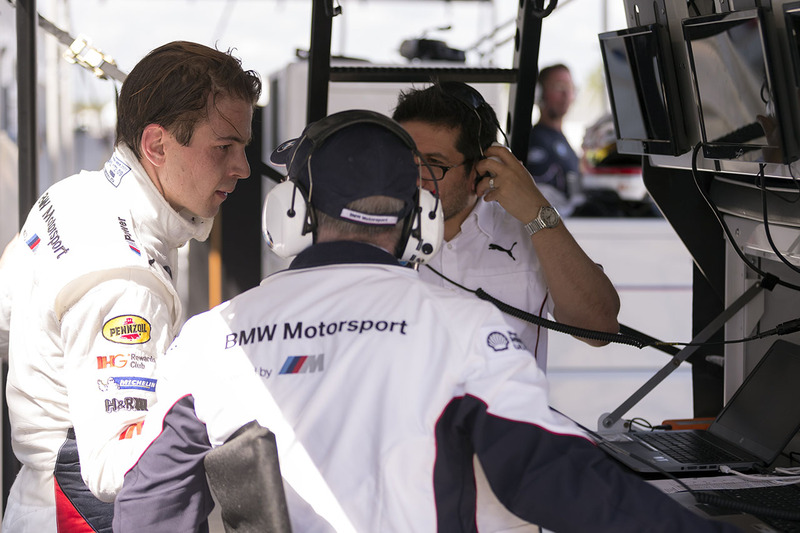 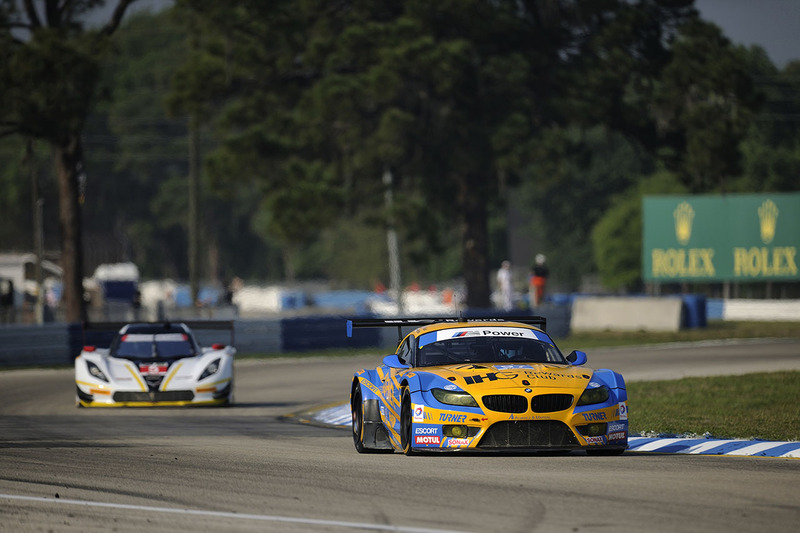 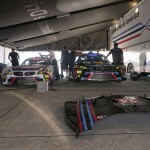 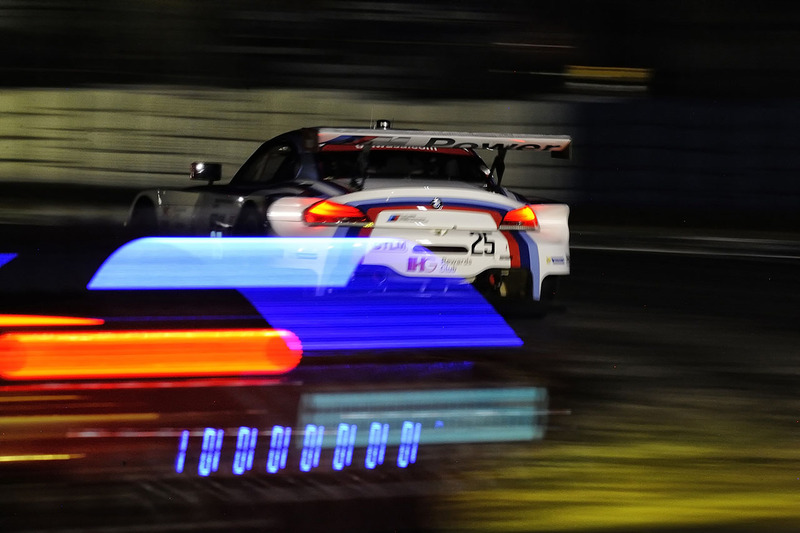 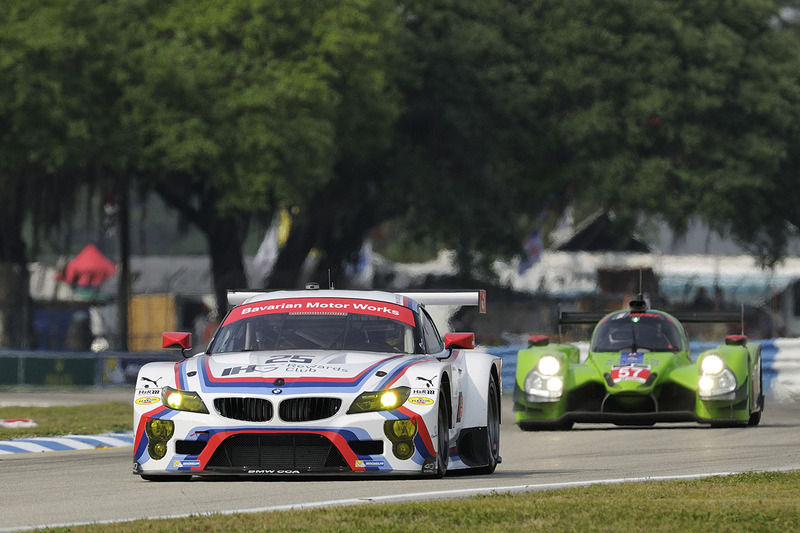 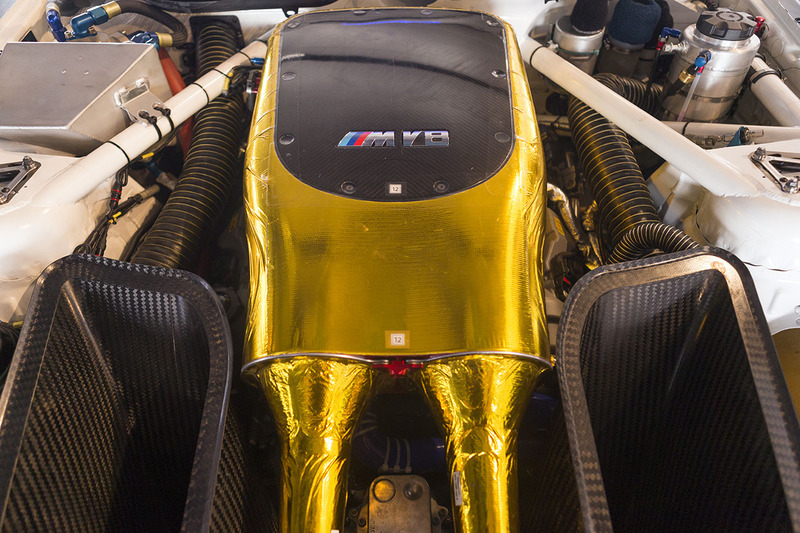 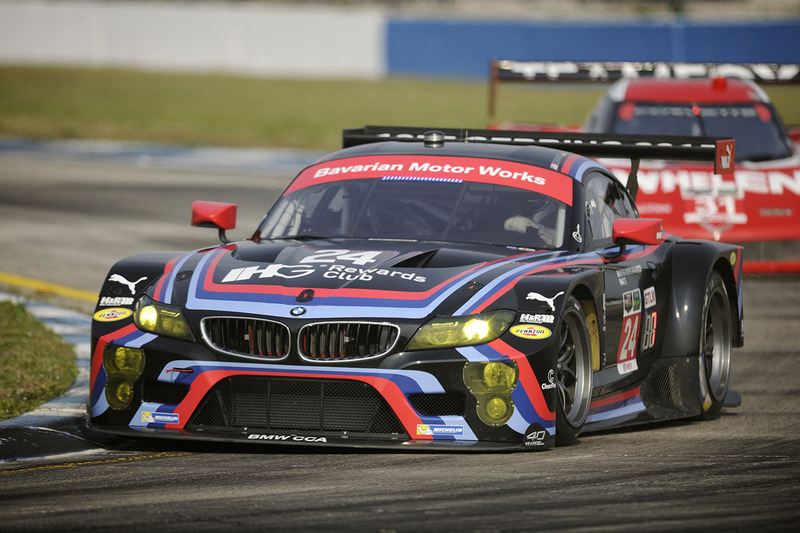 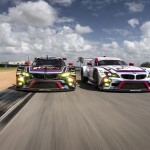 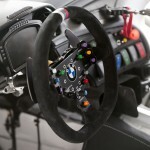 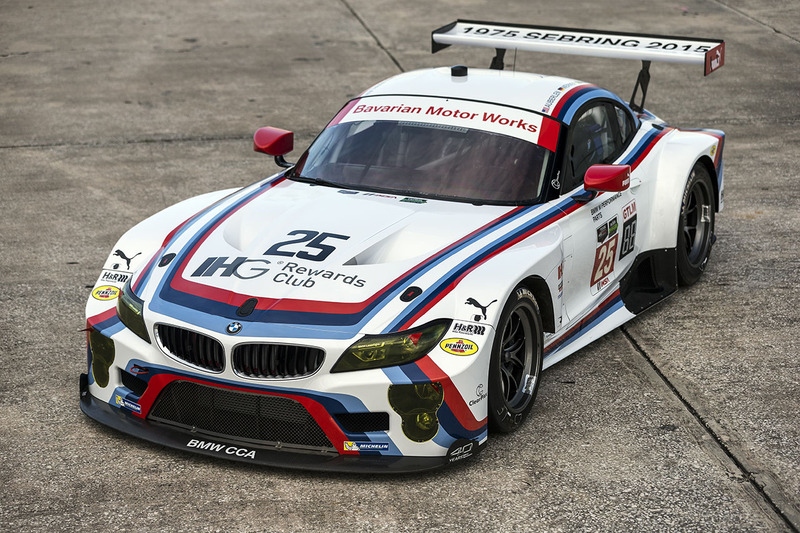 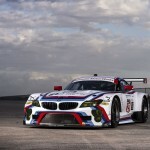 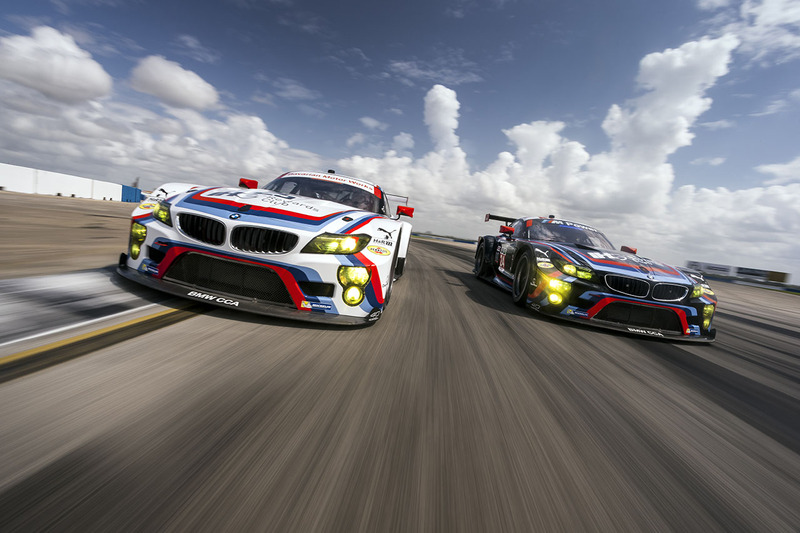 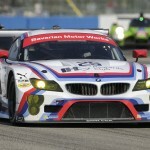 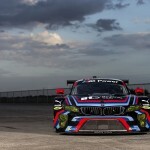 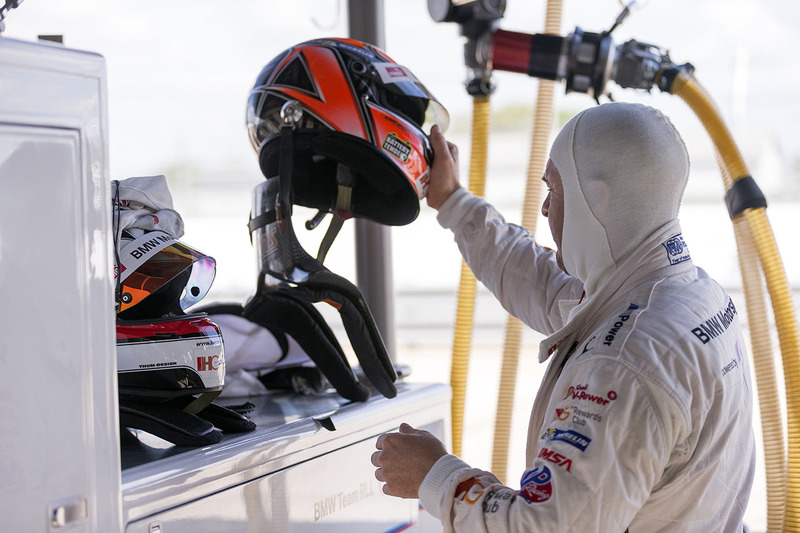 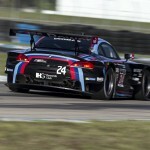 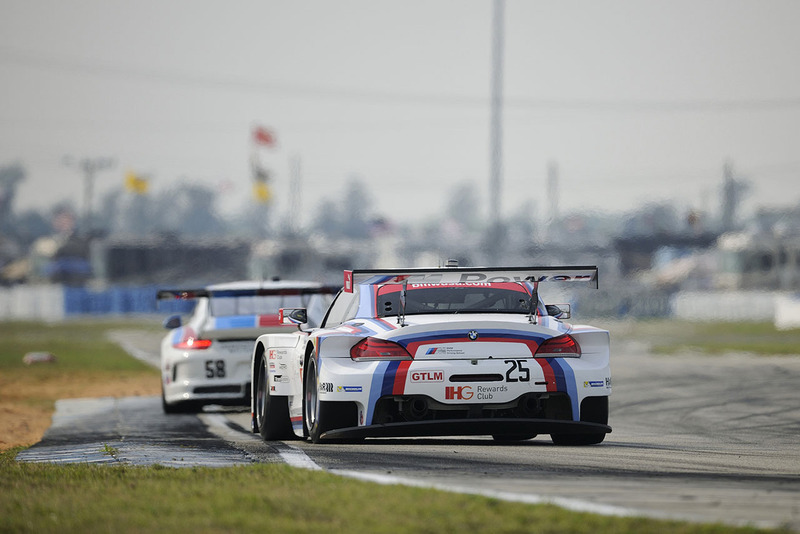 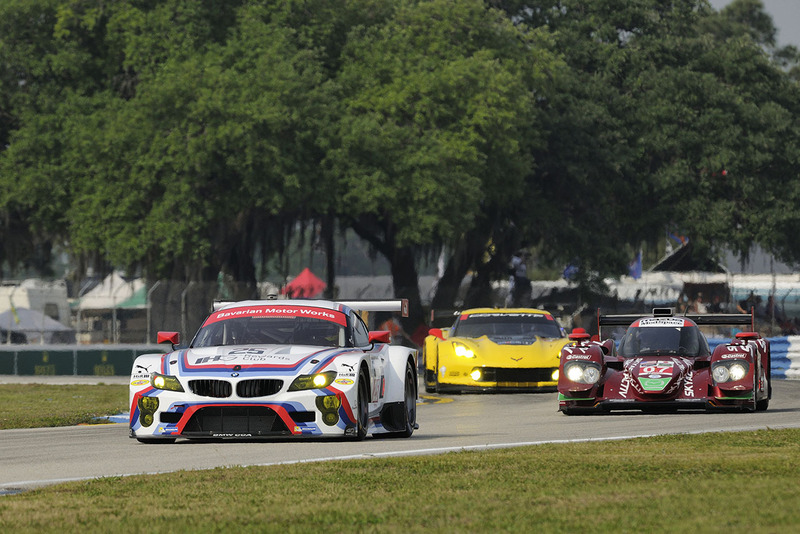 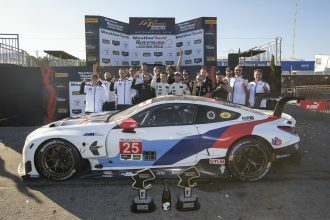 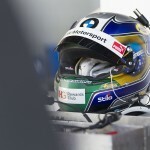 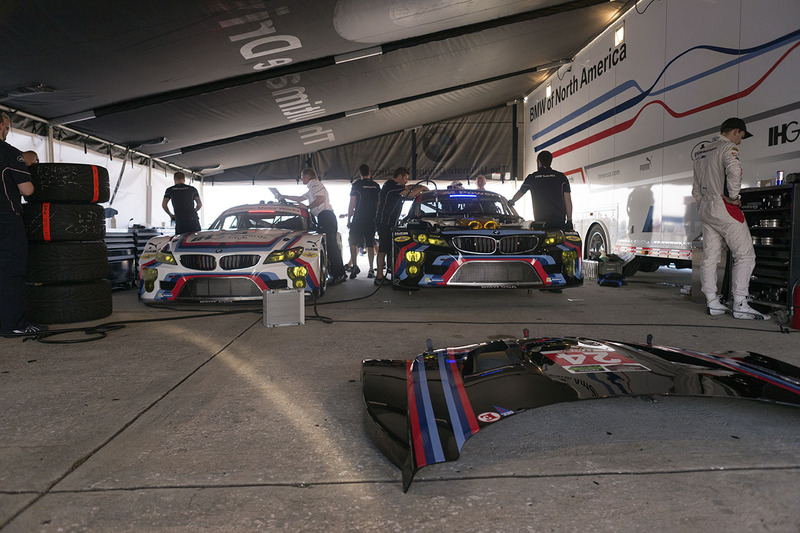 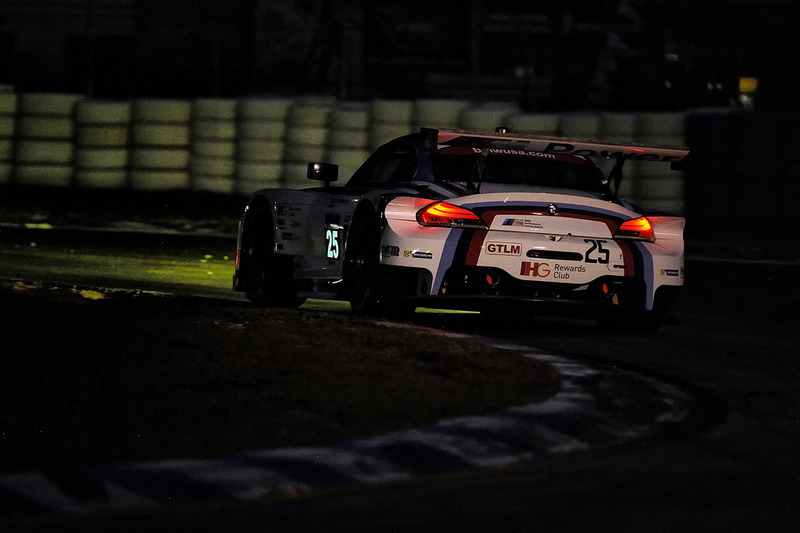 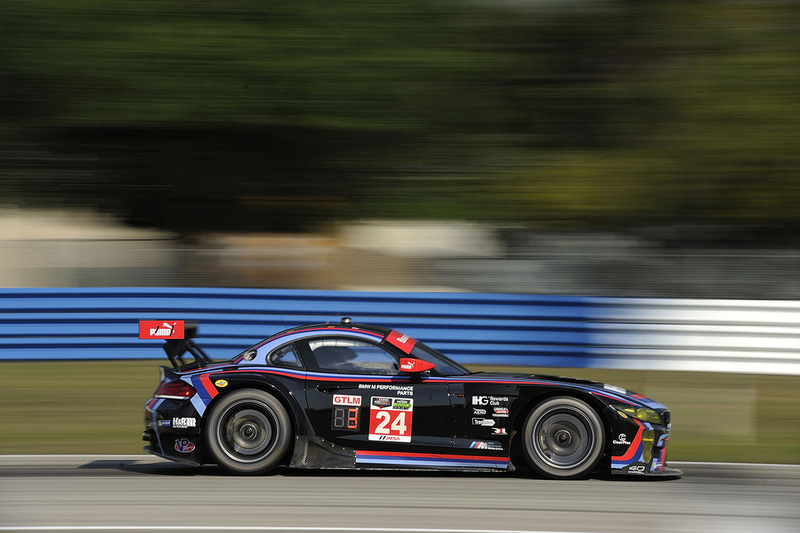 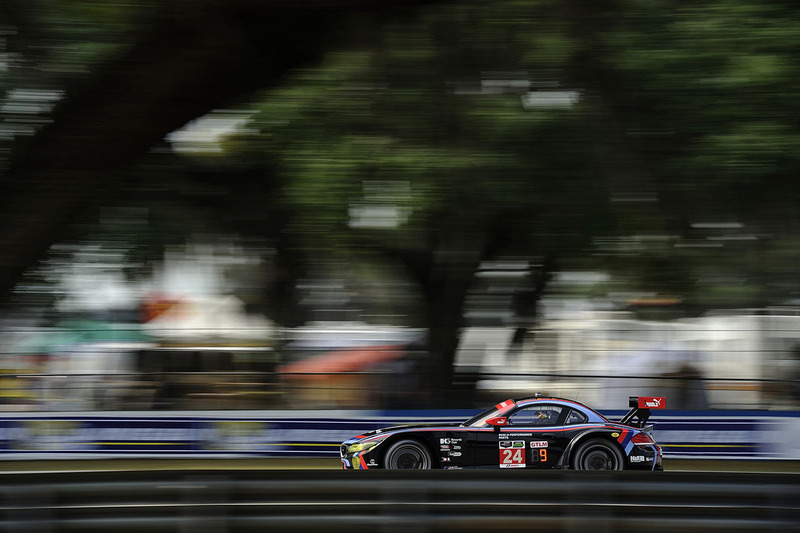 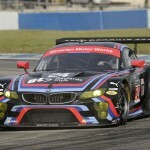 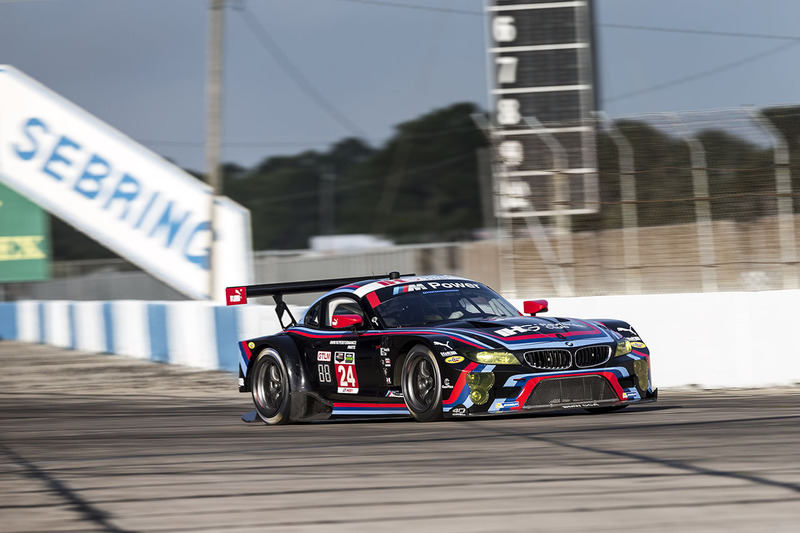 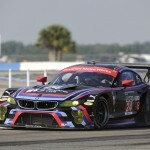 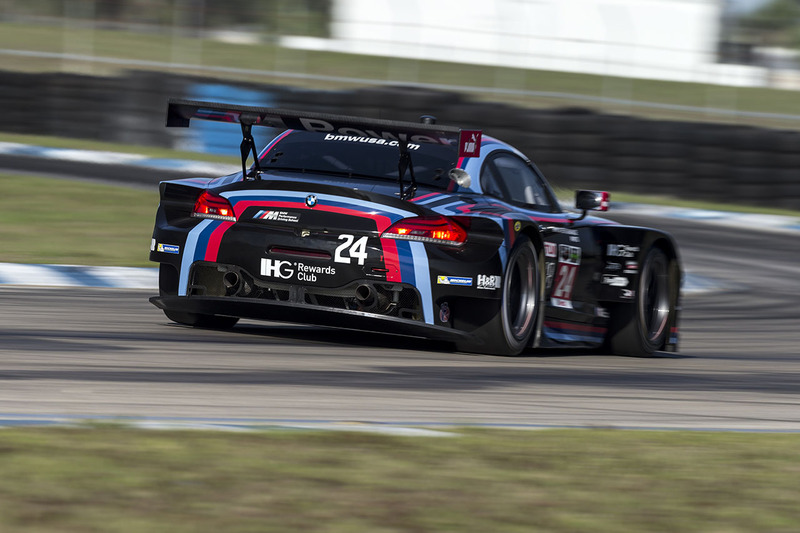 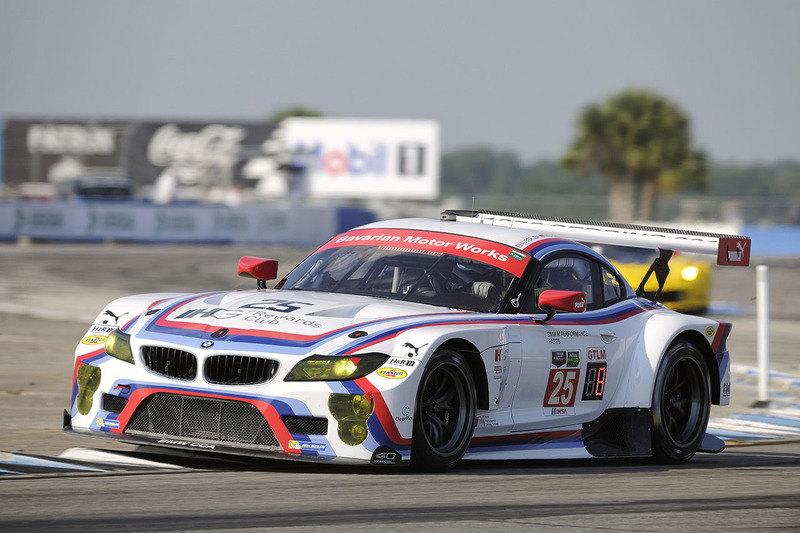 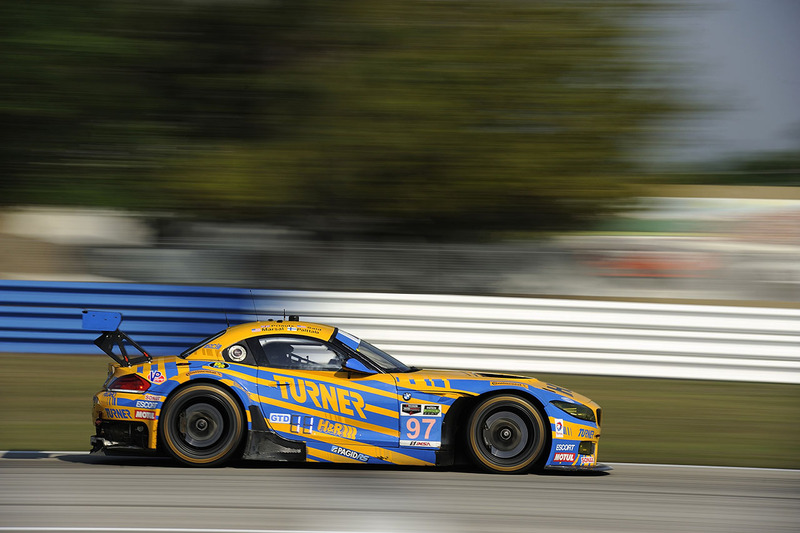 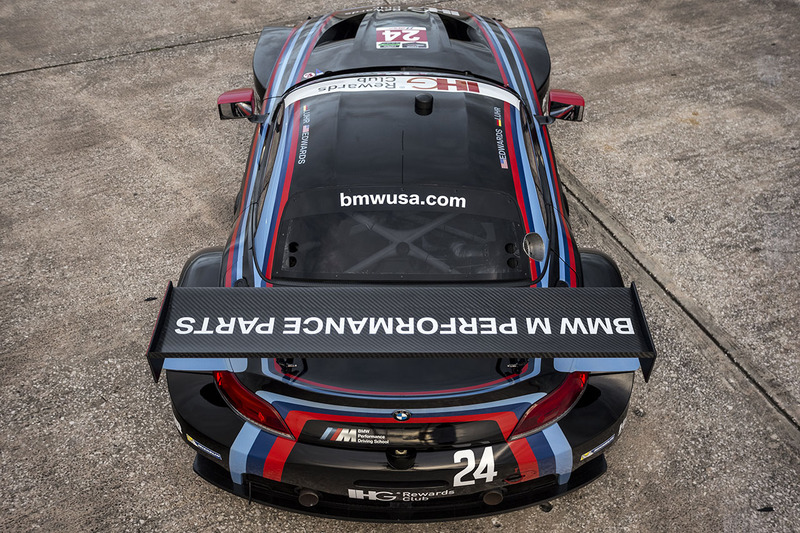 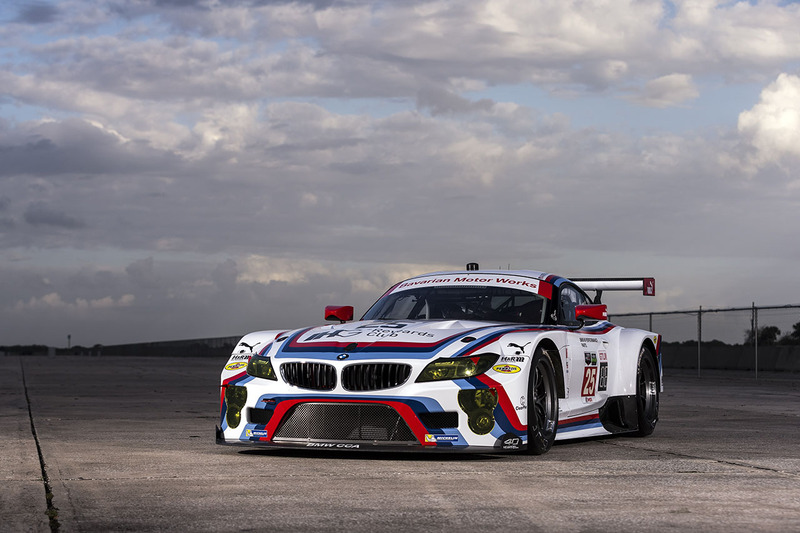 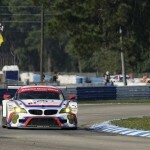 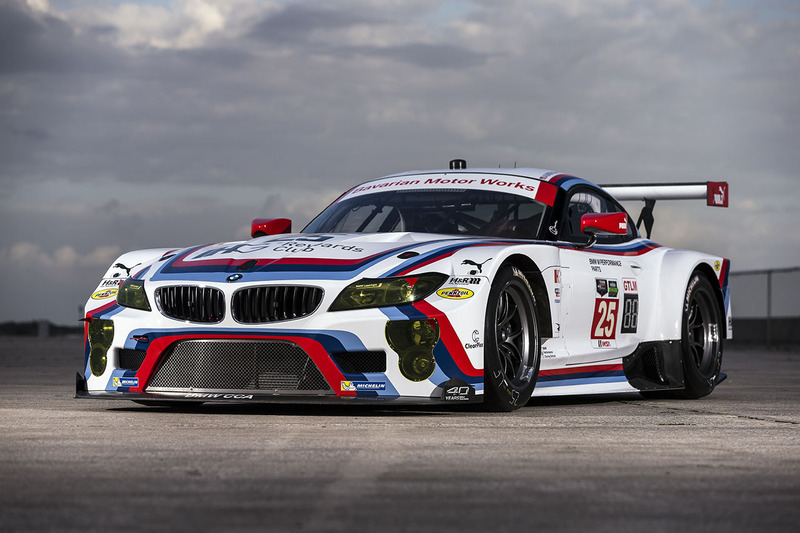 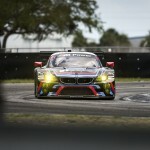 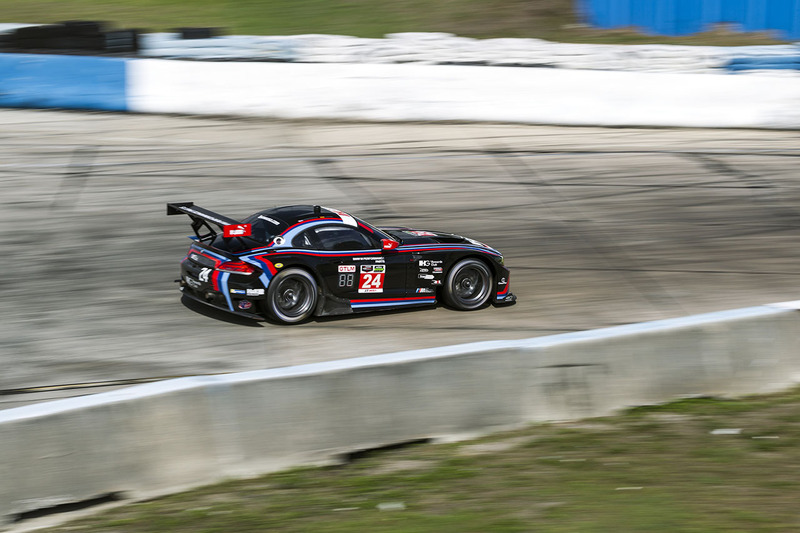 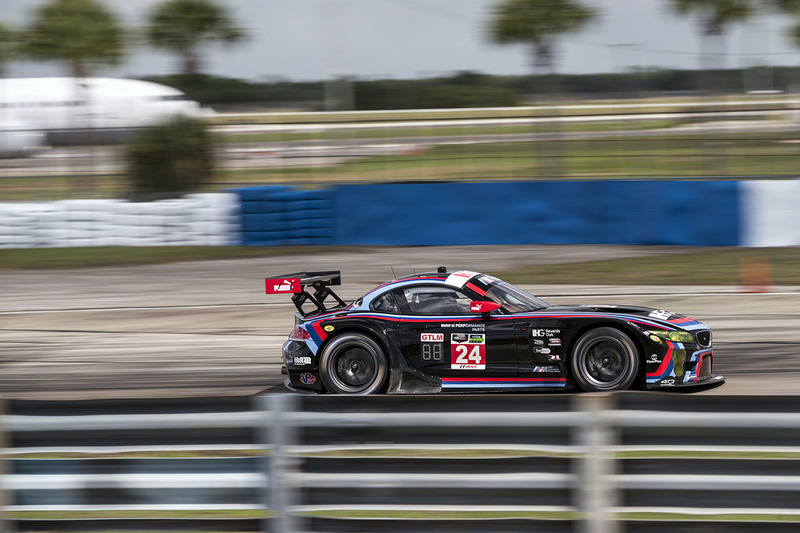 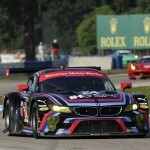 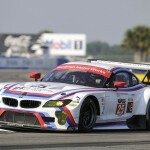 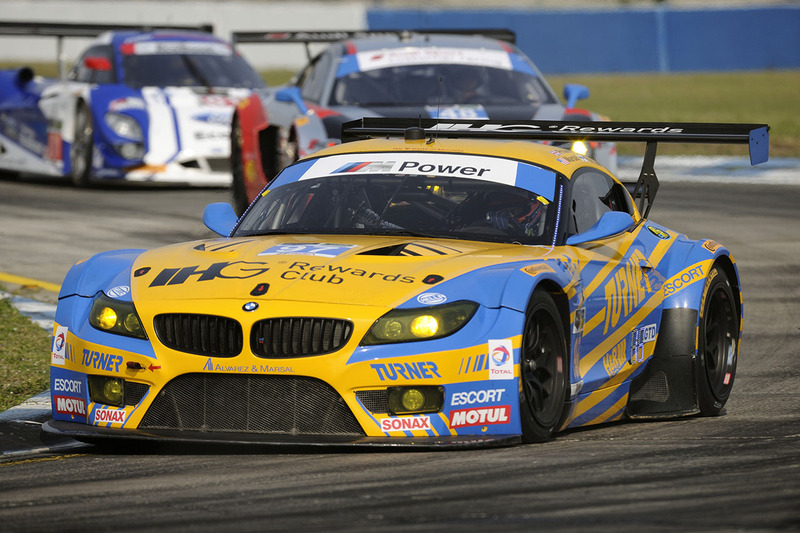 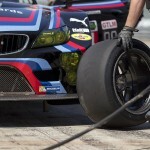 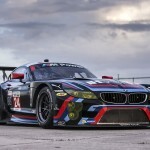 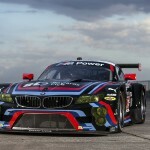 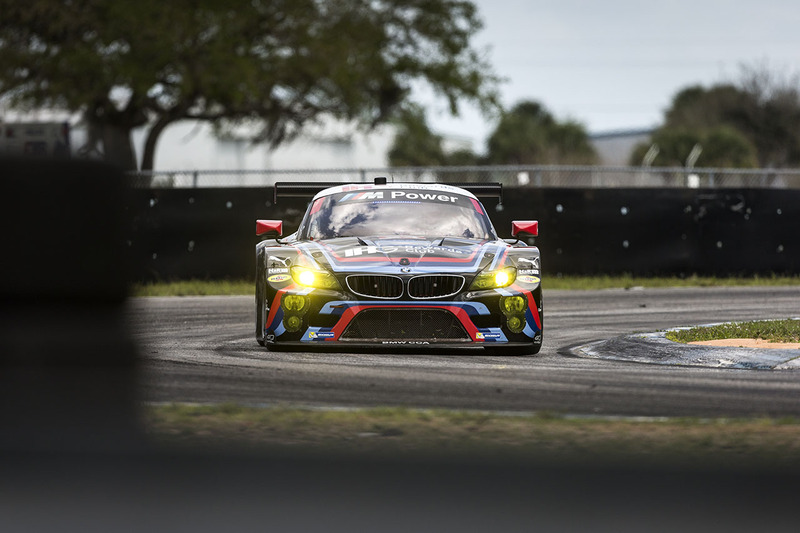 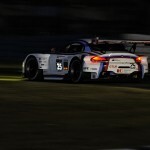 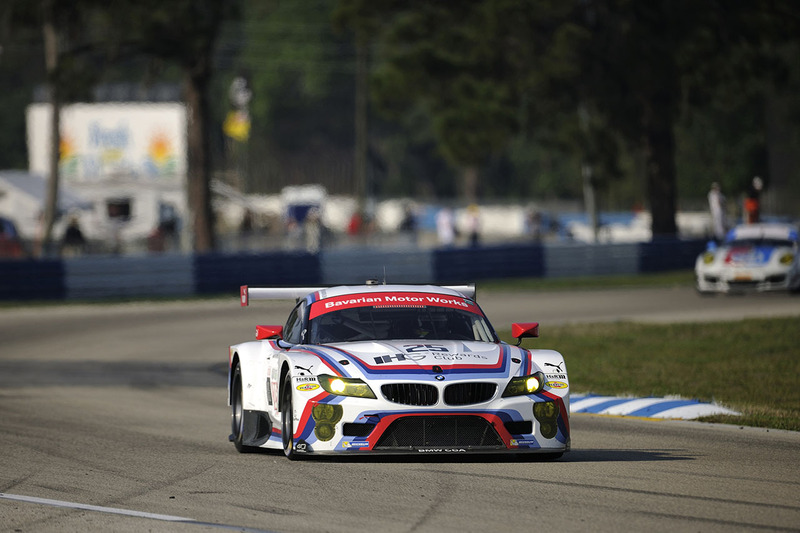 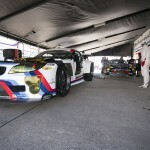 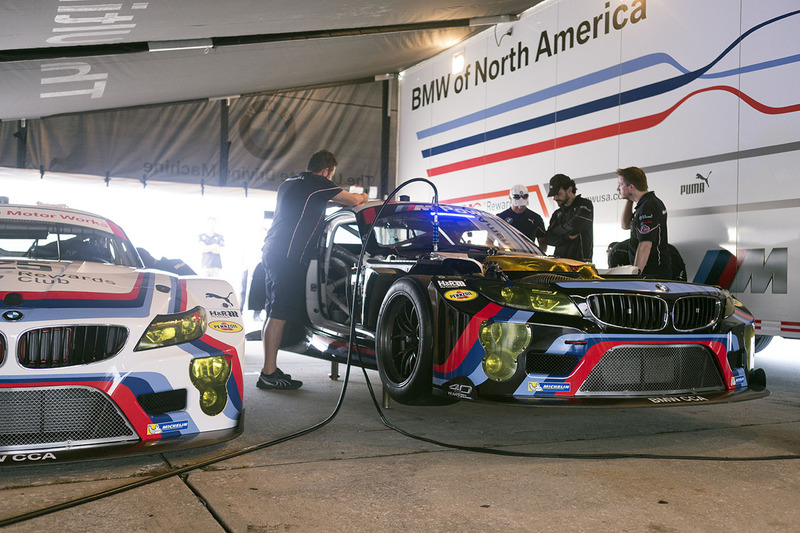 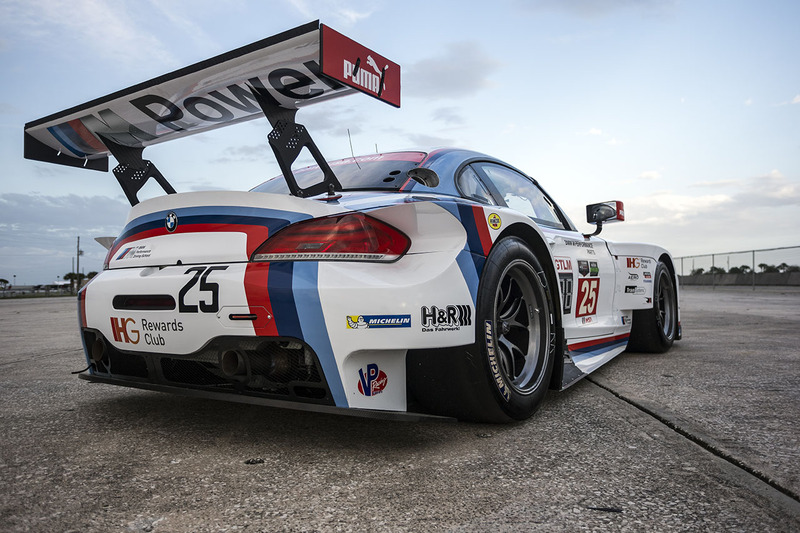 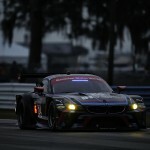 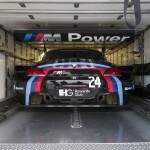 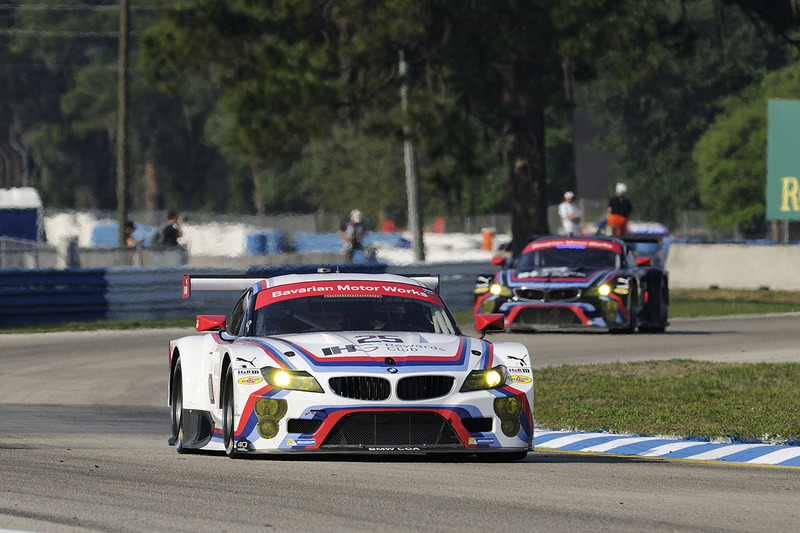 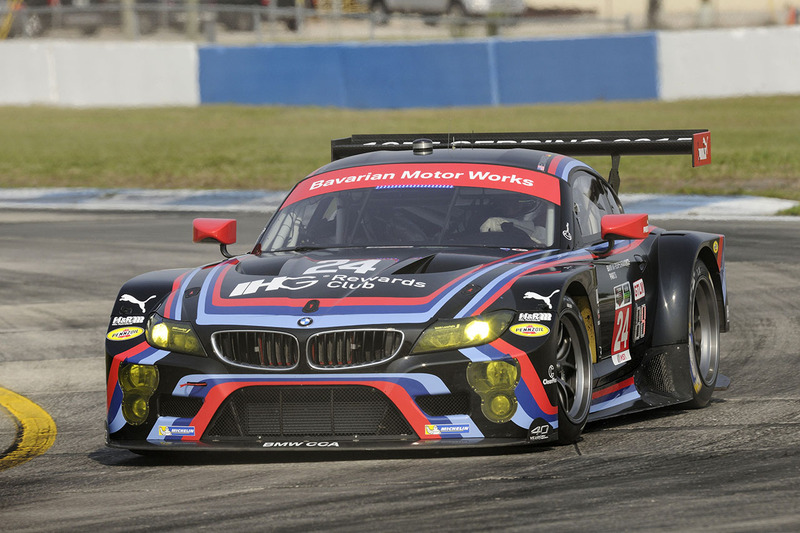 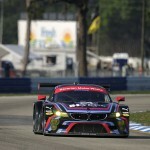 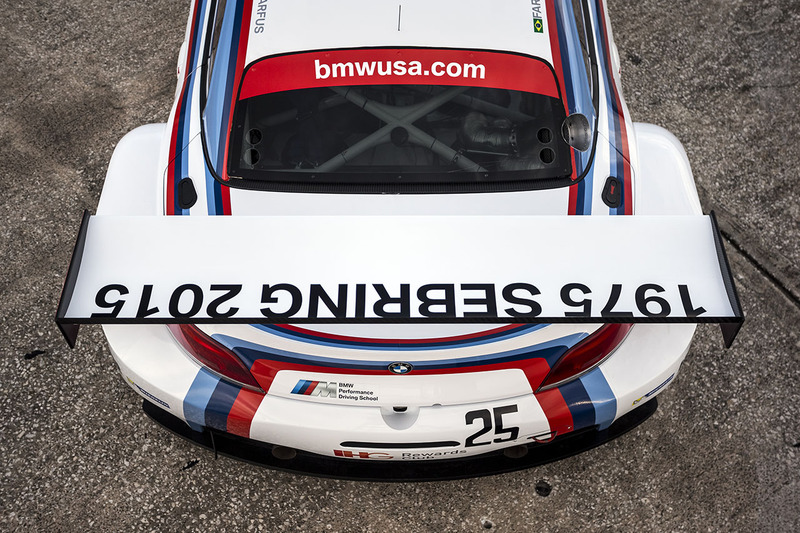 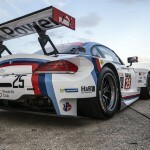 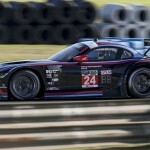 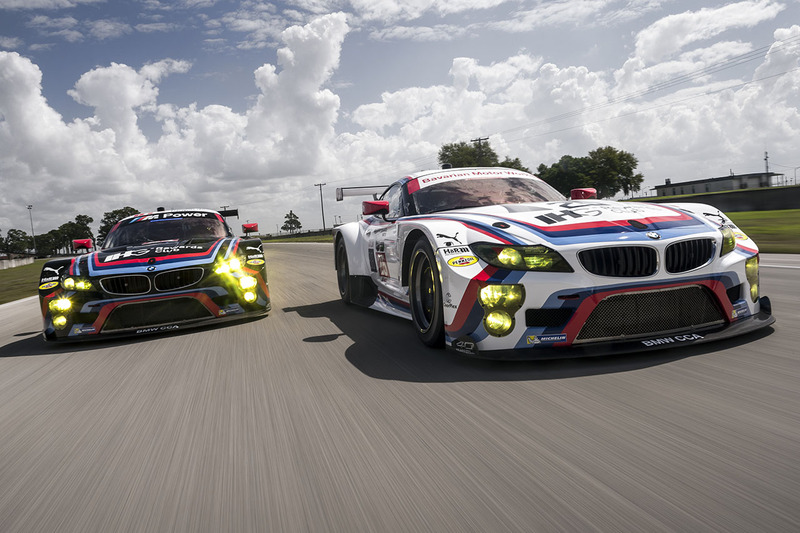 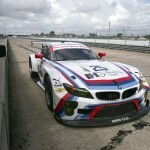 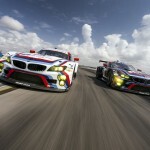 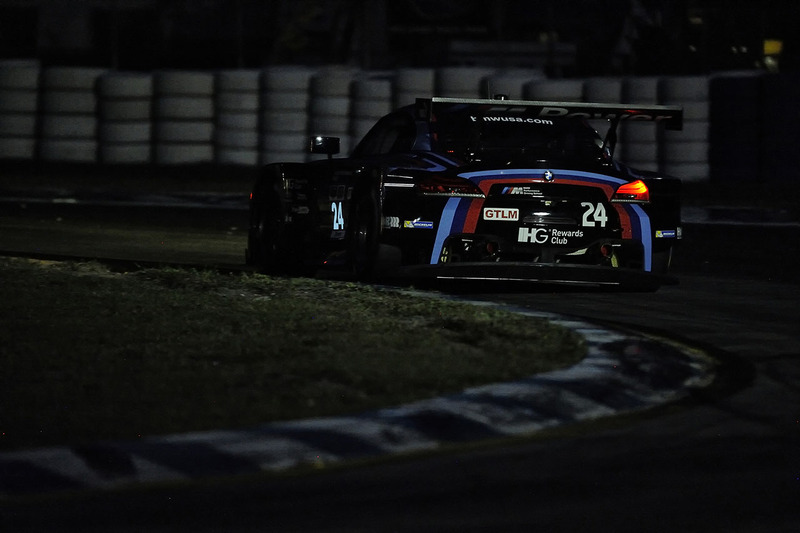 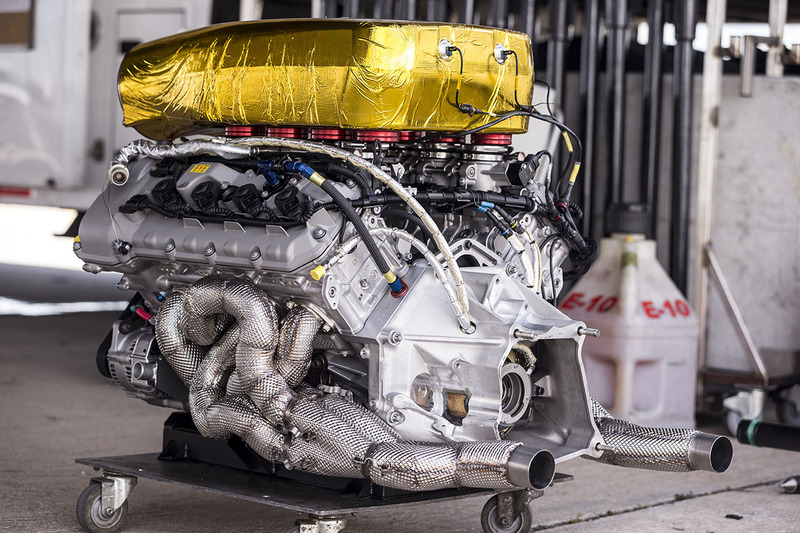 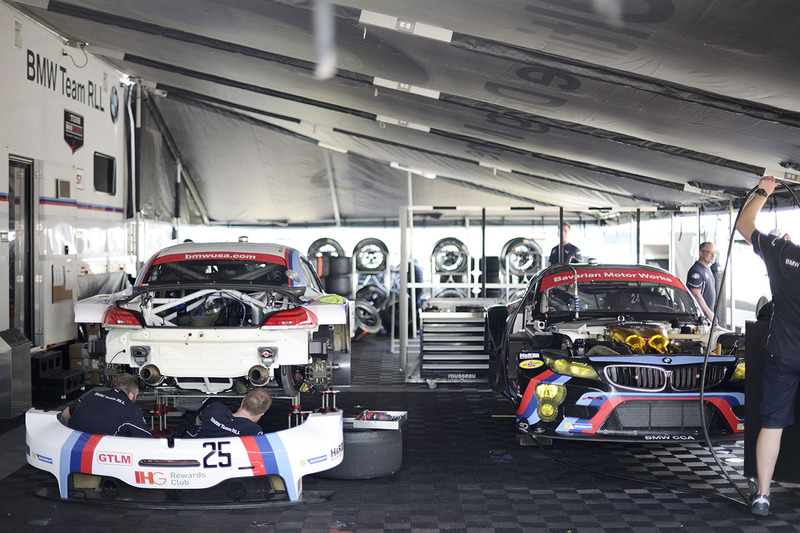 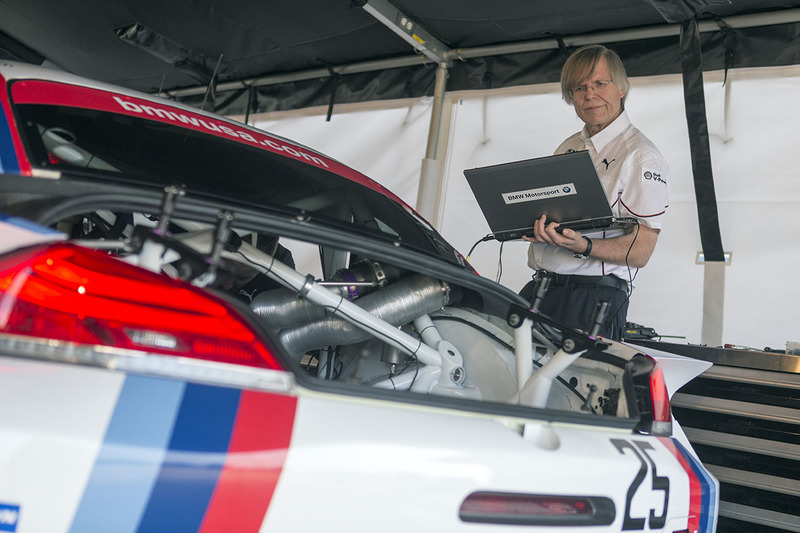 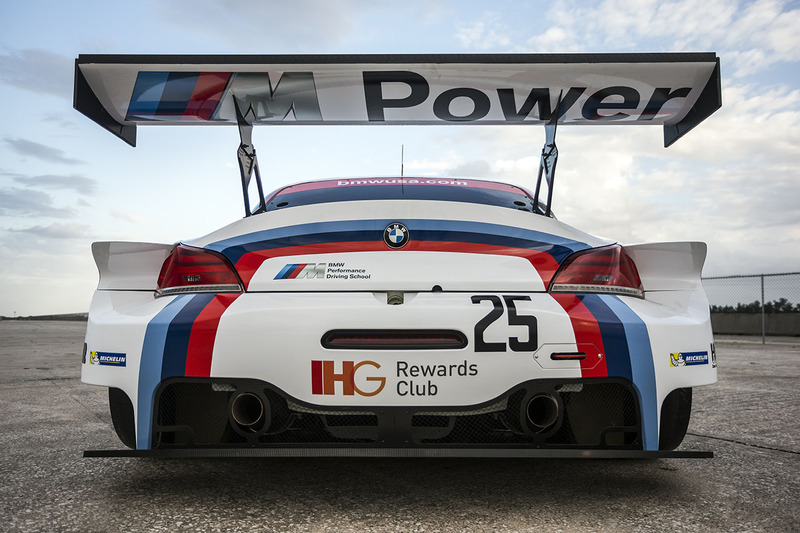 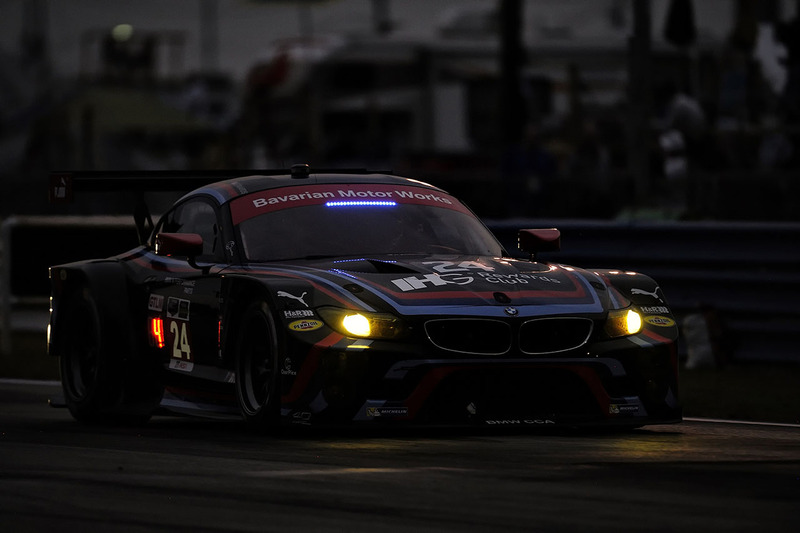 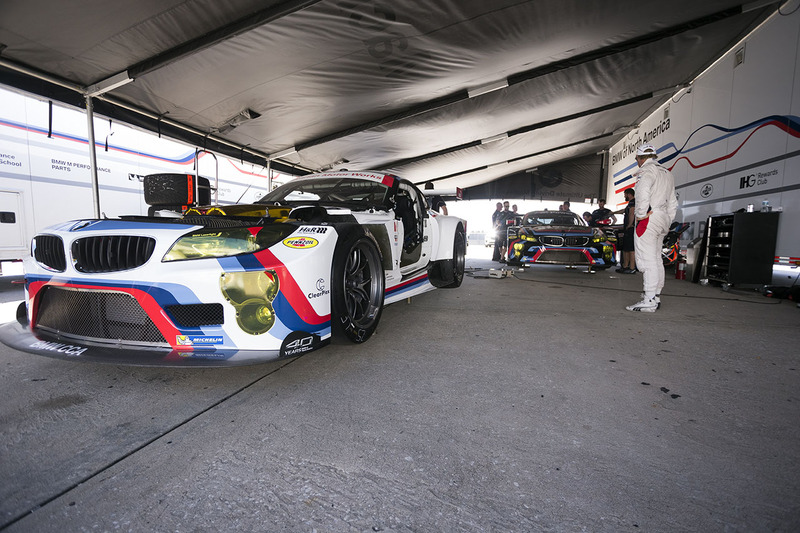 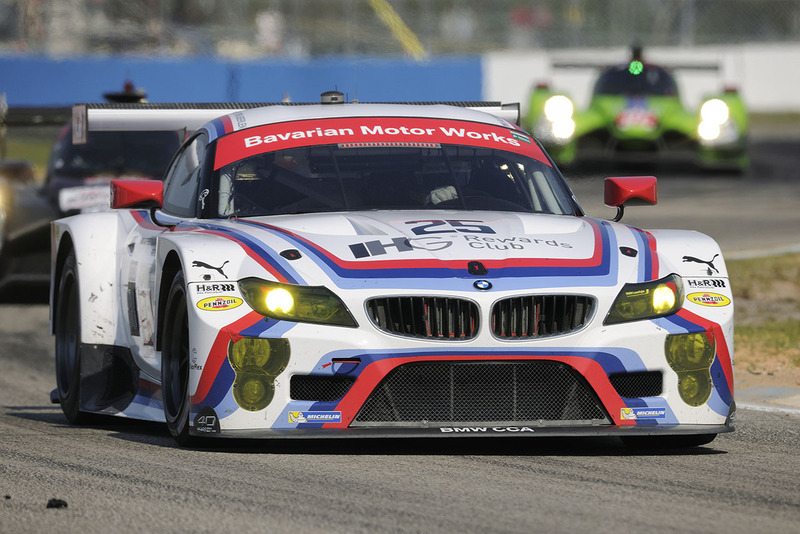 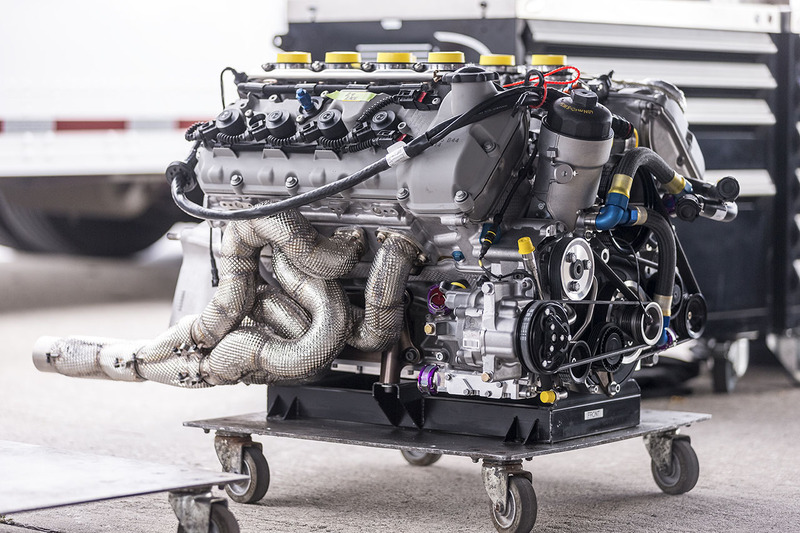 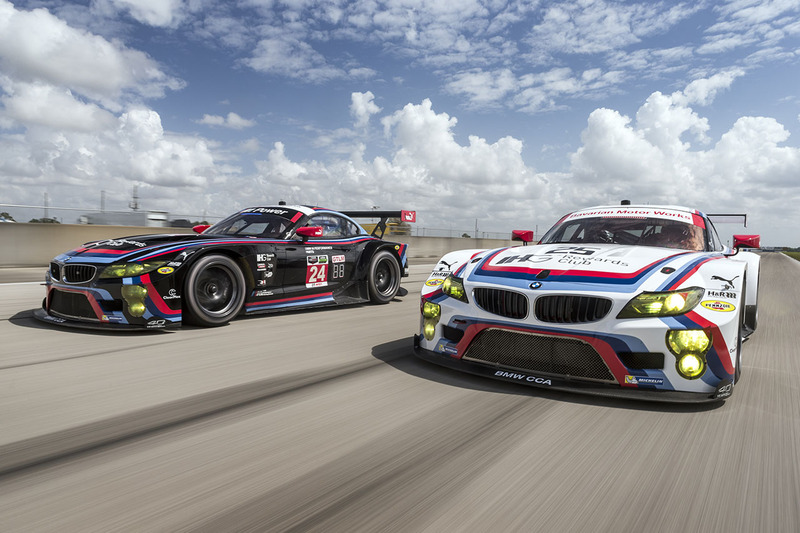 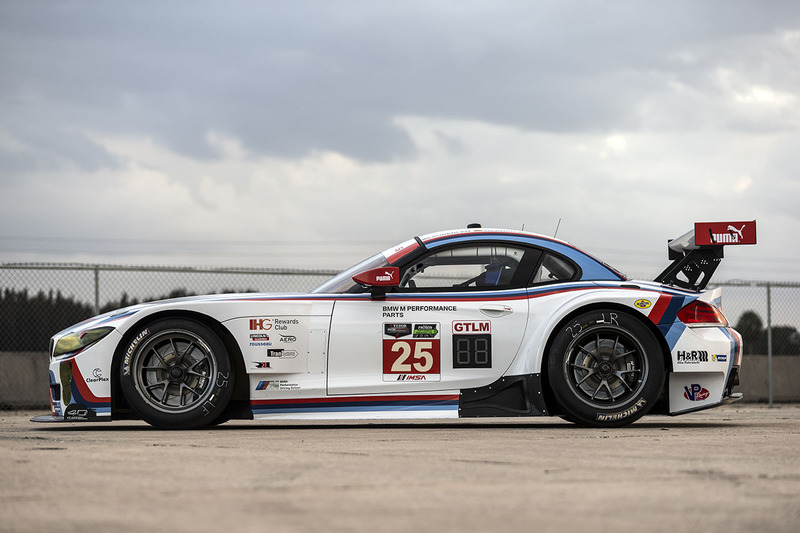 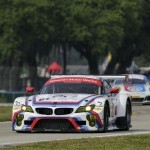 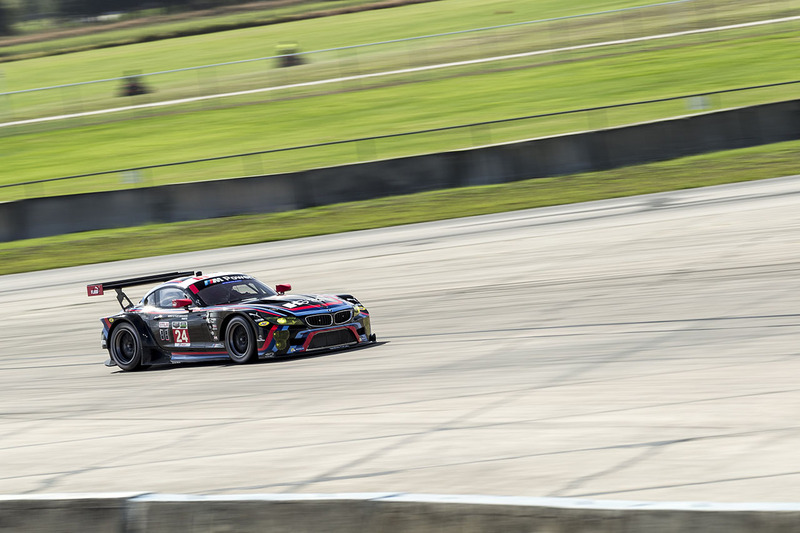 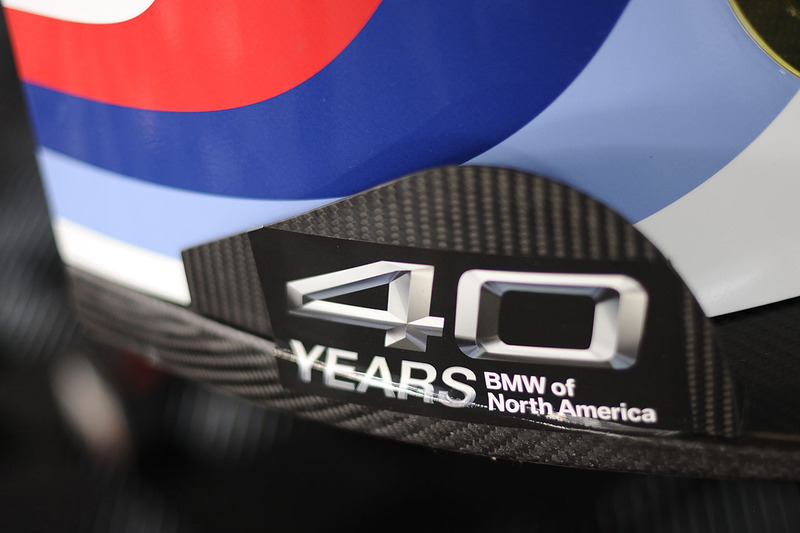 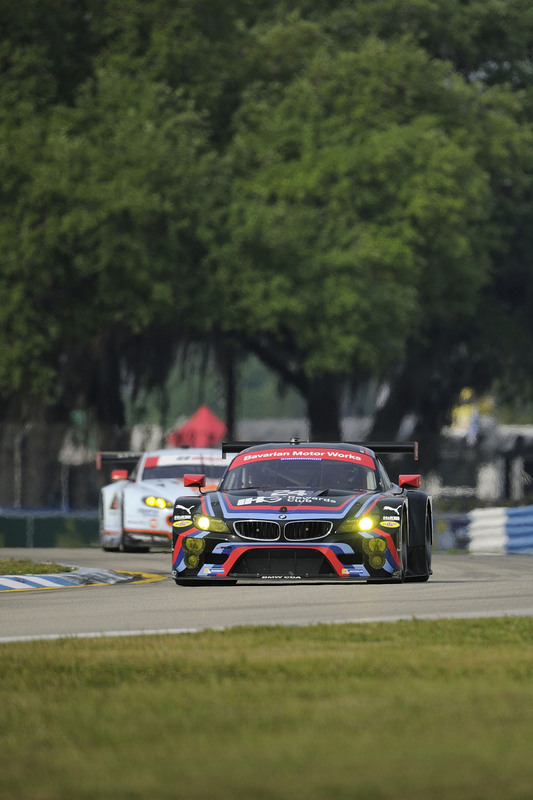 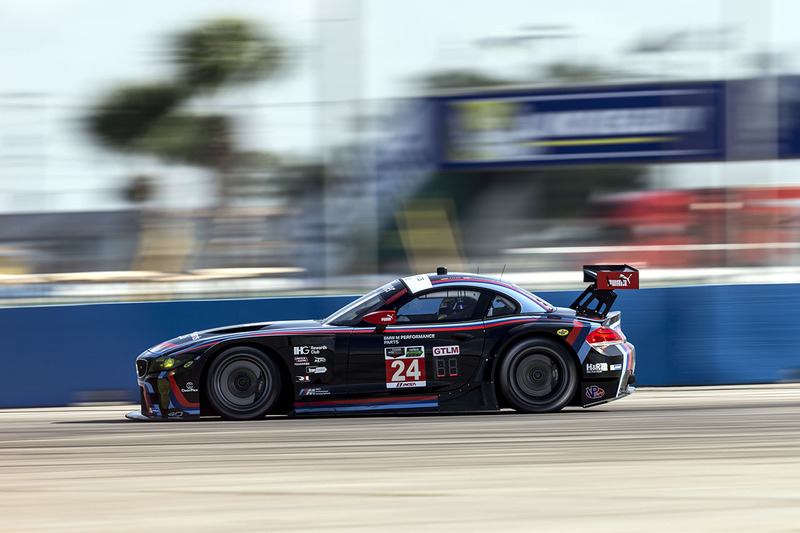 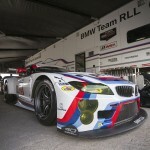 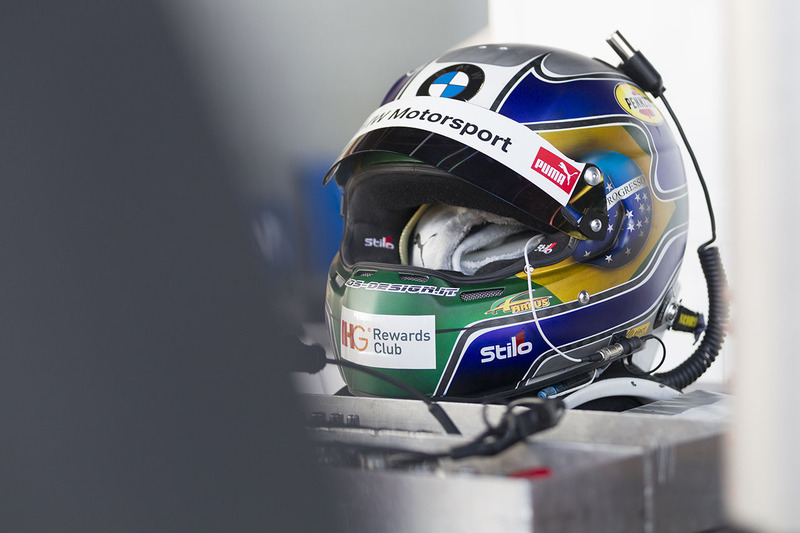 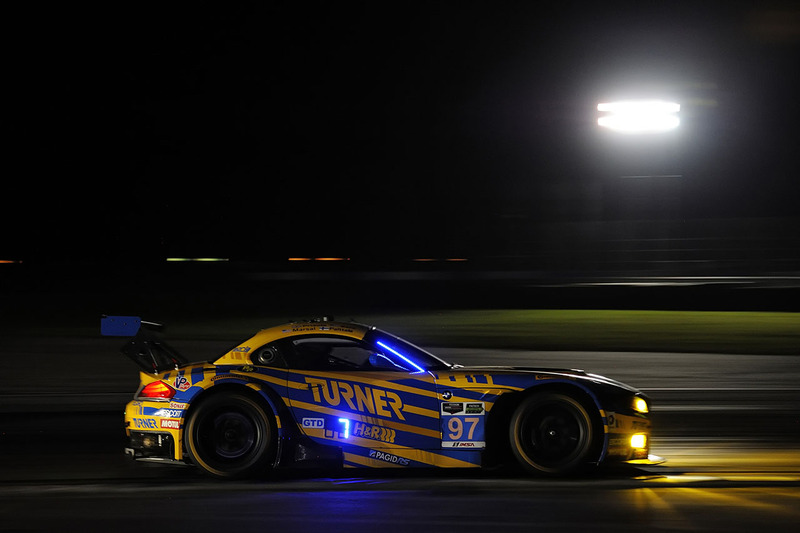 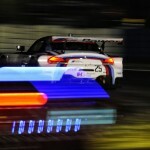 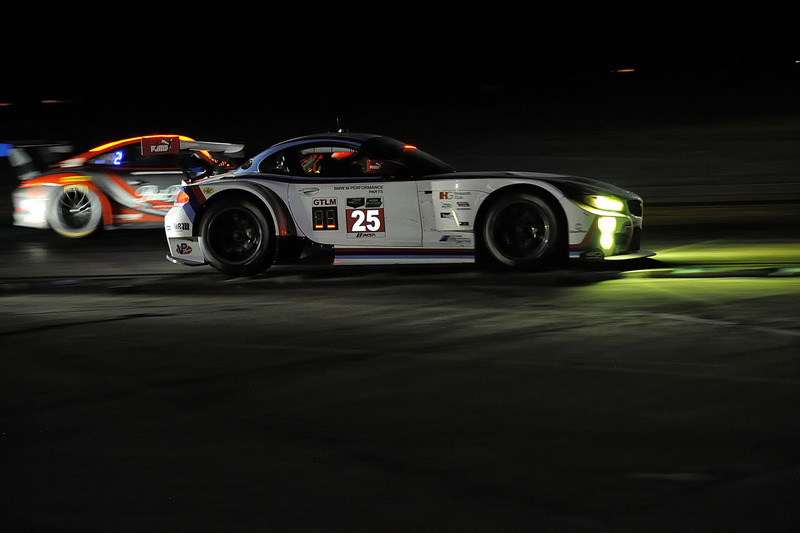 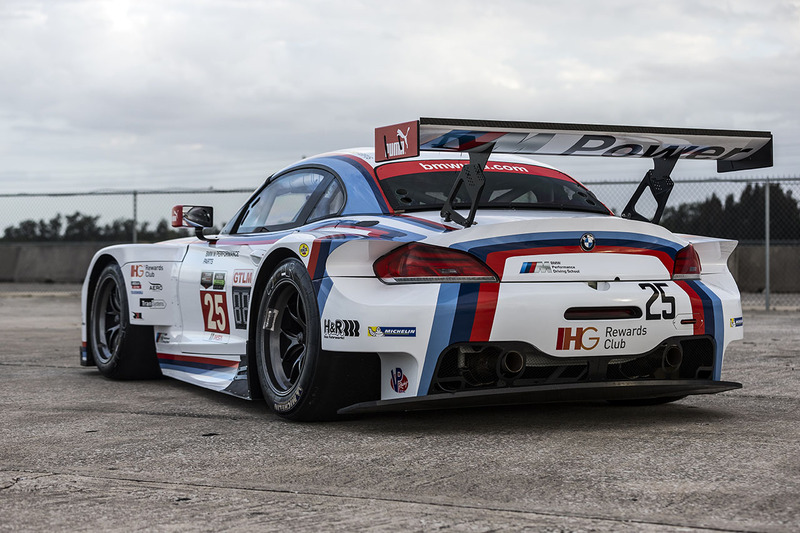 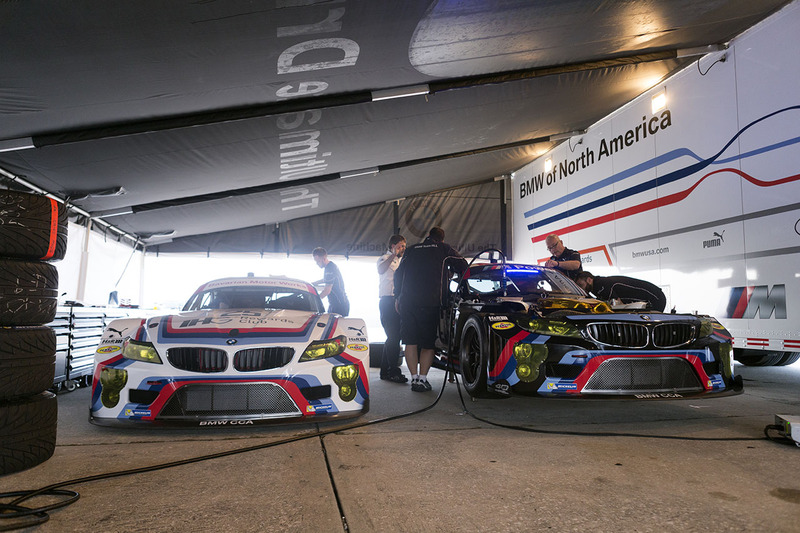 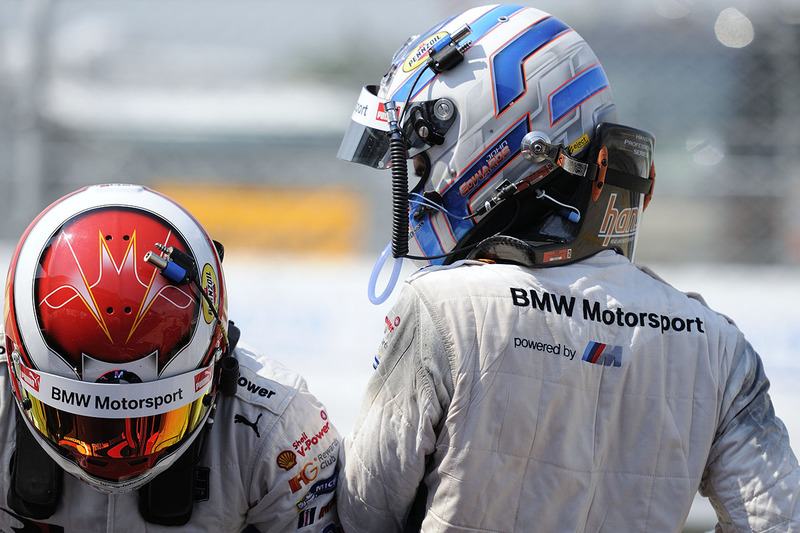 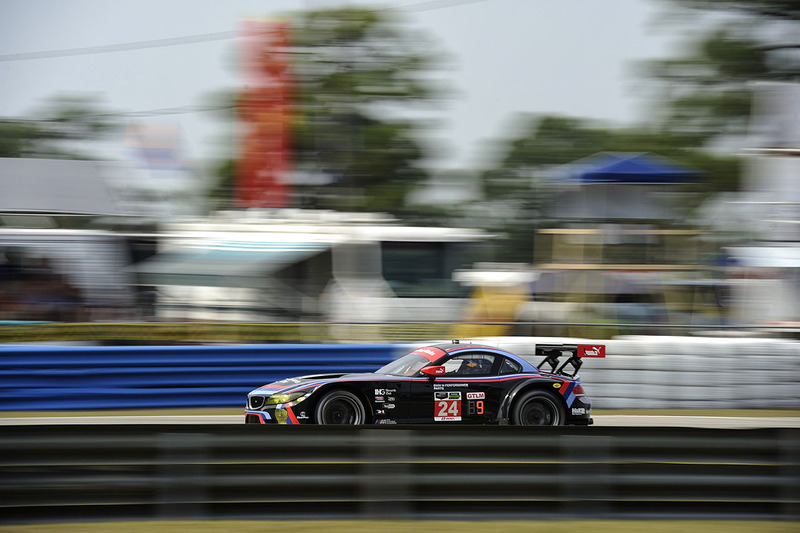 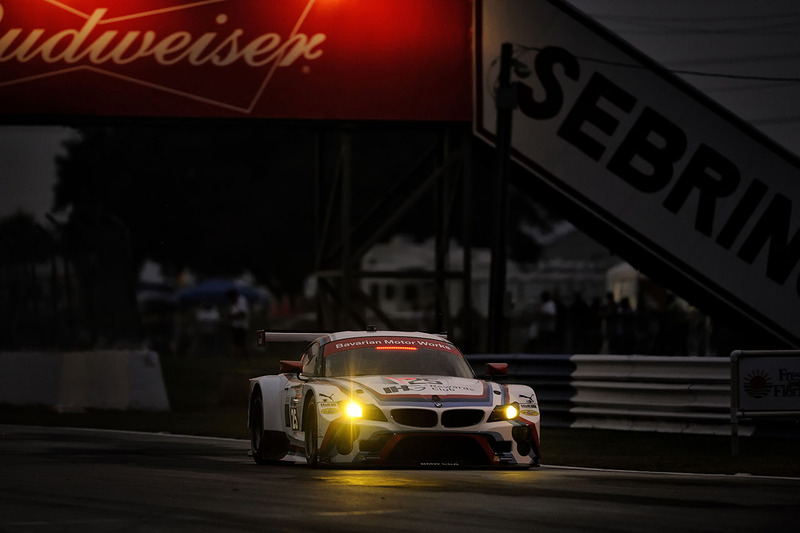 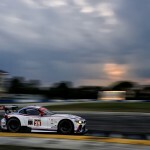 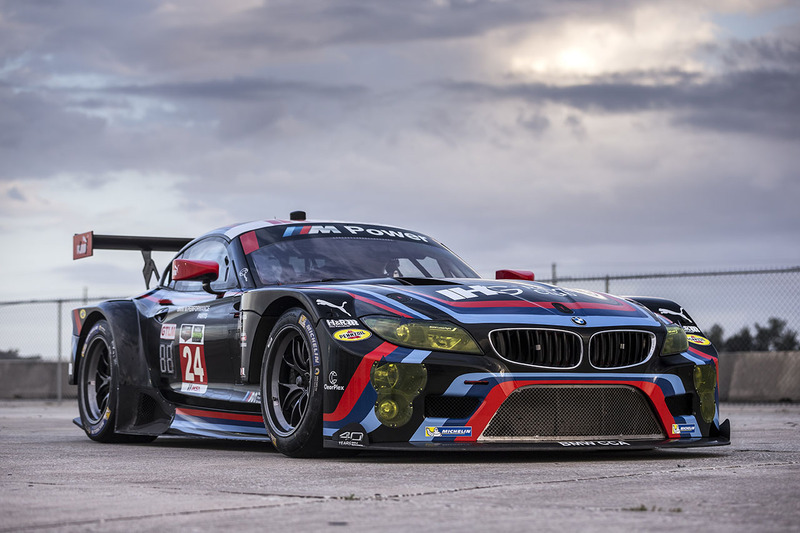 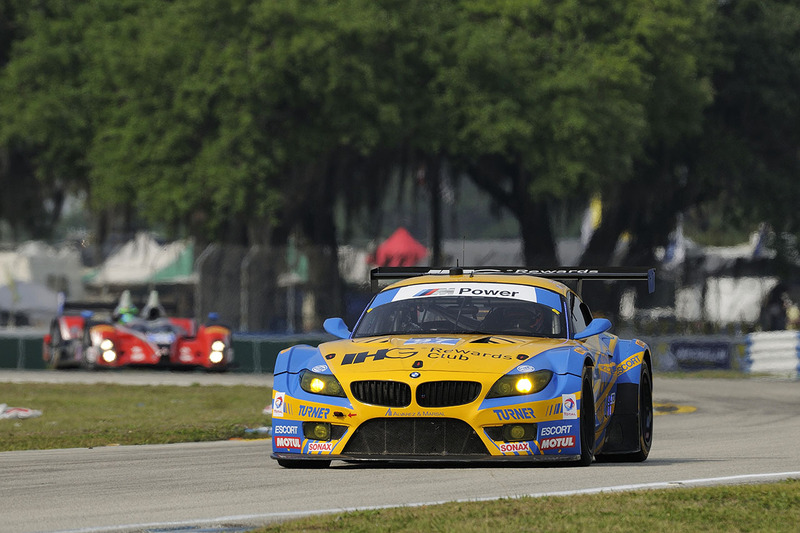 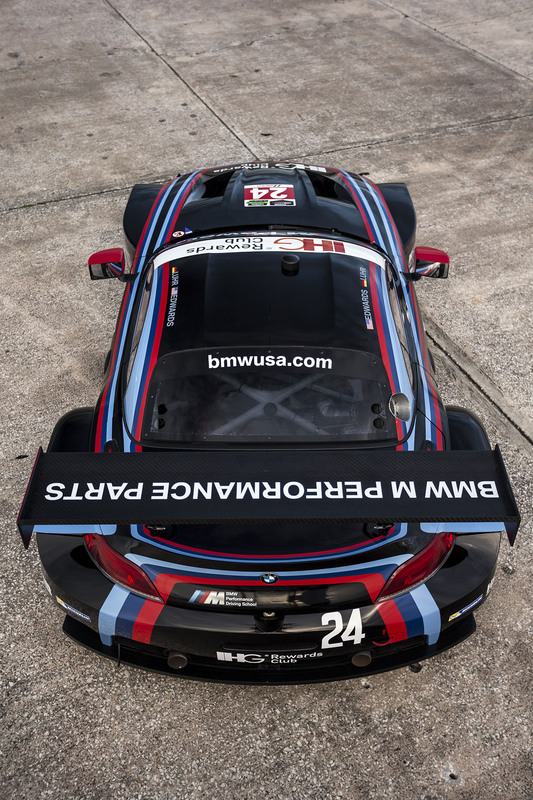 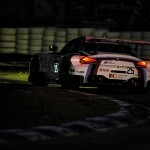 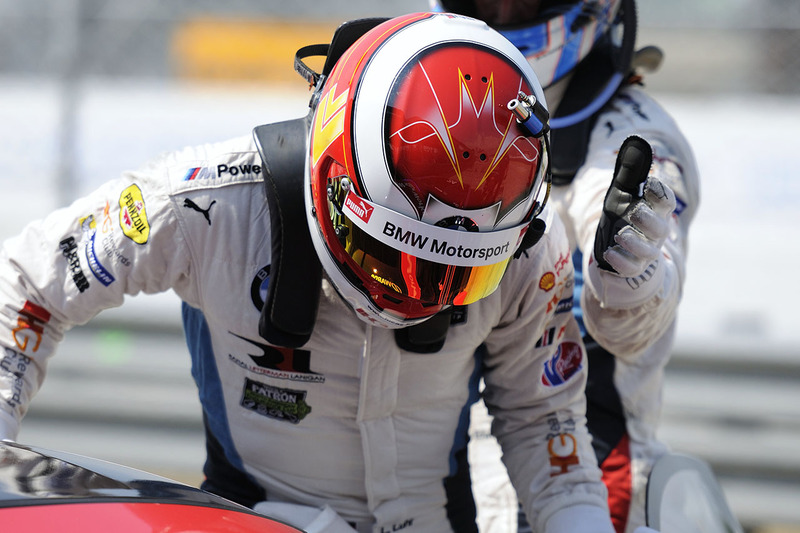 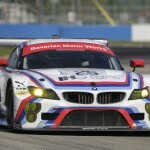 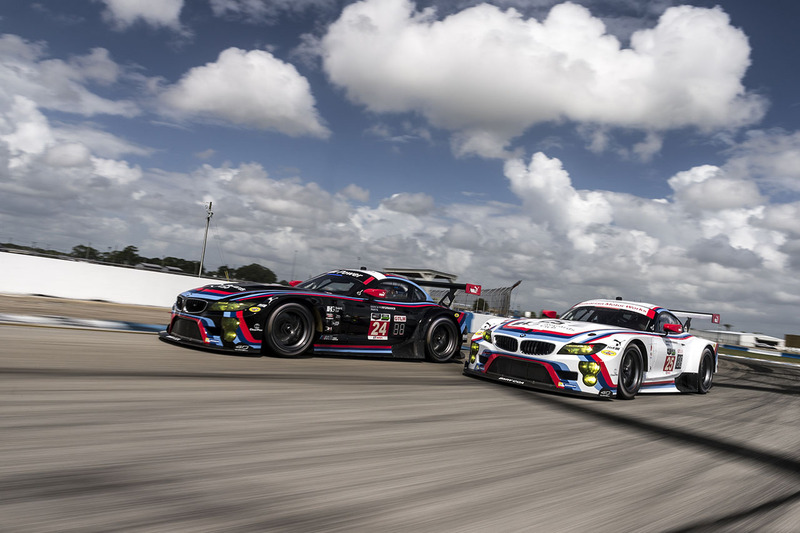 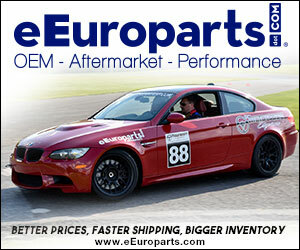 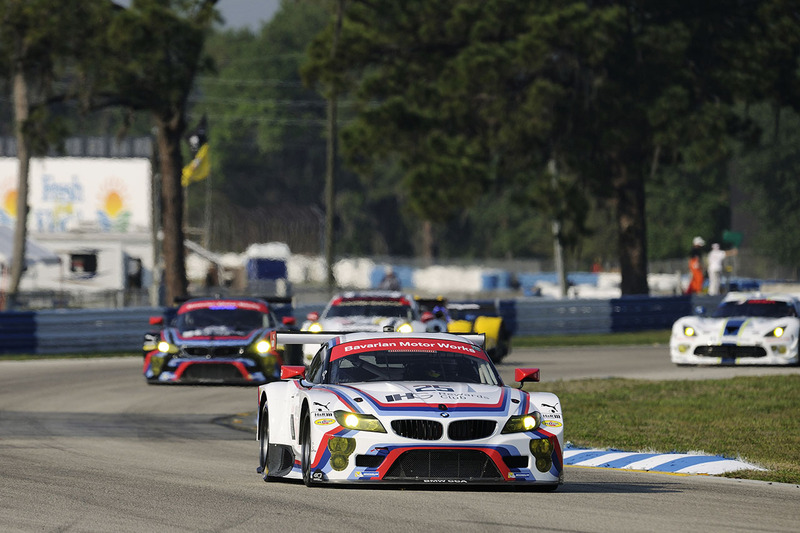 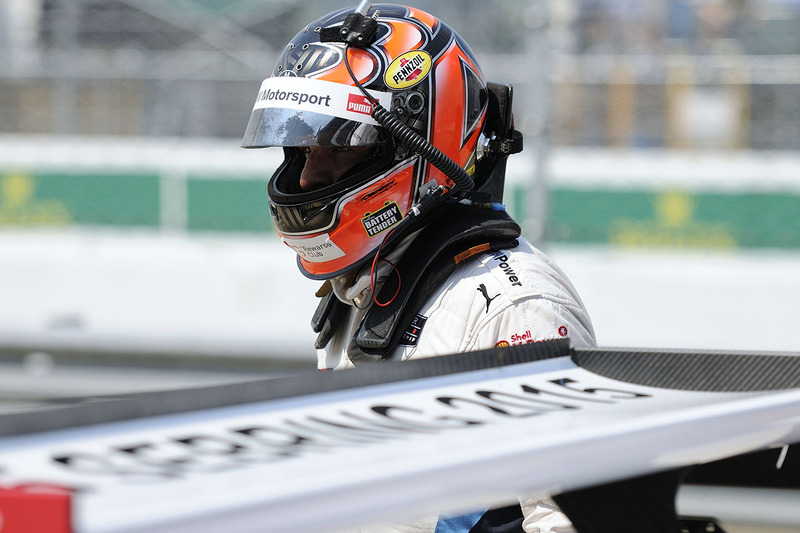 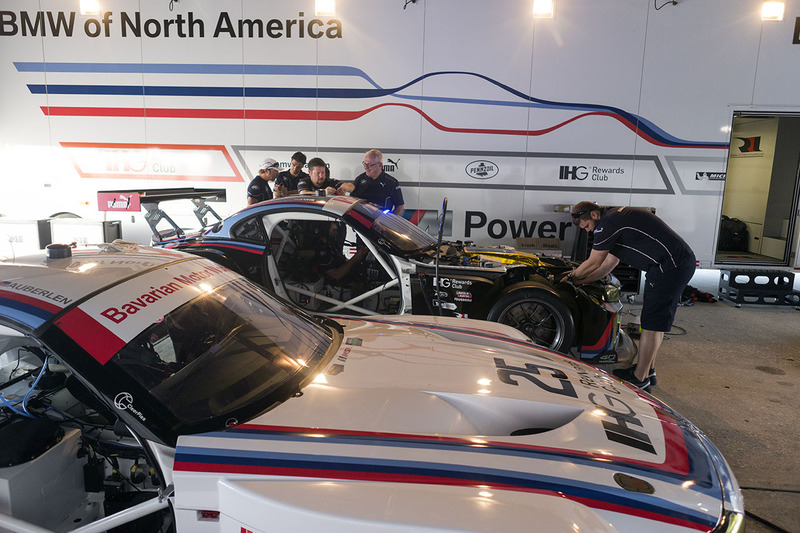 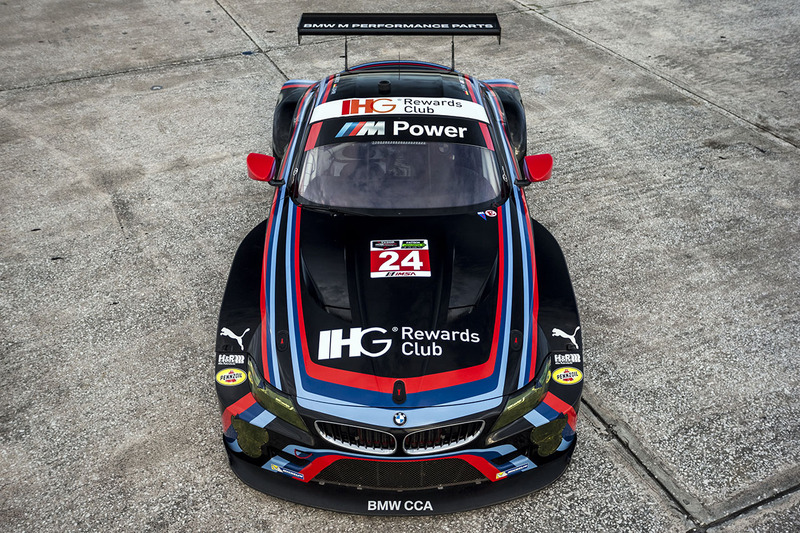 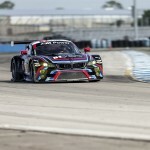 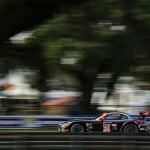 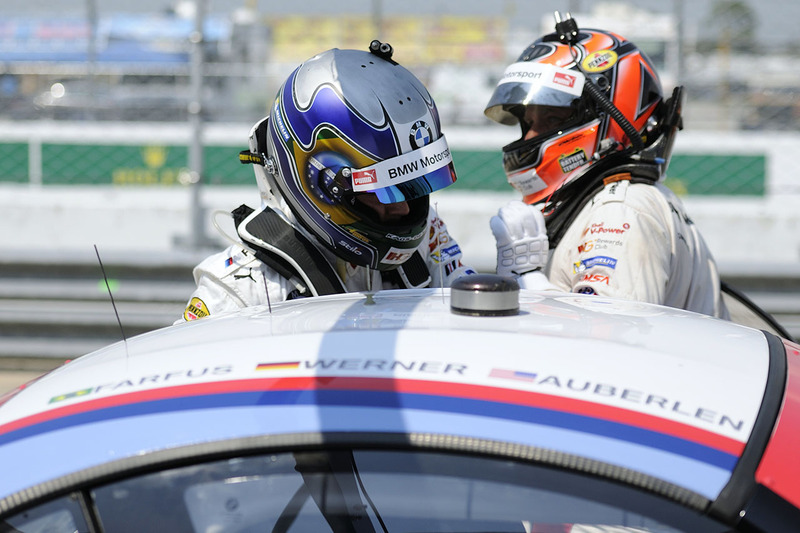 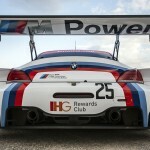 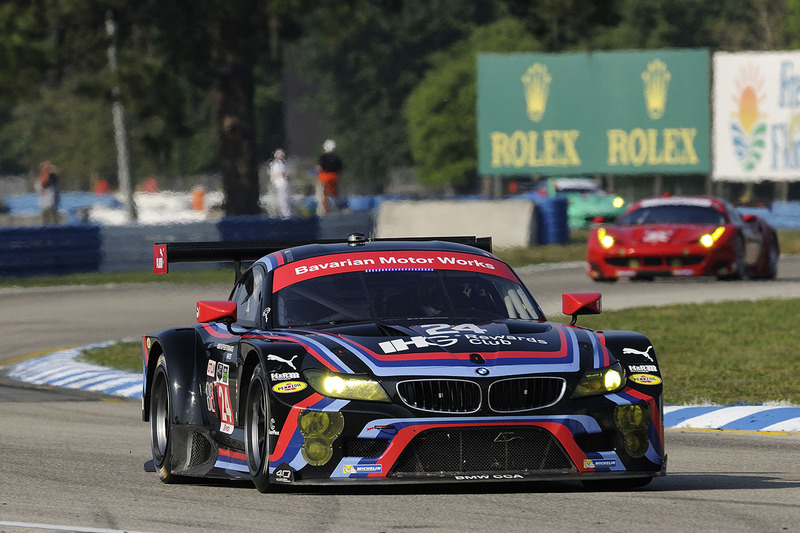 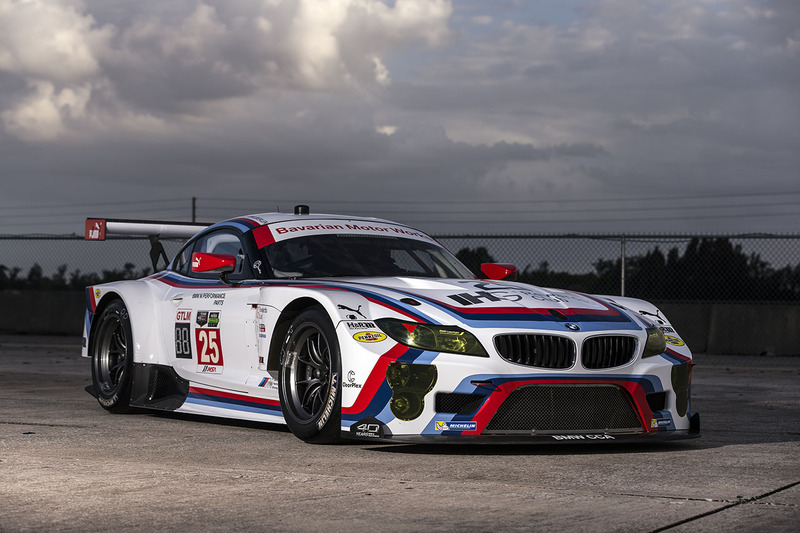 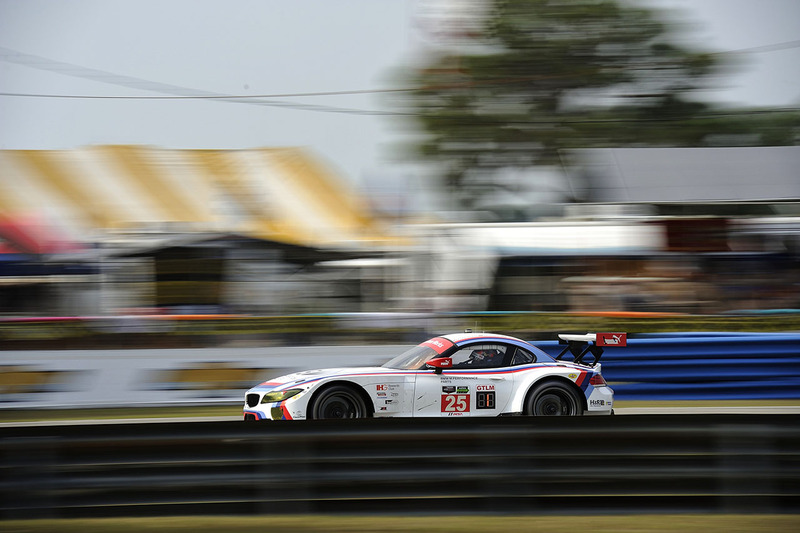 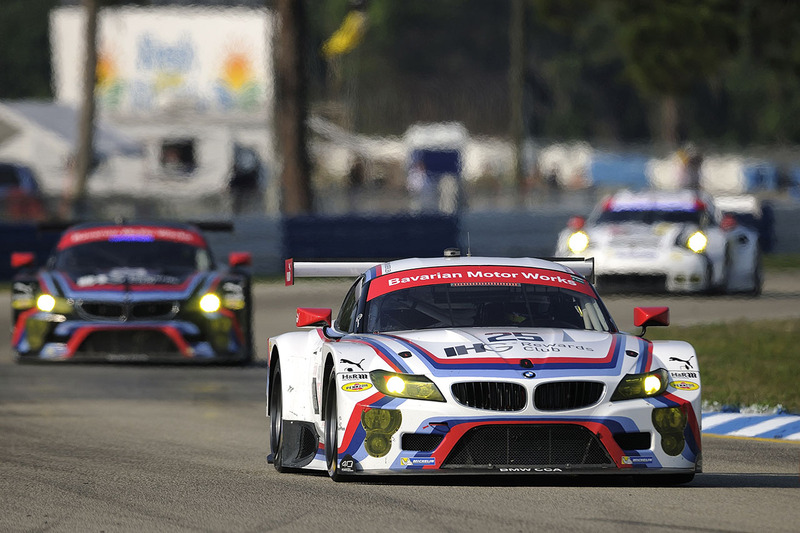 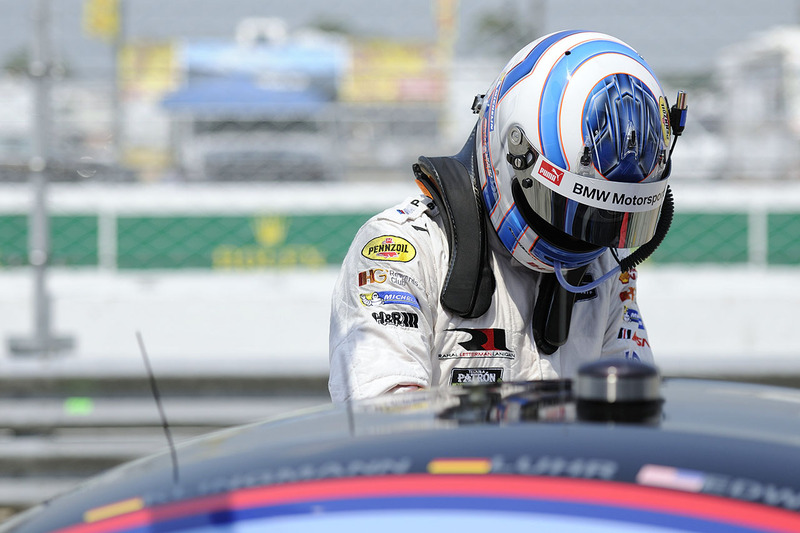 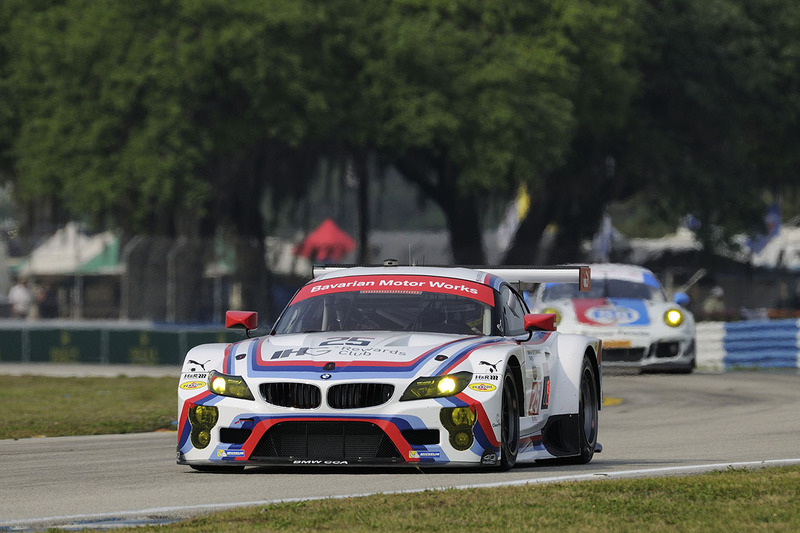 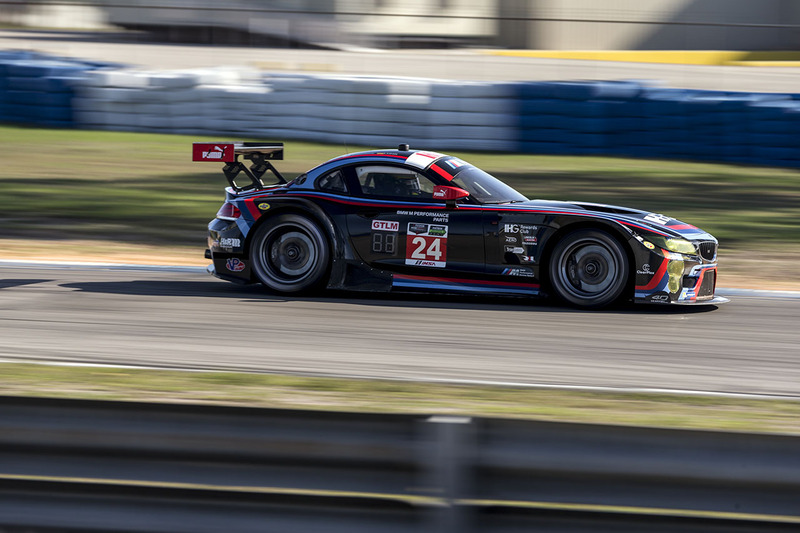 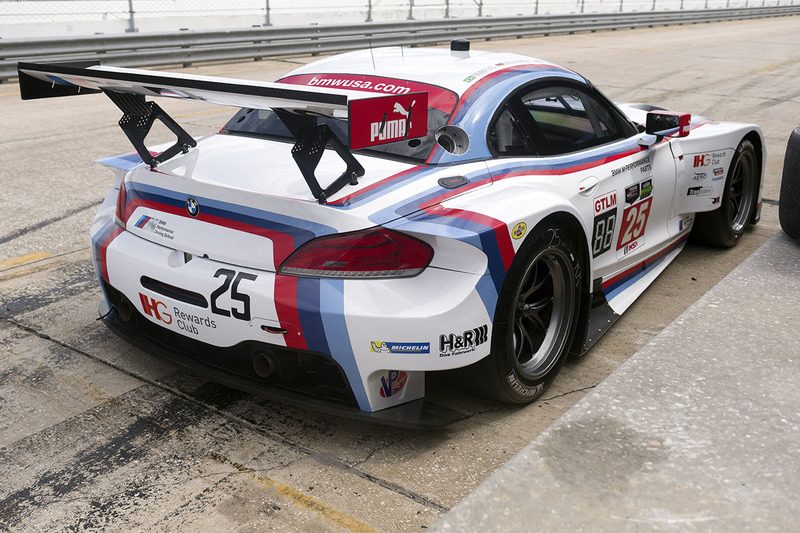 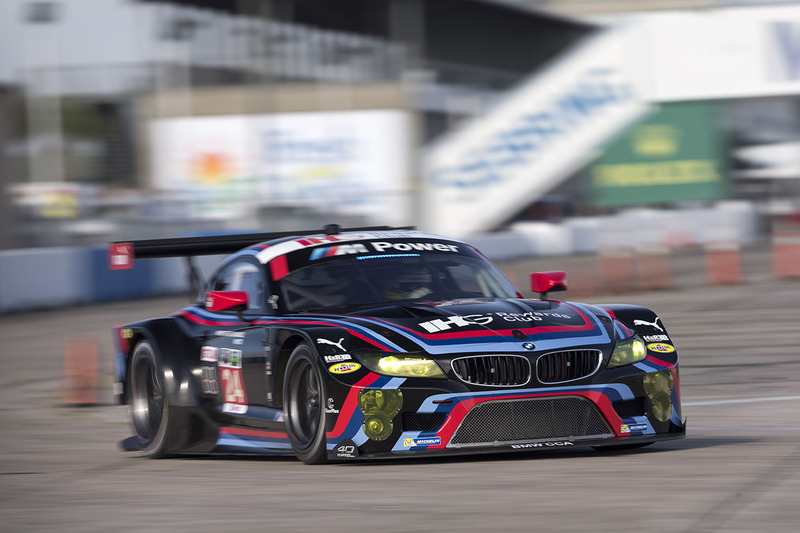 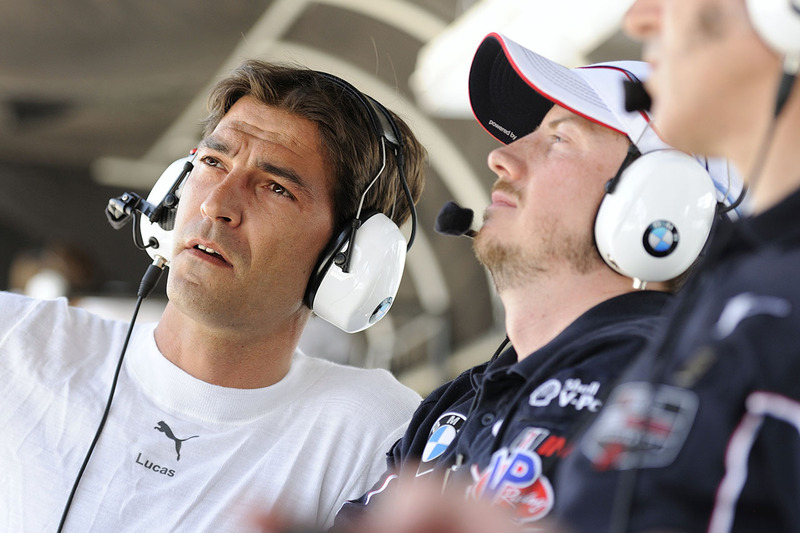 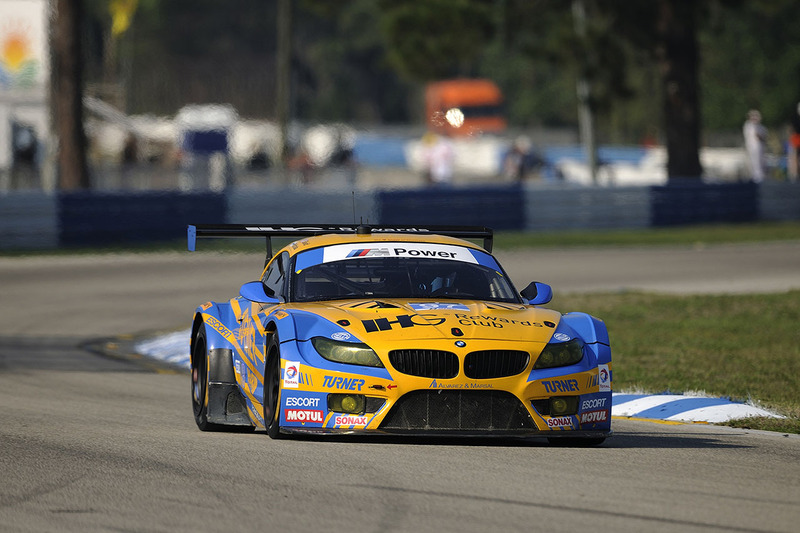 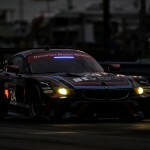 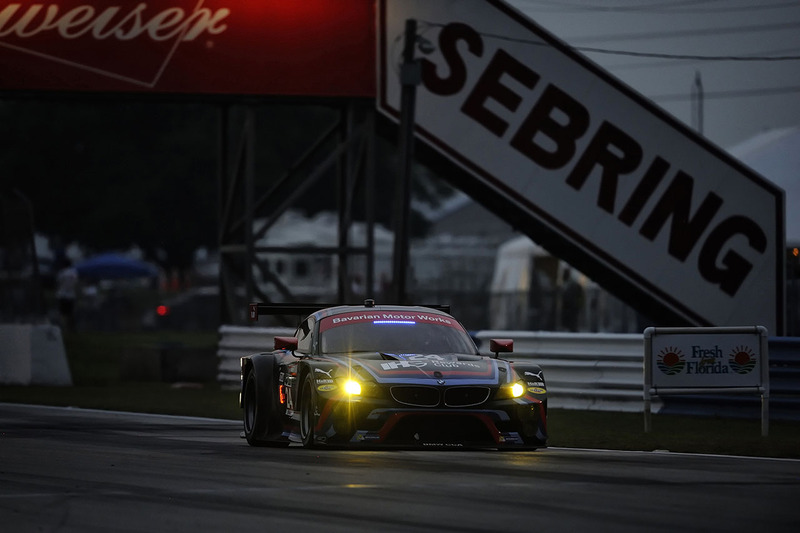 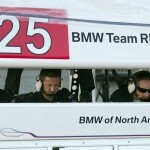 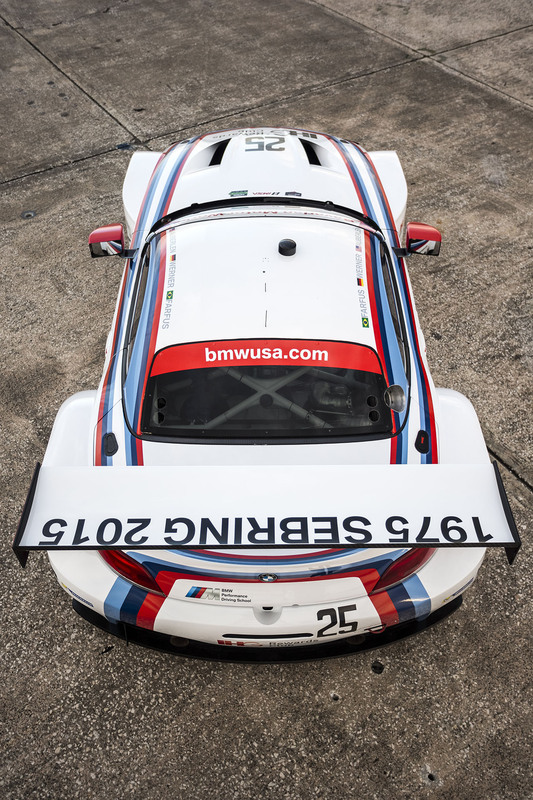 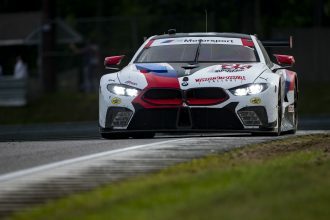 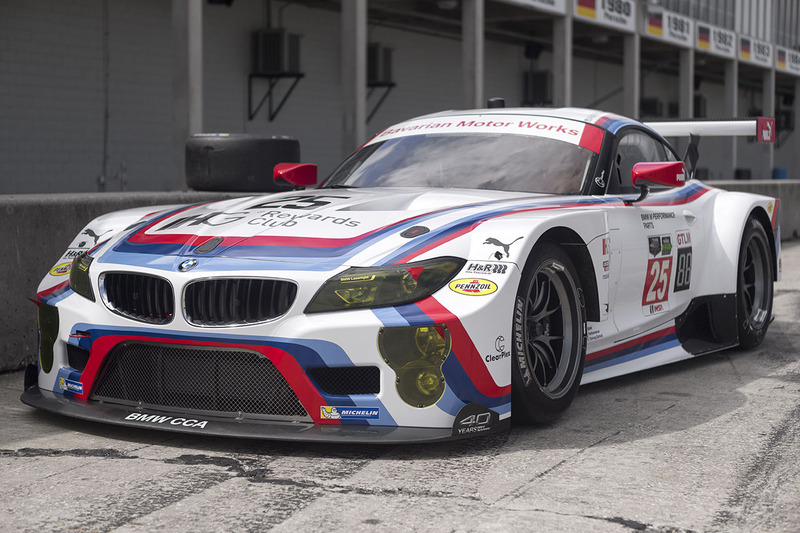 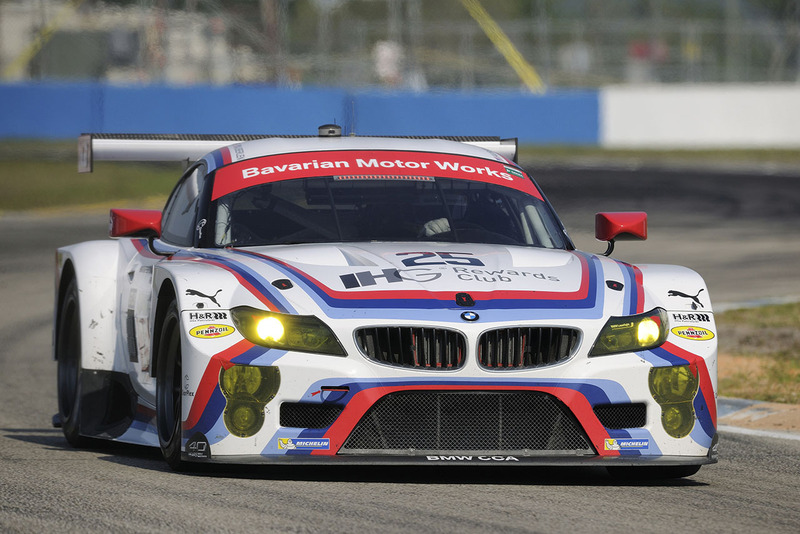 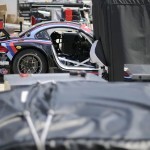 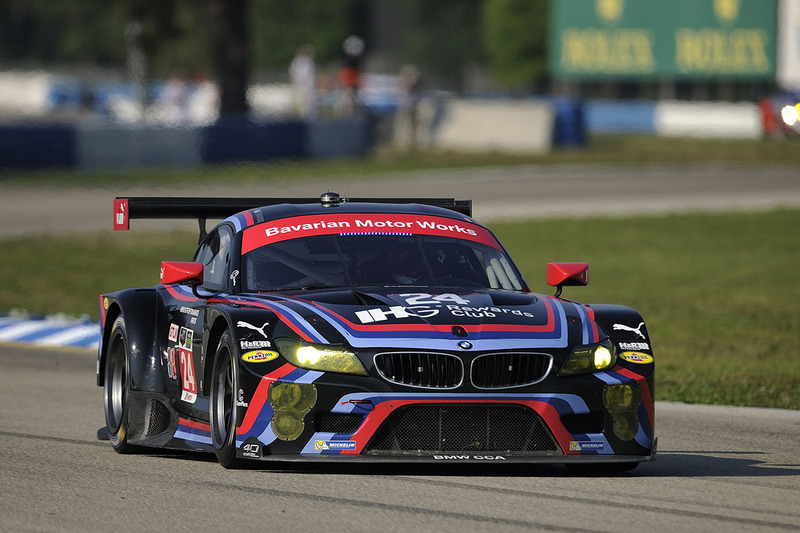 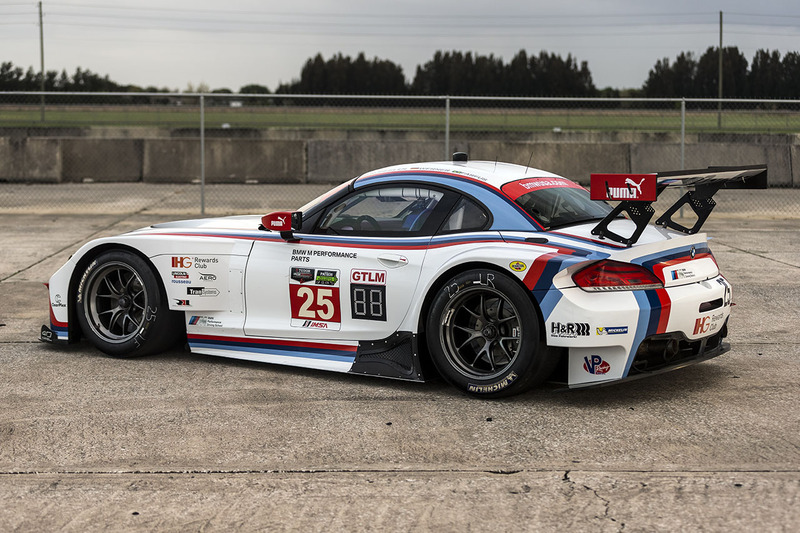 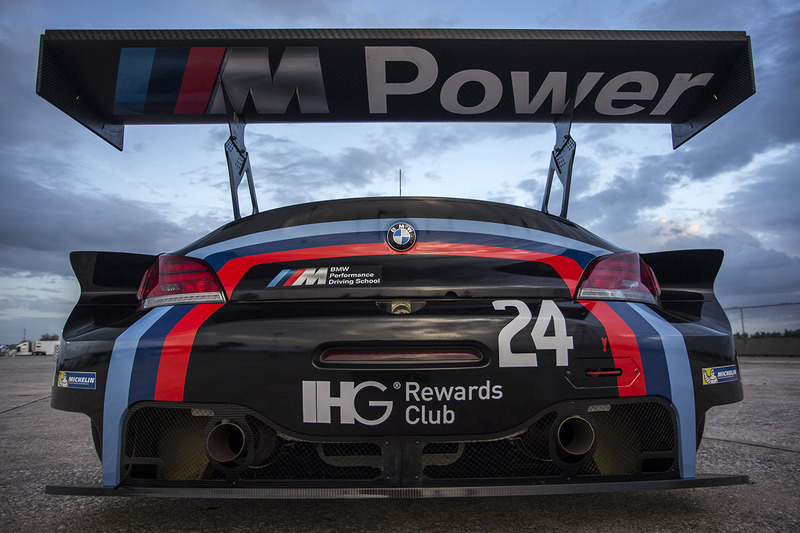 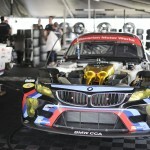 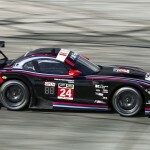 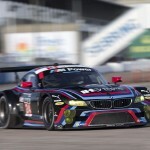 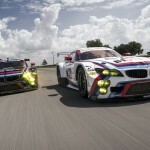 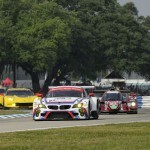 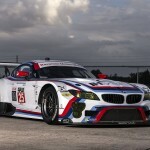 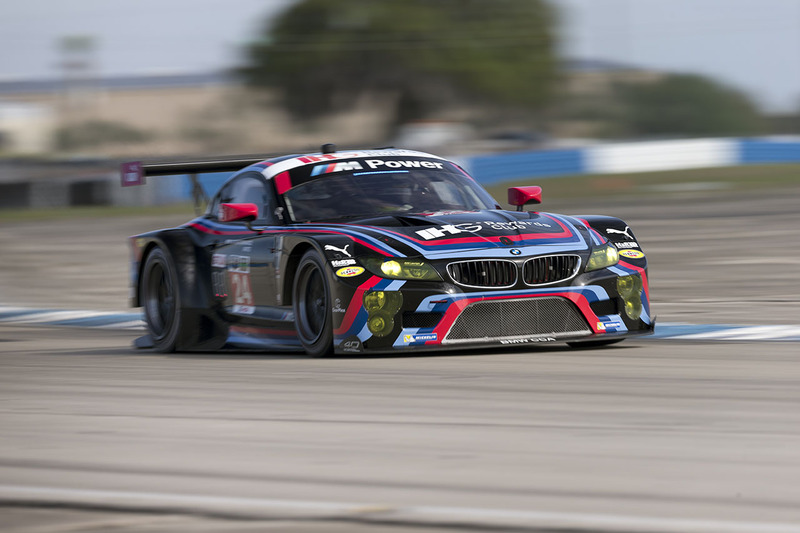 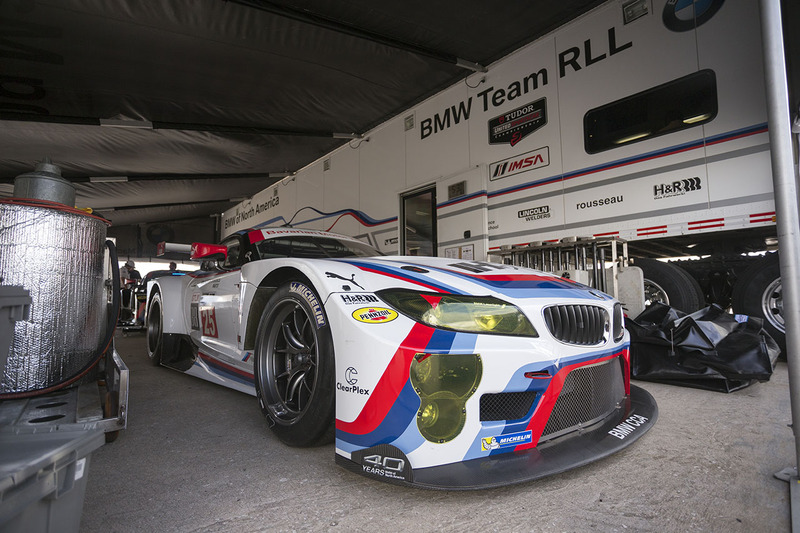 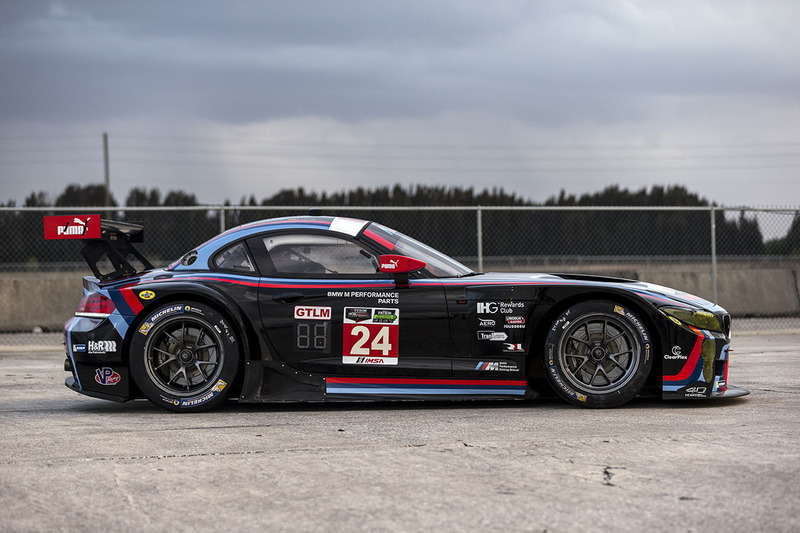 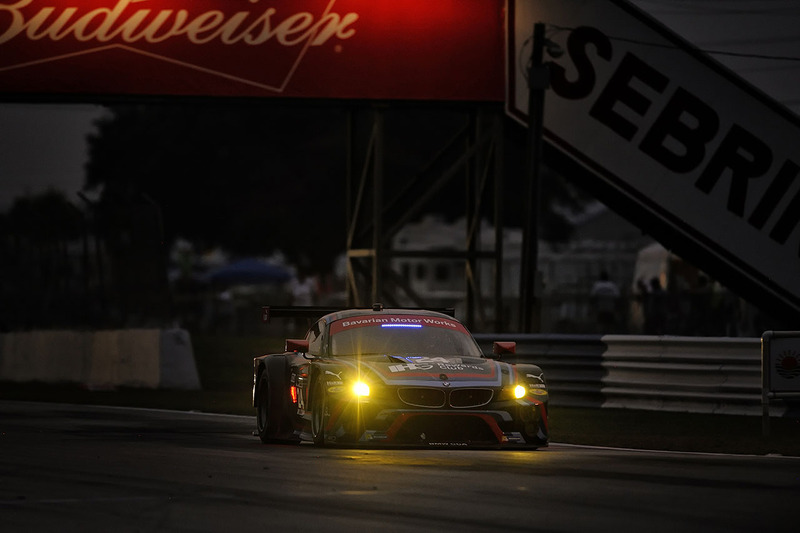 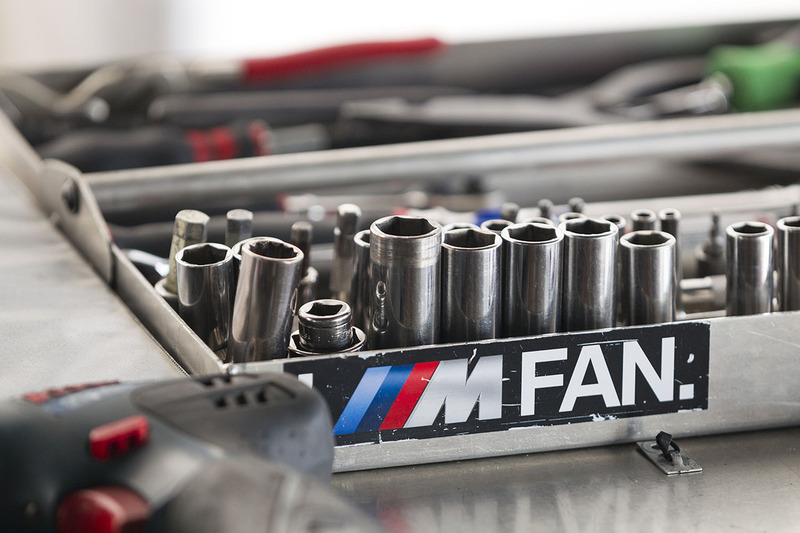 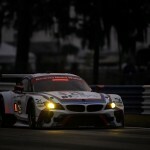 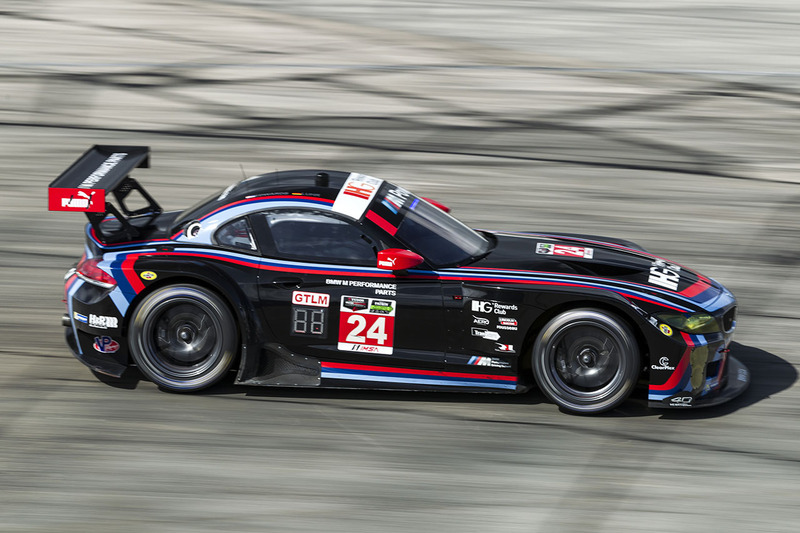 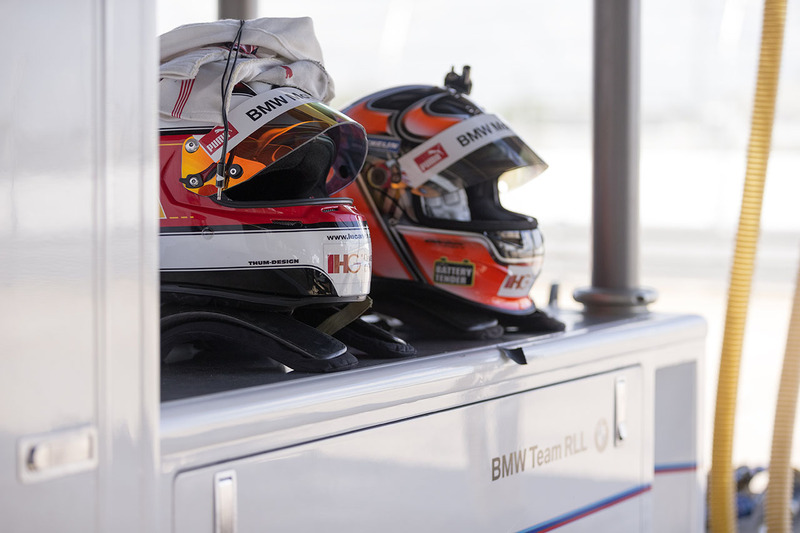 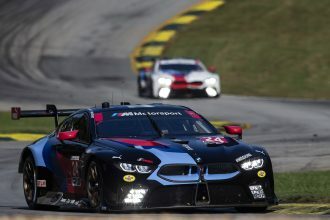 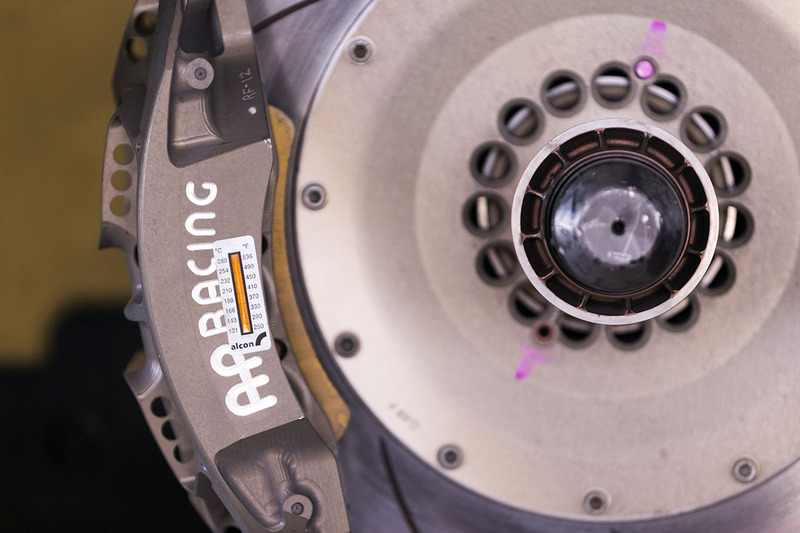 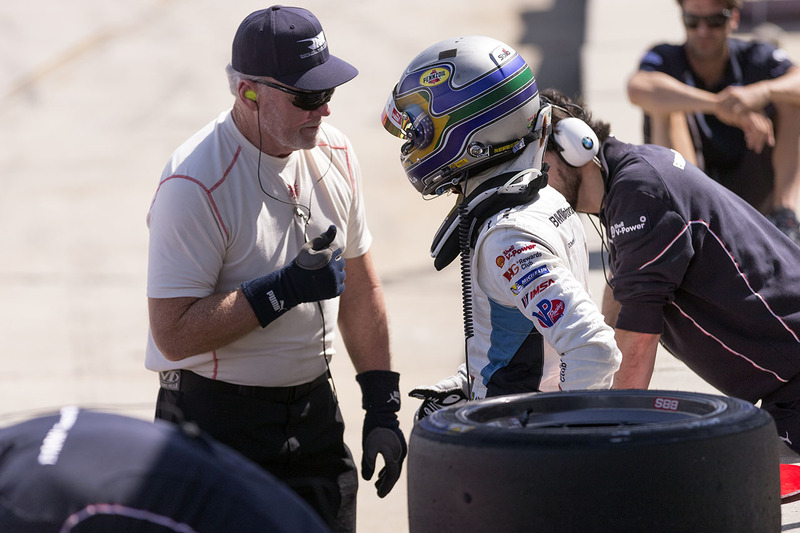 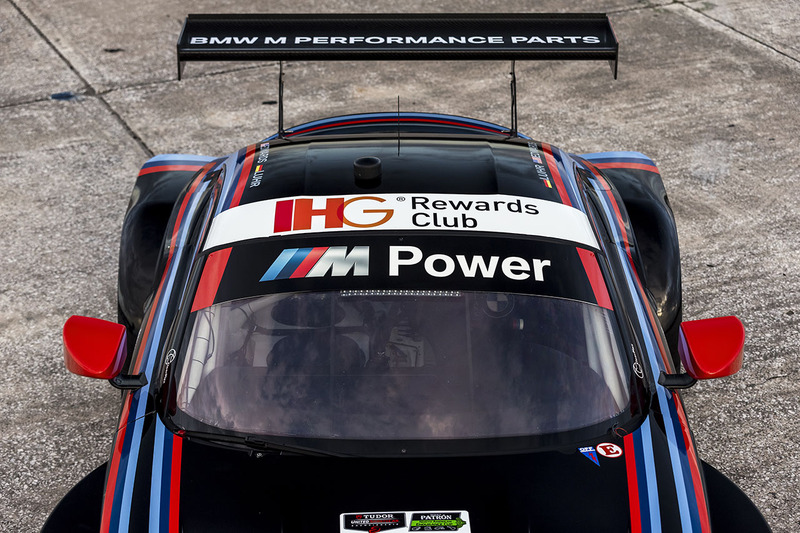 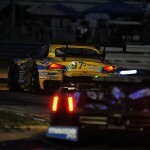 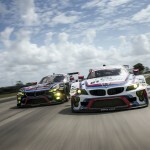 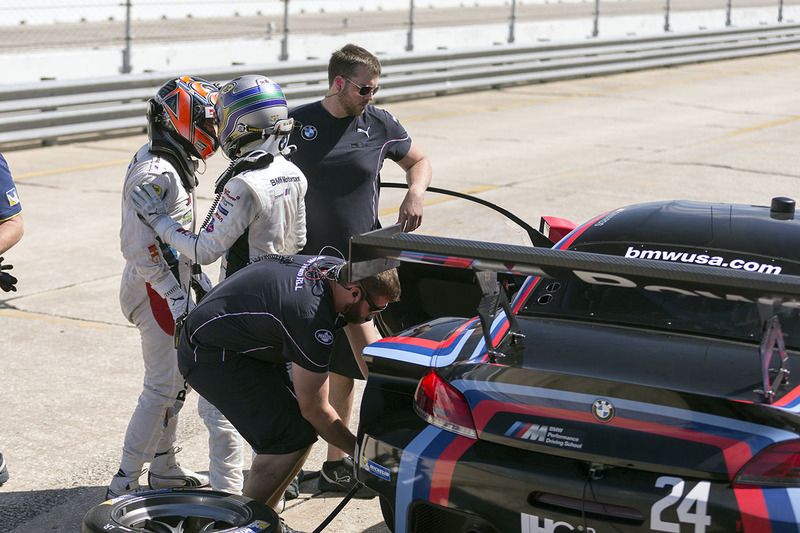 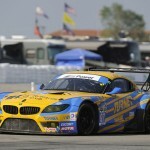 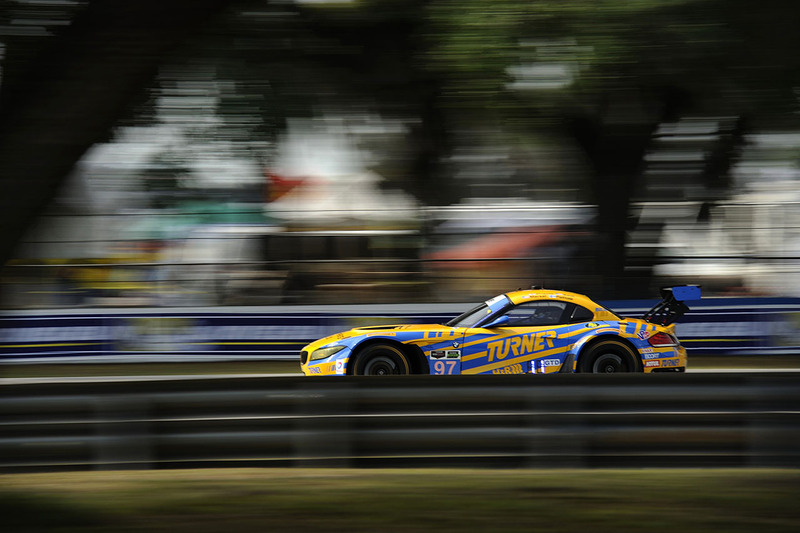 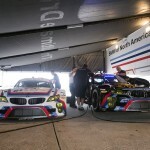 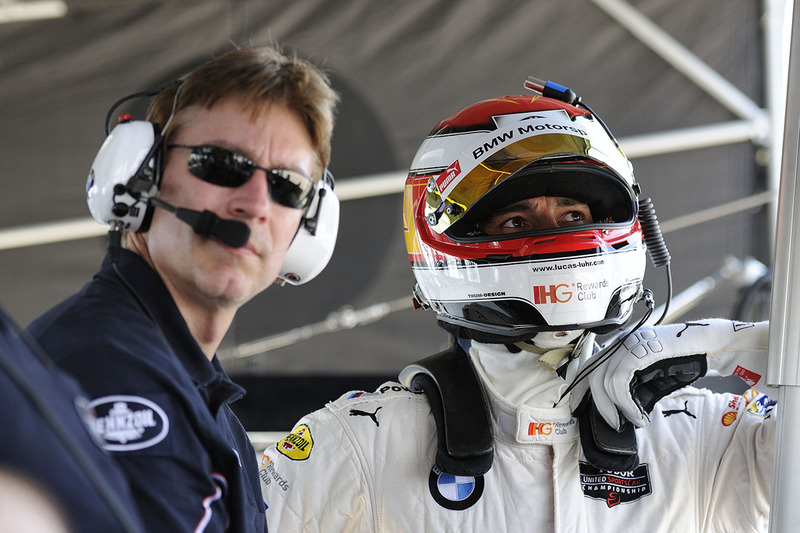 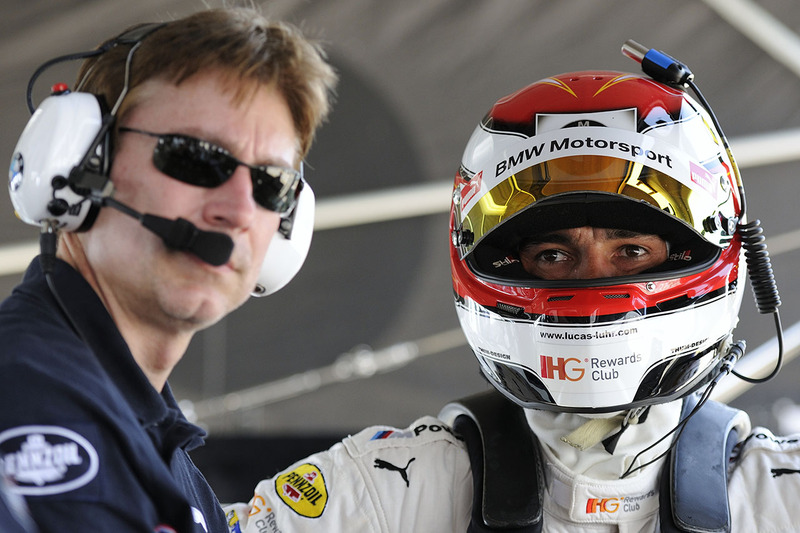 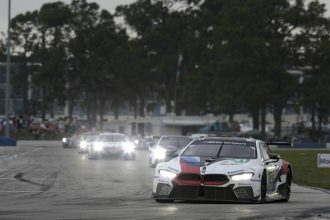 Updated: 12 hours down – Race Over: After an exhaustive race Lucas Luhr, John Edwards and Jens Klingmann finished fourth in the GTLM class in their Z4. 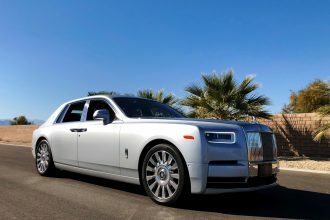 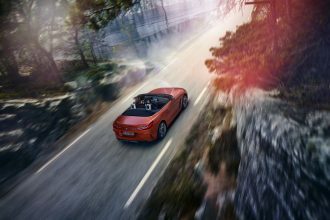 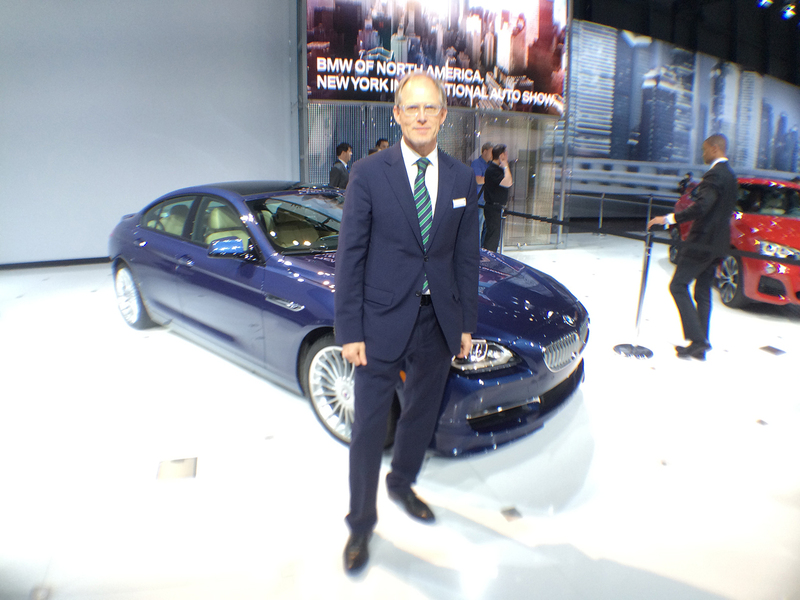 The team never had the pace to match the Corvette or the 911s in front. 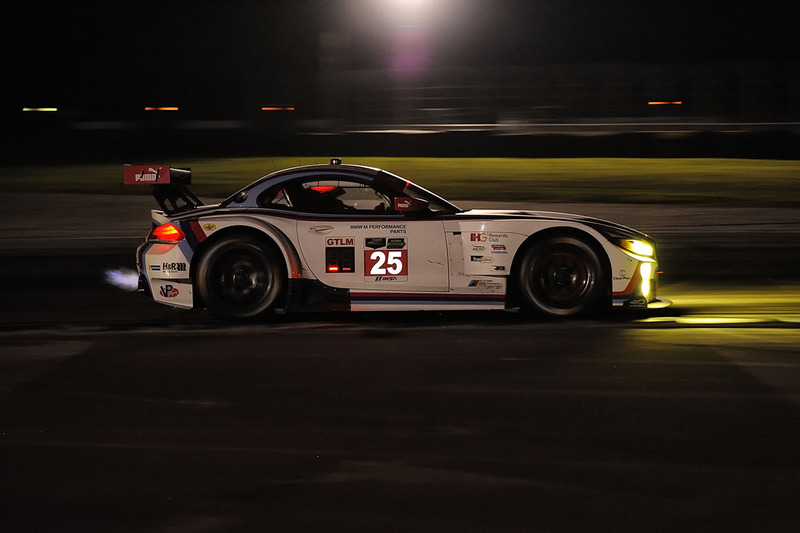 Unfortunately the #25 car suffered signifiant damaged front subframe during the race and ultimately finished 8th in last place. 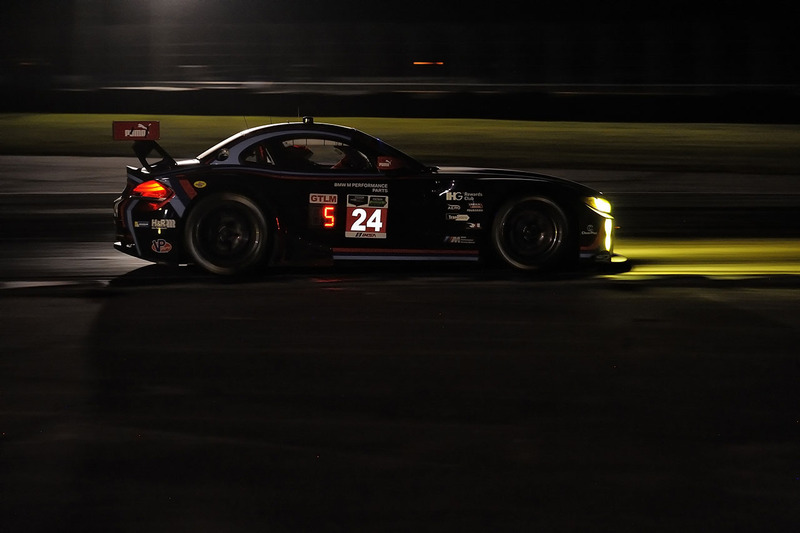 Update / 7 Hours Down: Team RLL has run into some trouble. 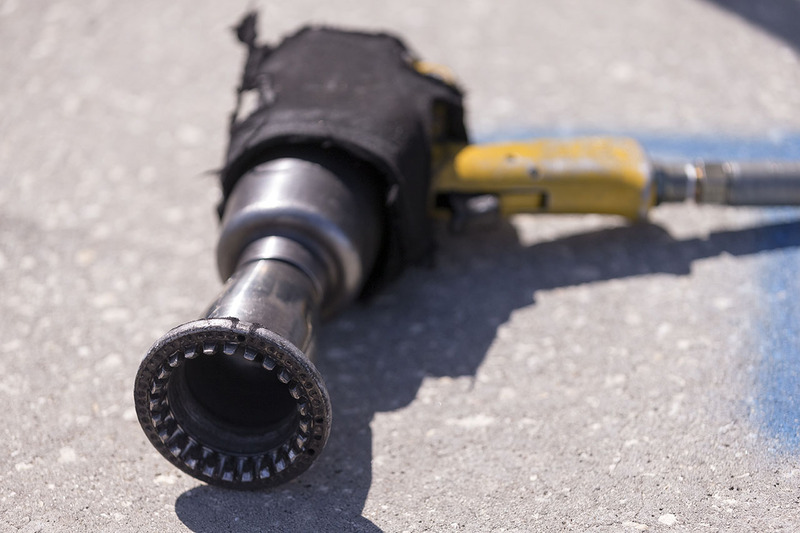 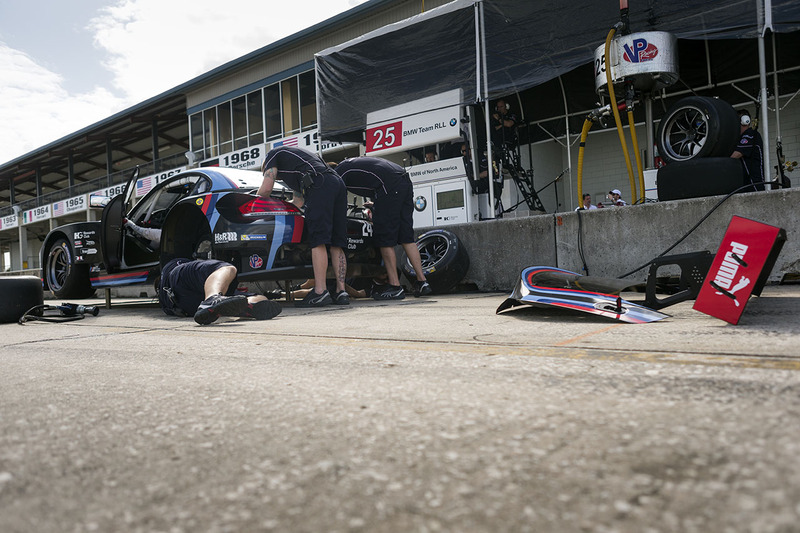 The #25 car had some track contact and has been in and out of the pits for repairs. 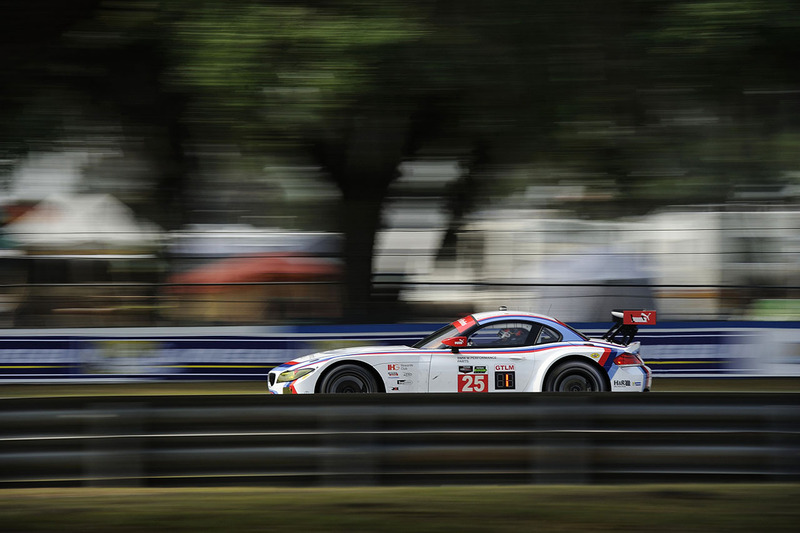 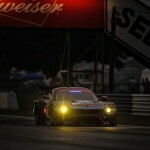 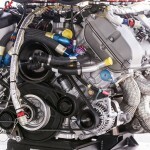 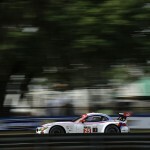 The #24 car is still running clean but currently resides in 6th in GTLM. 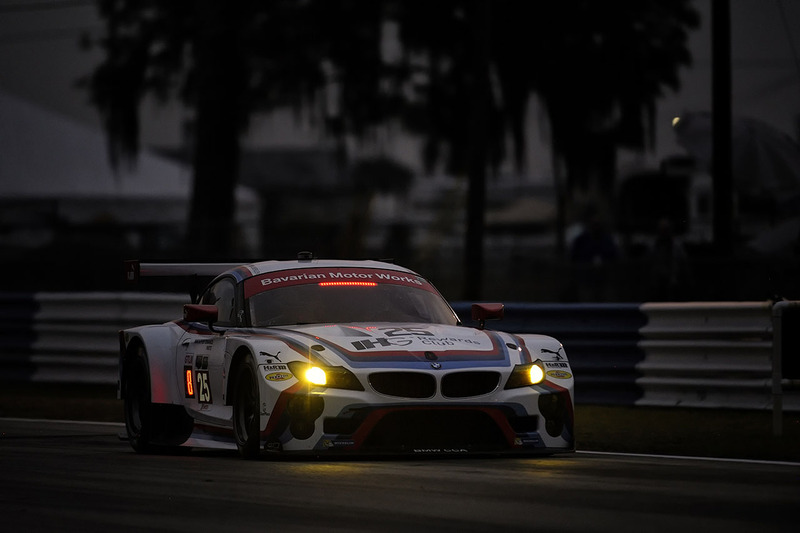 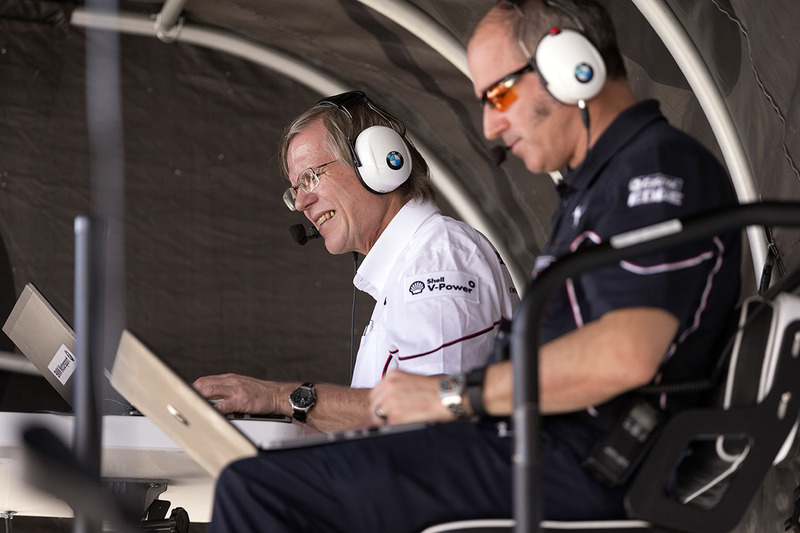 Update / 5 Hours Down: BMW Team RLL is running consistently in 4th and 5th behind the two factory 911 RSRs and a Corvette C7.R. 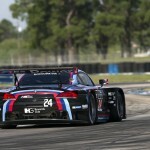 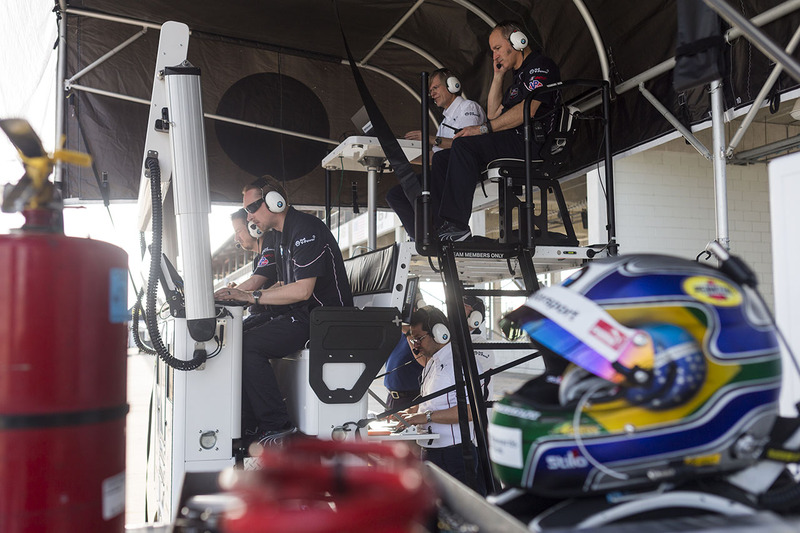 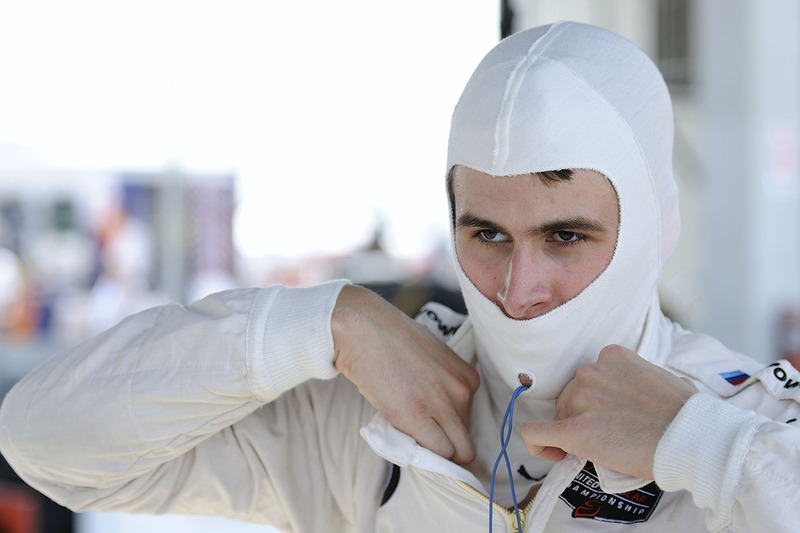 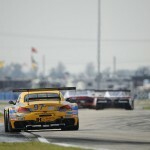 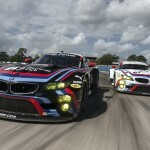 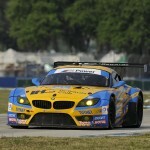 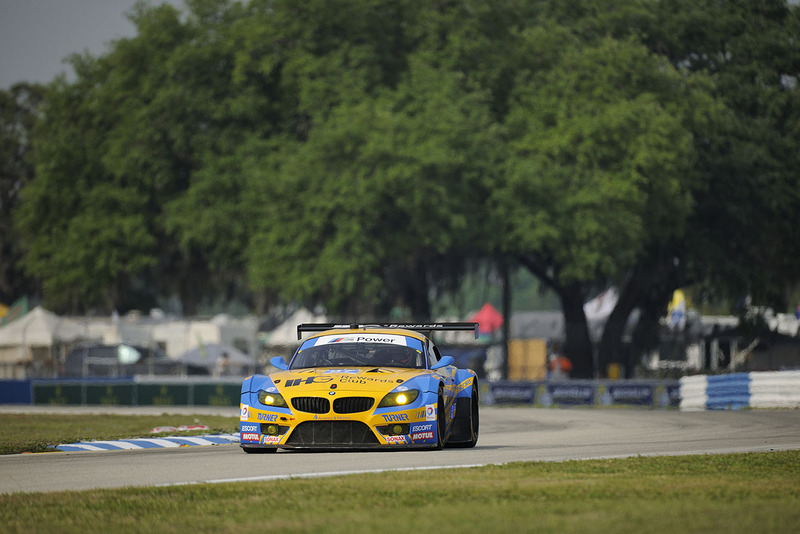 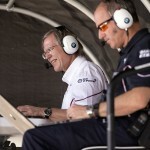 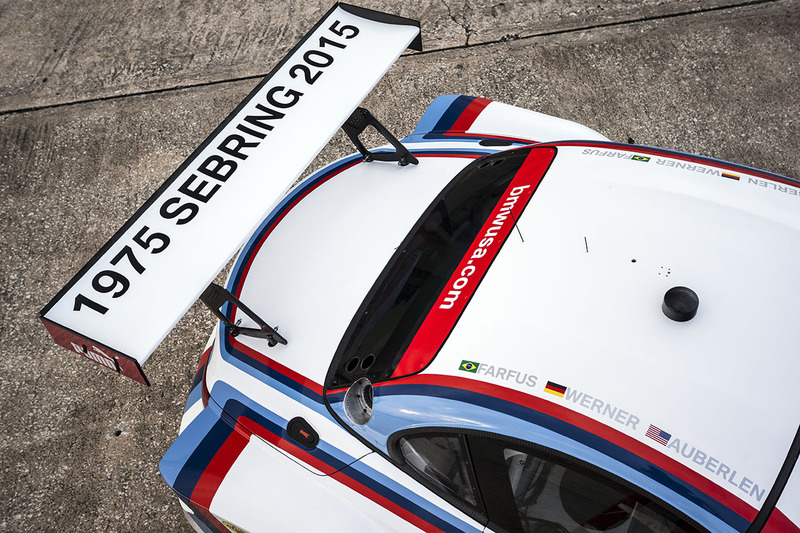 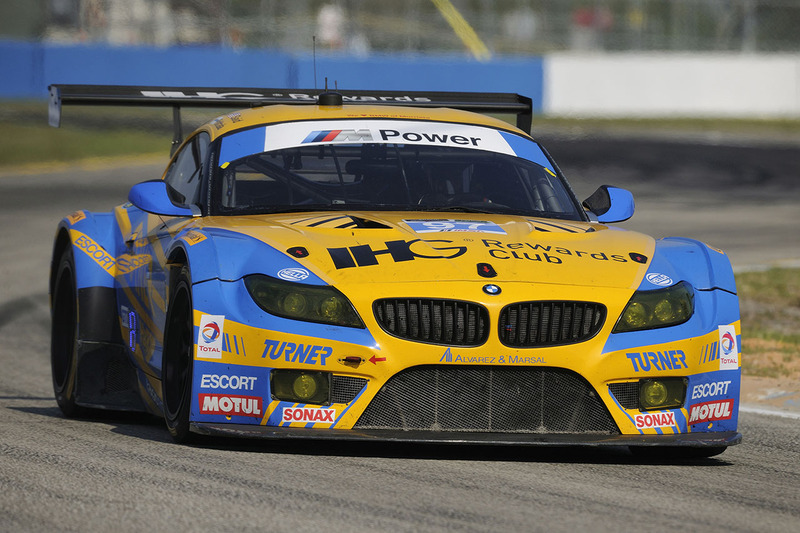 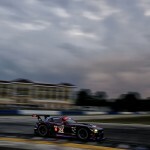 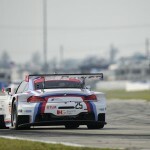 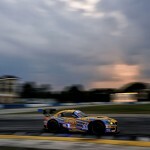 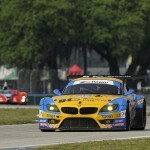 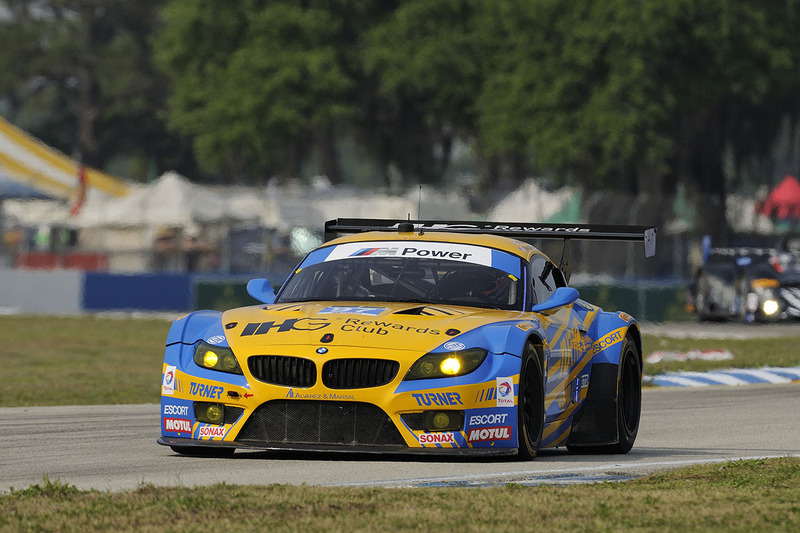 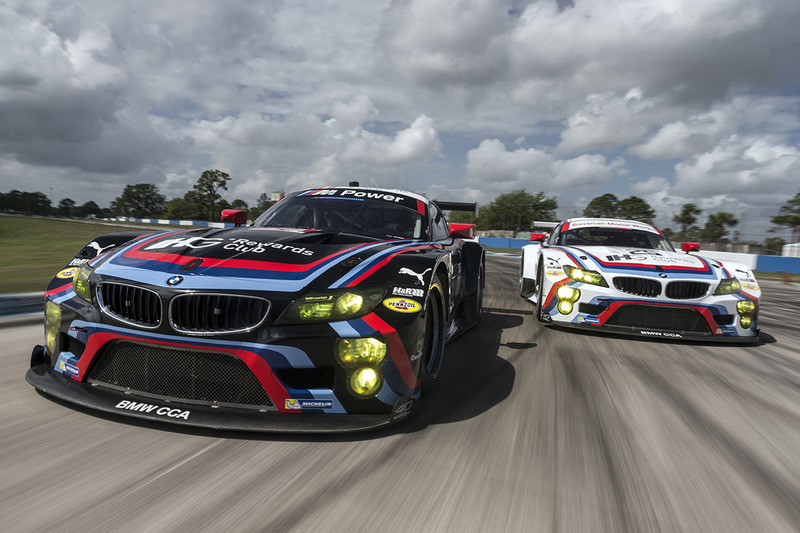 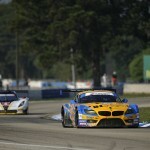 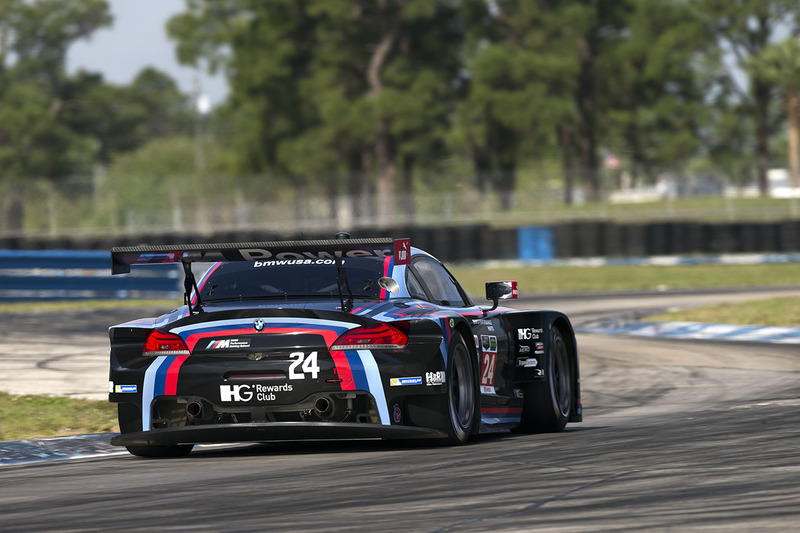 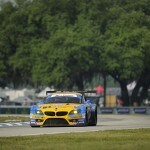 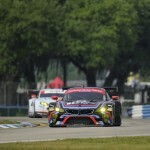 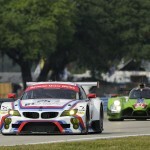 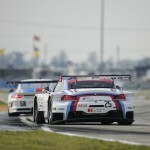 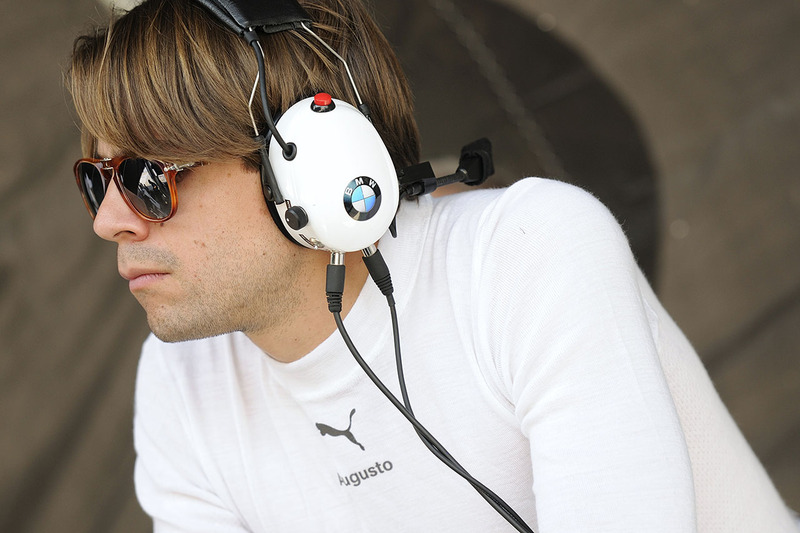 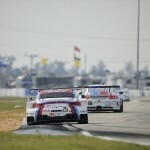 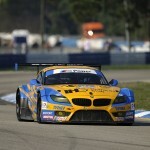 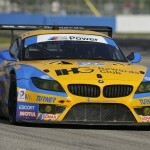 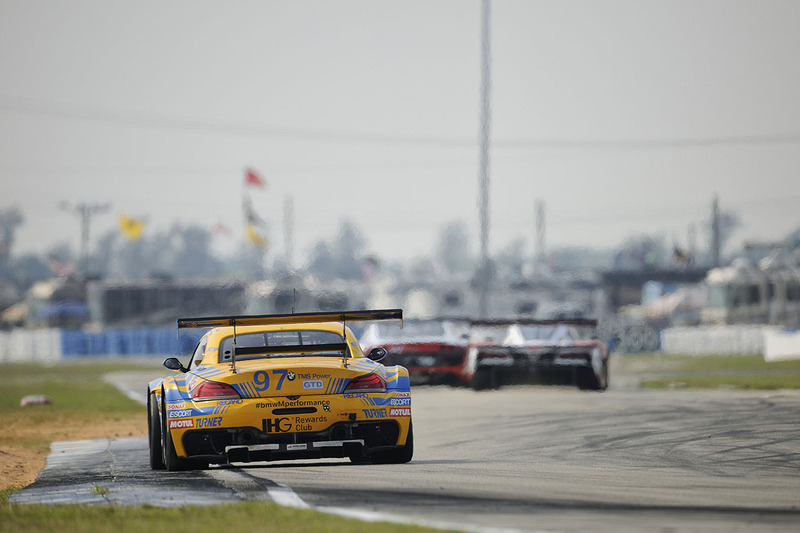 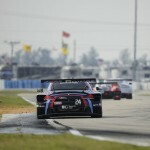 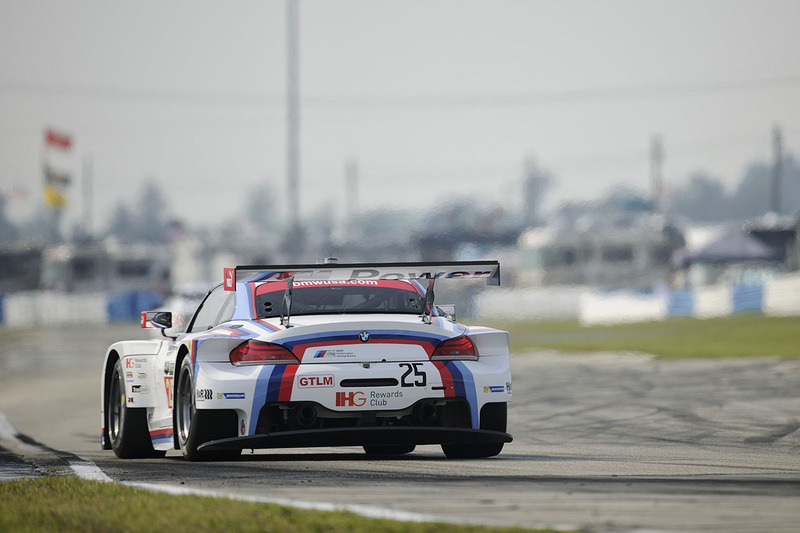 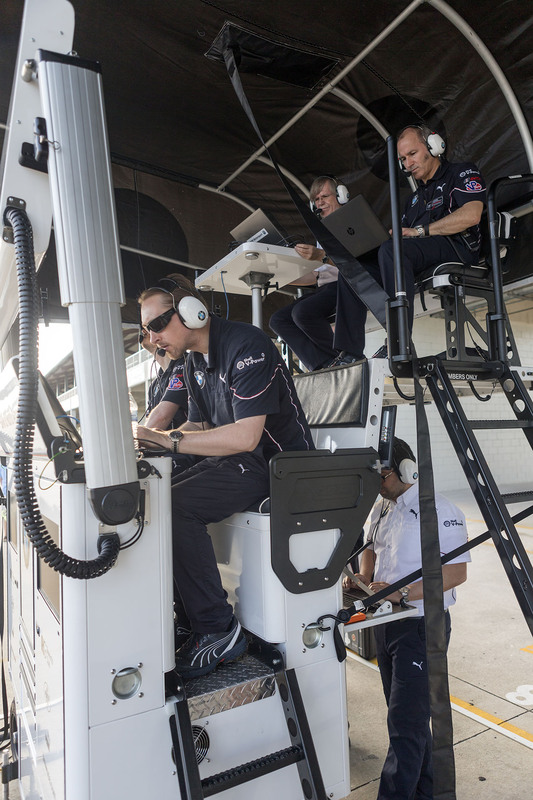 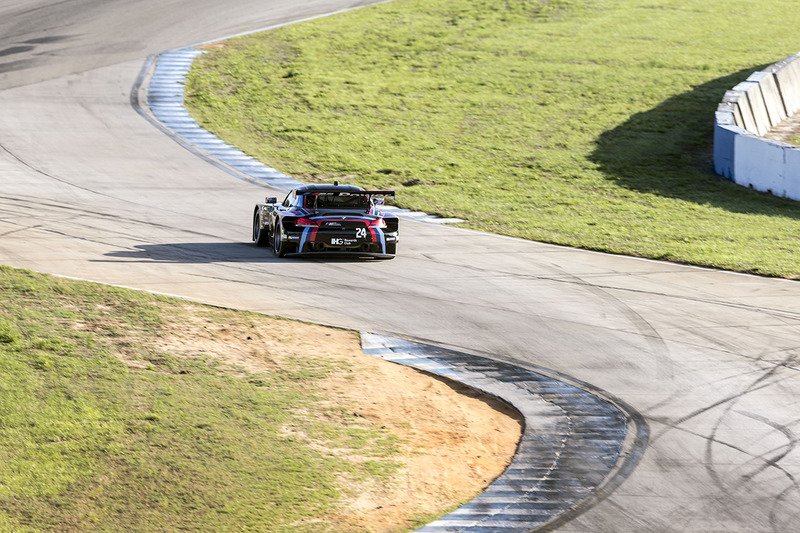 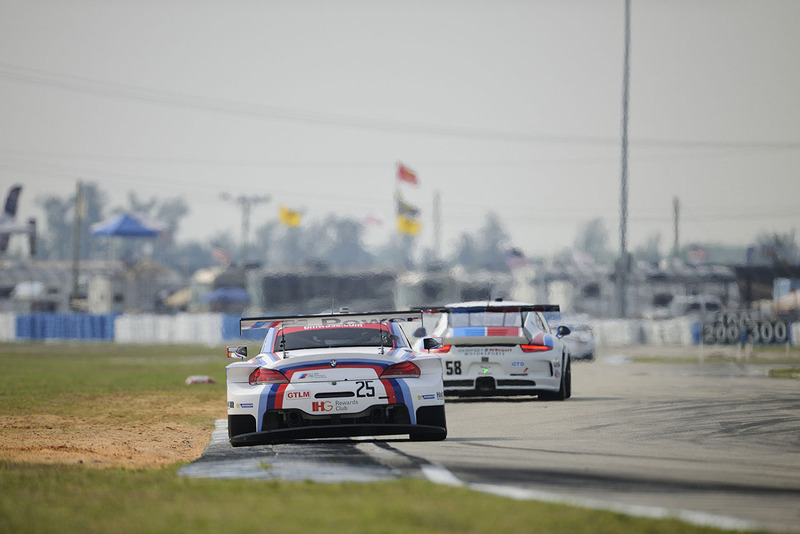 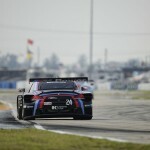 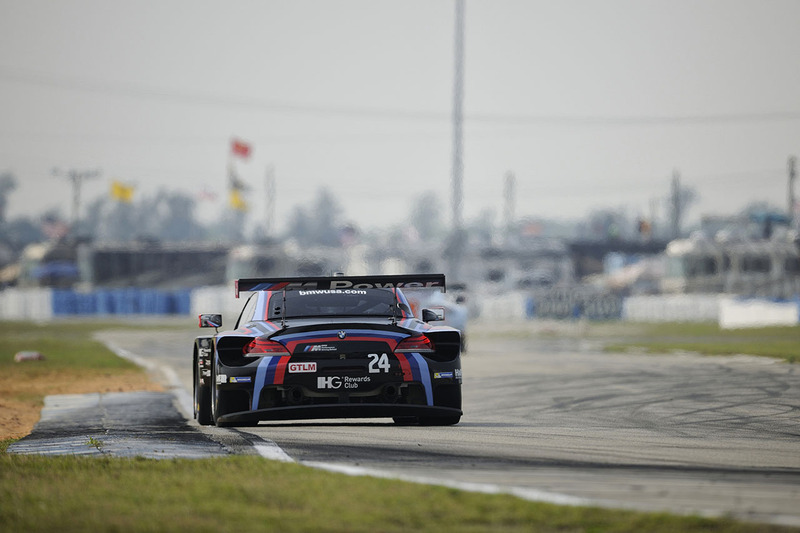 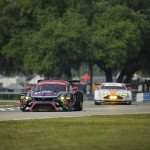 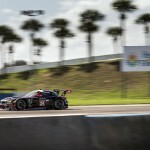 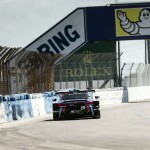 We’re underway at Sebring. 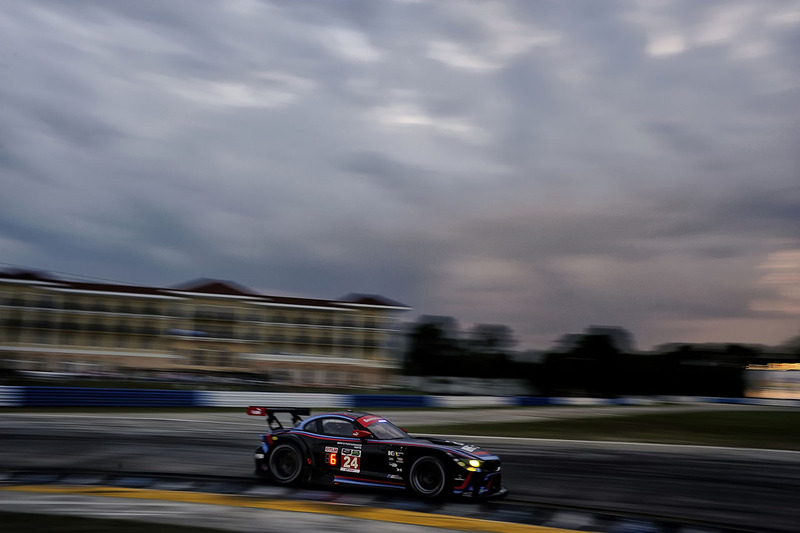 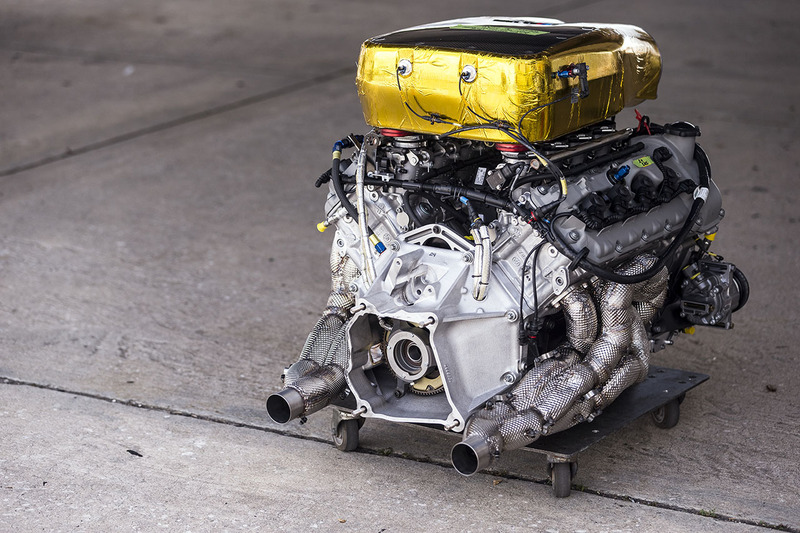 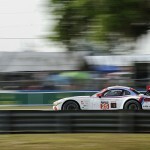 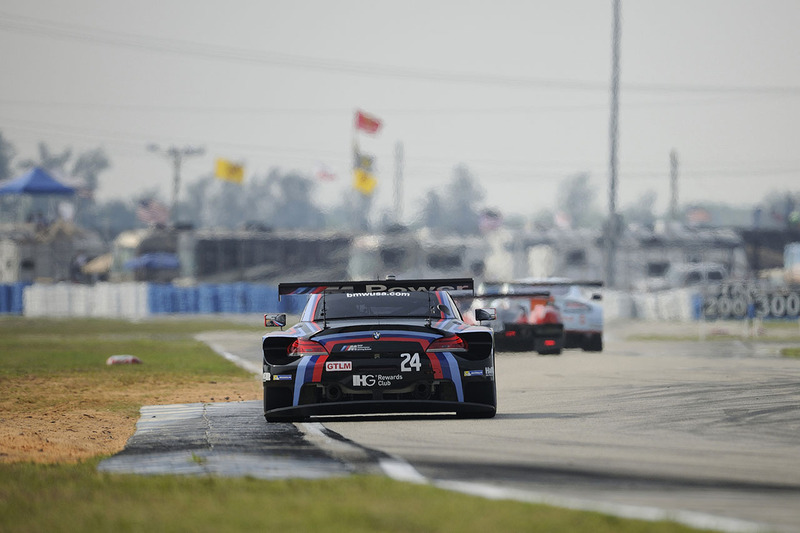 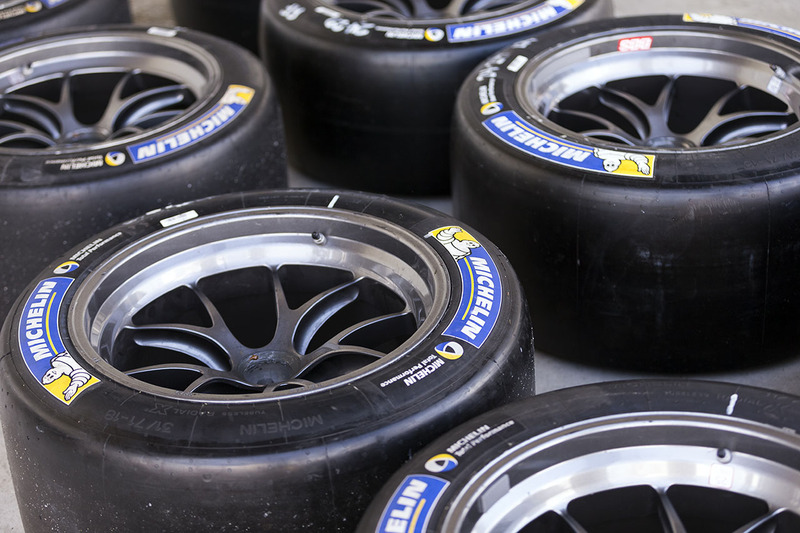 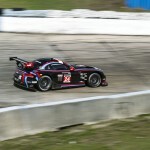 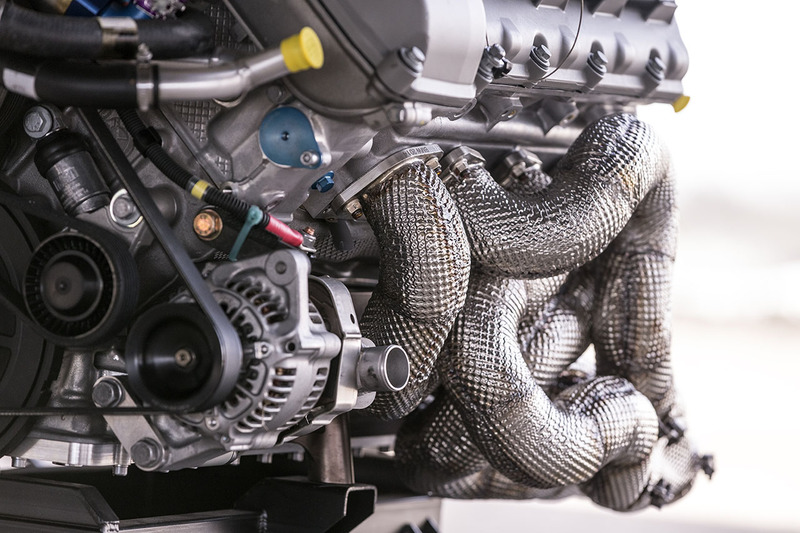 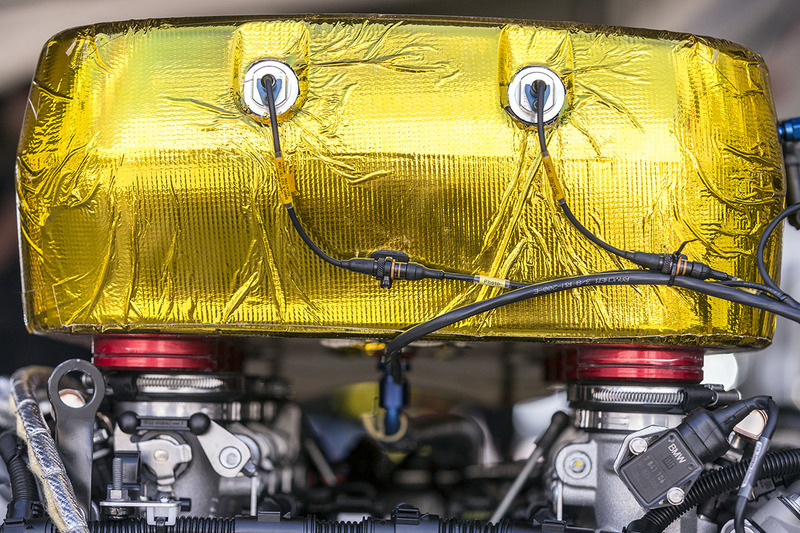 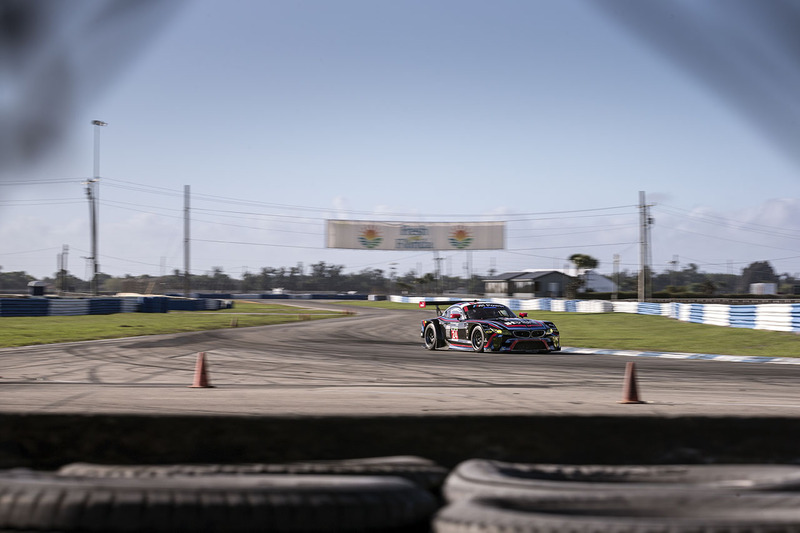 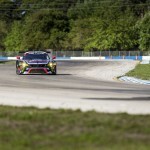 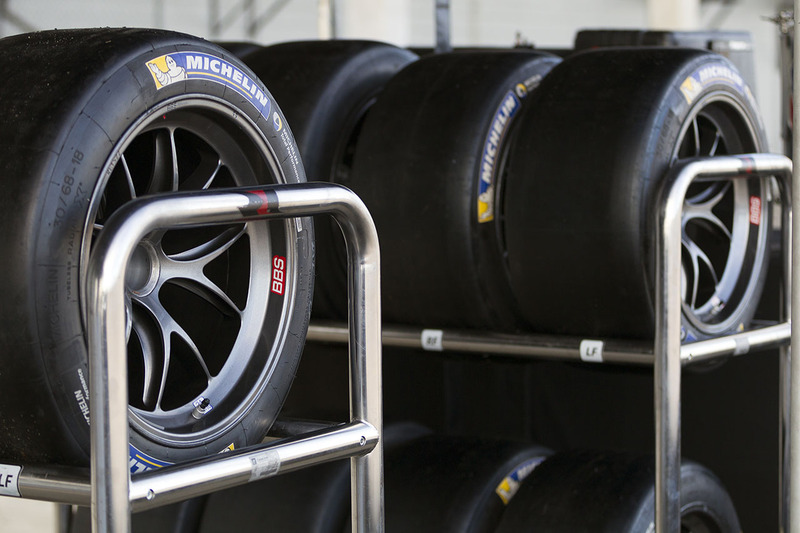 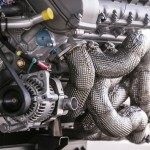 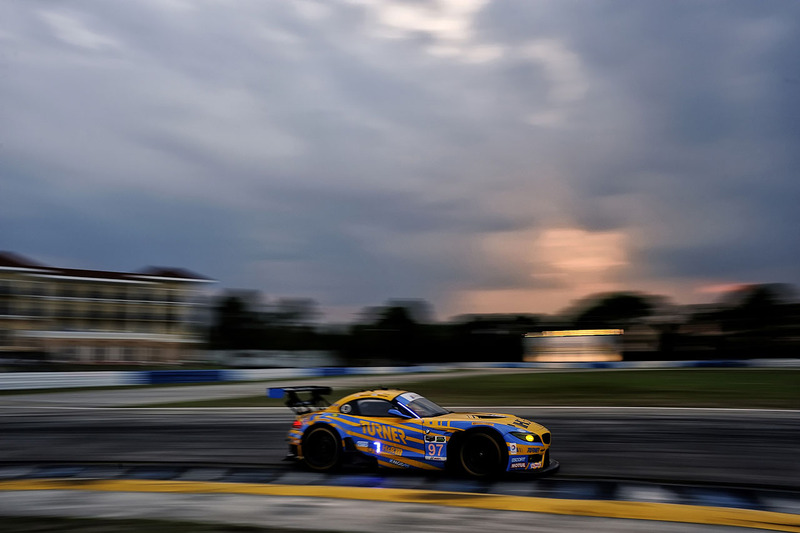 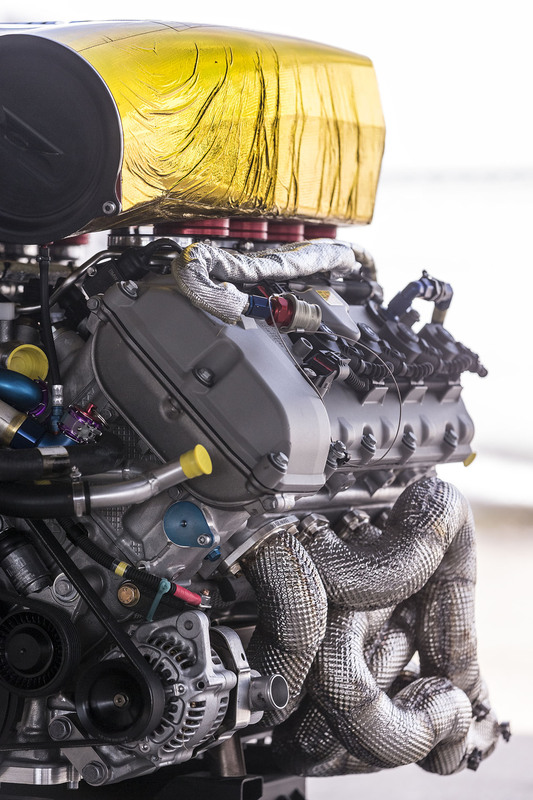 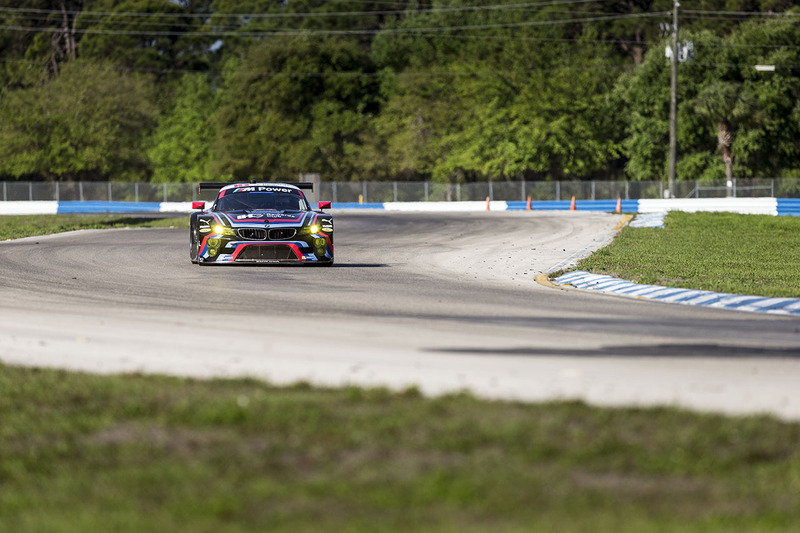 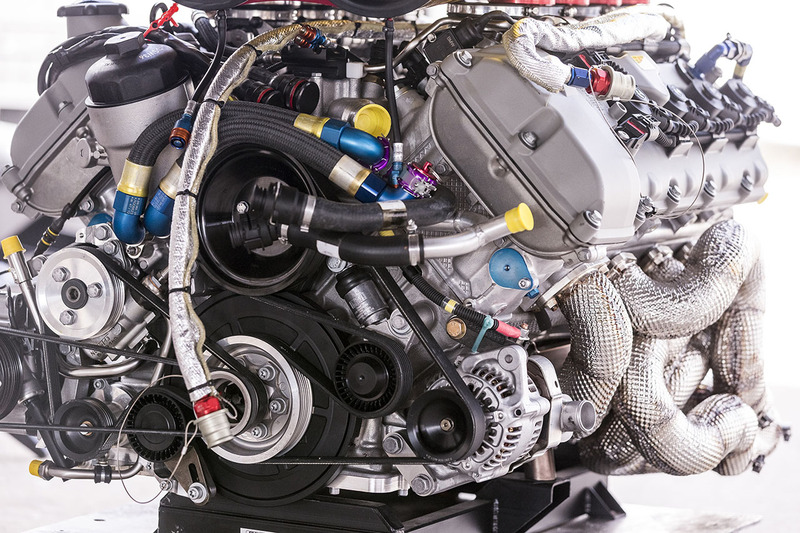 The 12 Hours of Sebring is one of the cornerstone events in endurance racing and is known for being one of the most brutal. 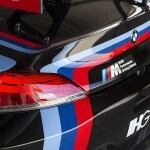 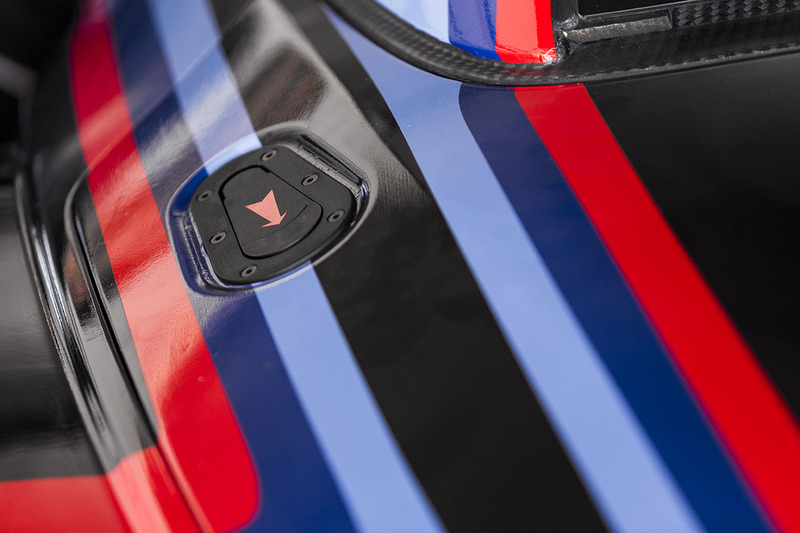 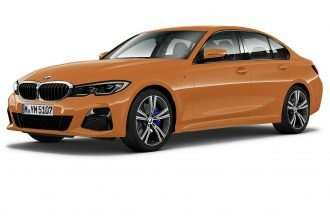 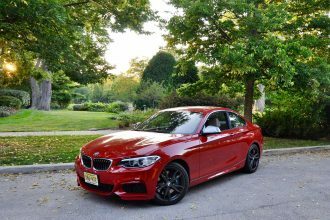 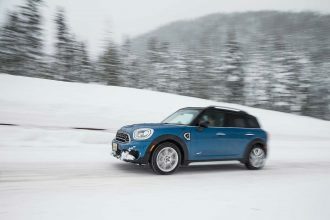 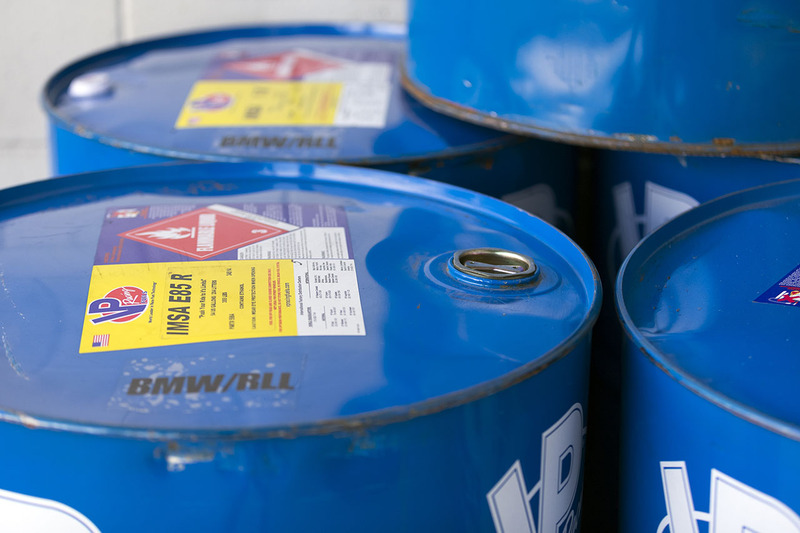 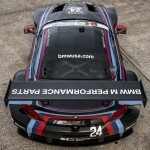 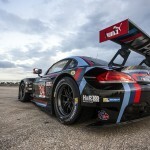 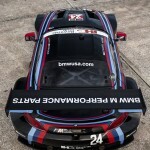 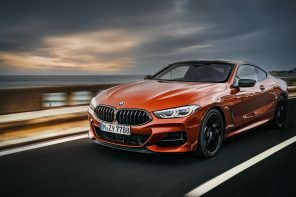 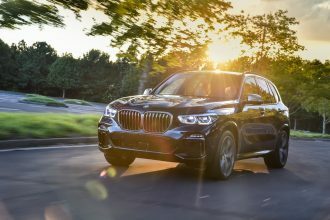 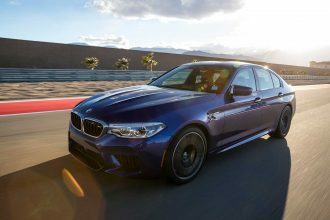 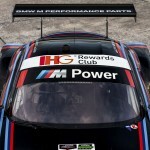 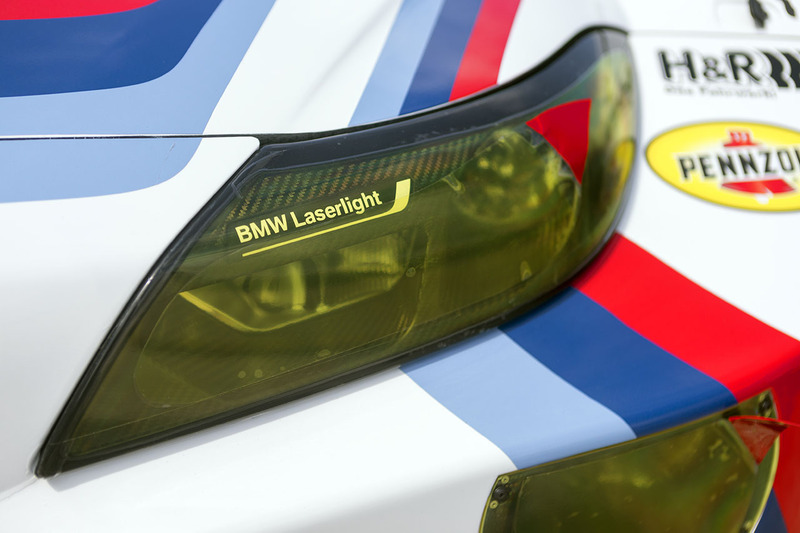 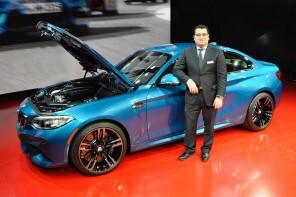 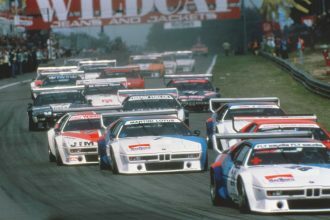 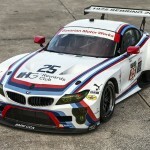 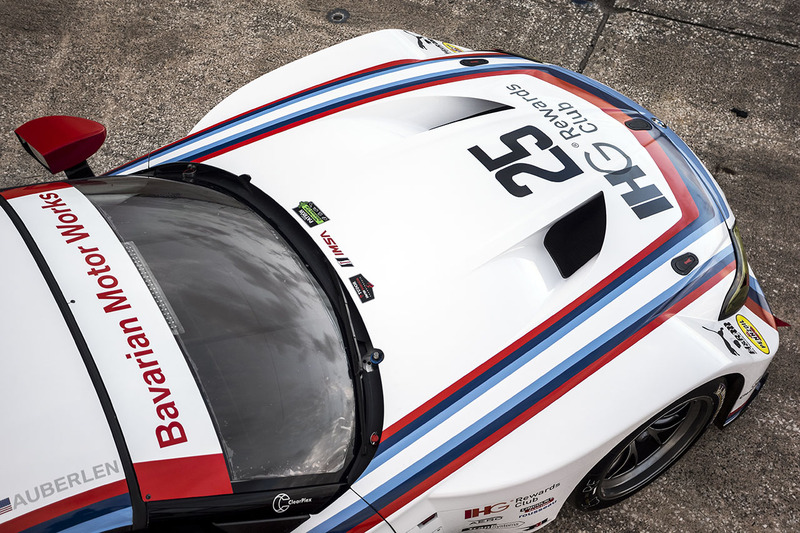 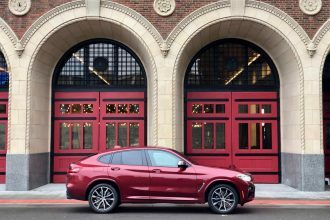 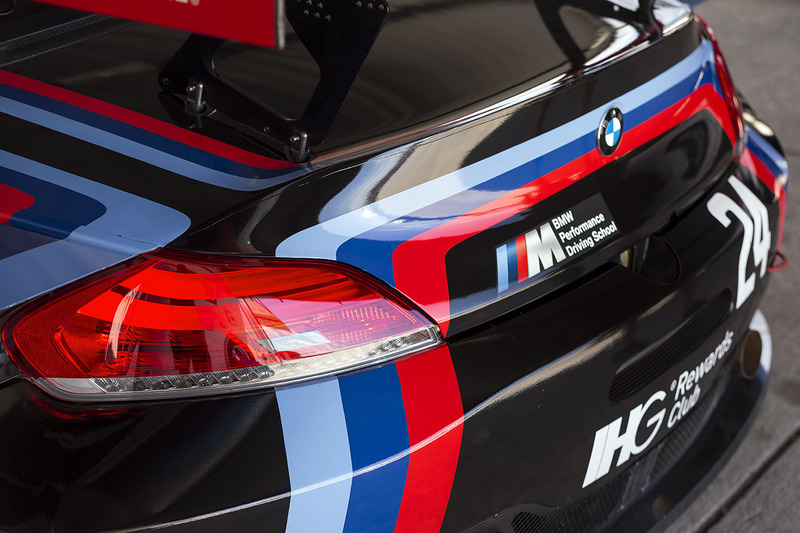 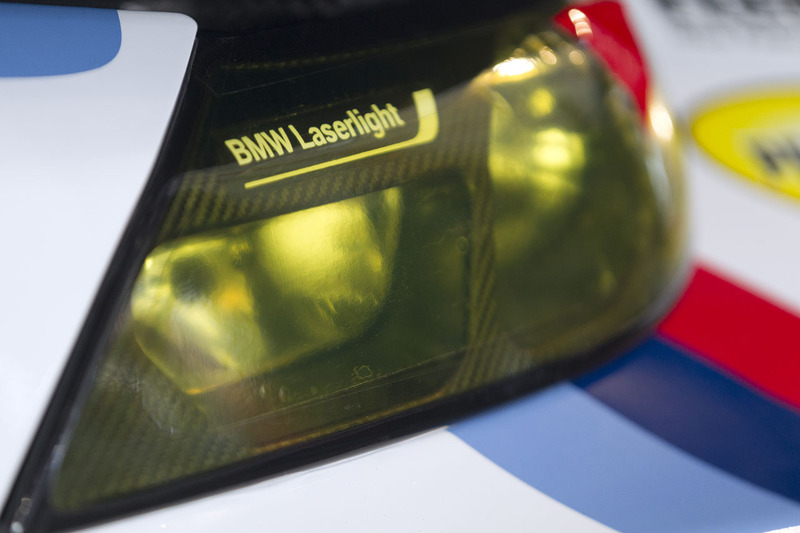 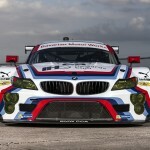 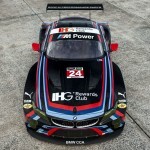 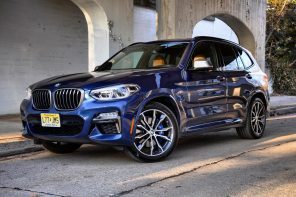 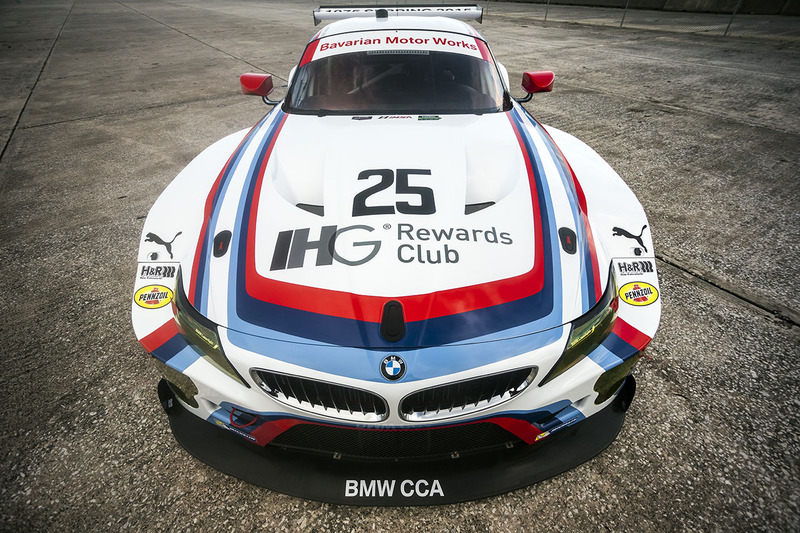 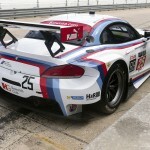 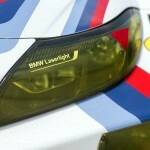 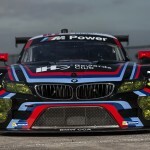 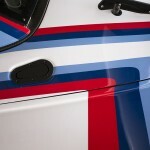 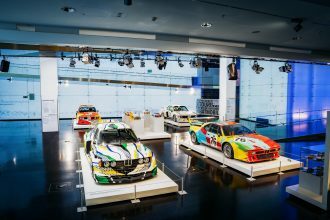 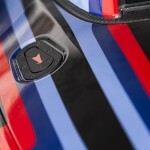 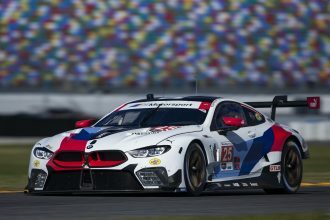 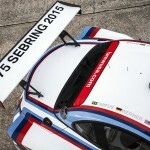 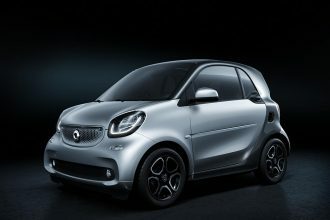 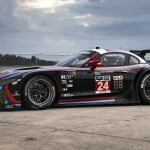 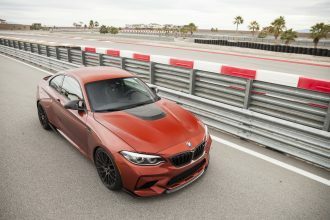 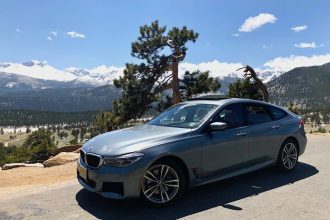 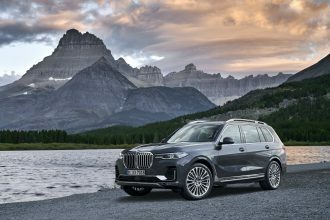 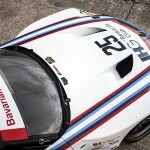 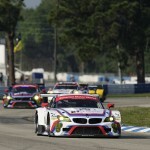 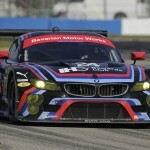 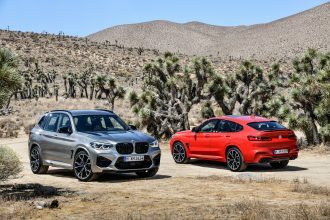 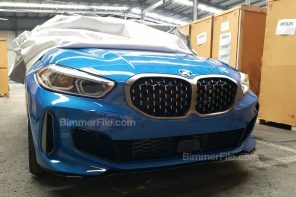 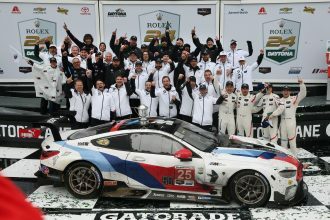 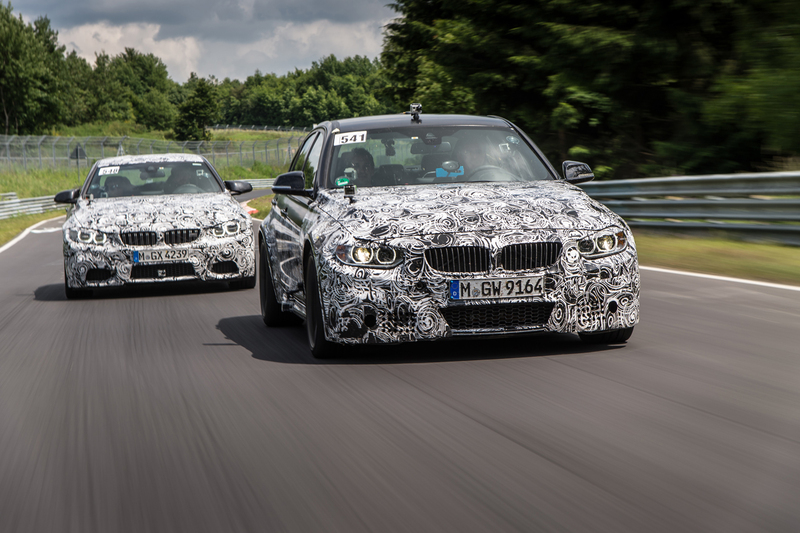 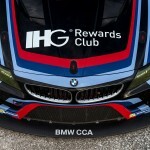 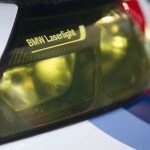 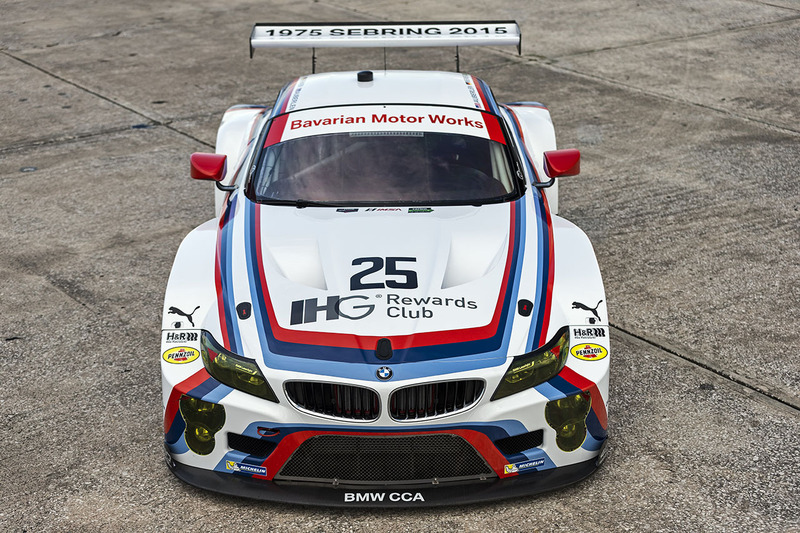 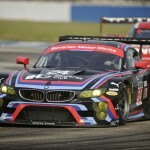 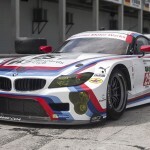 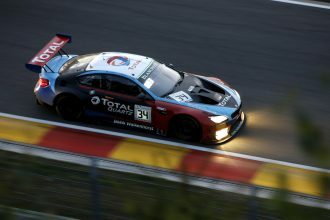 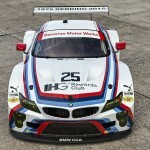 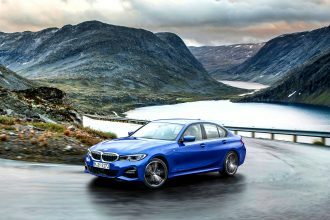 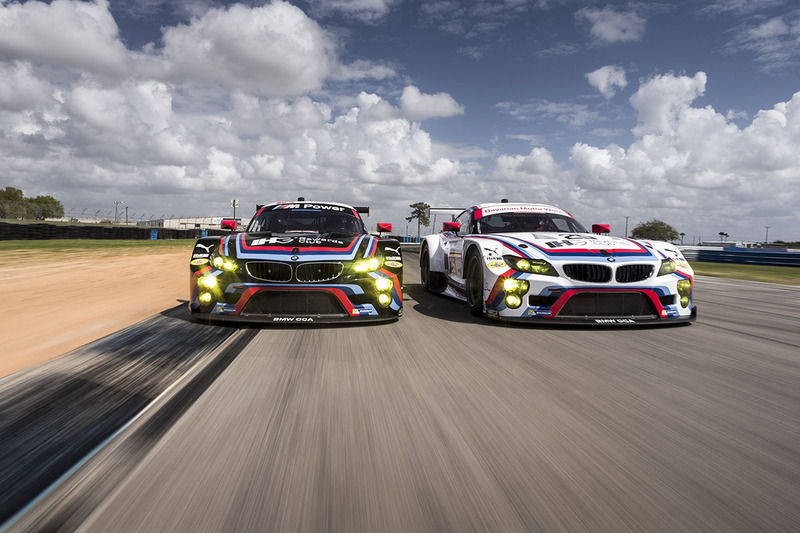 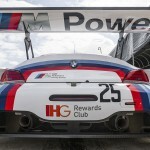 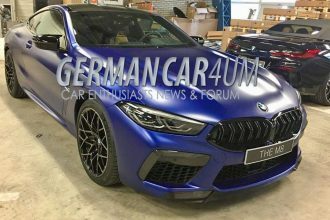 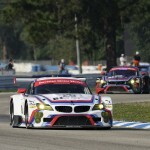 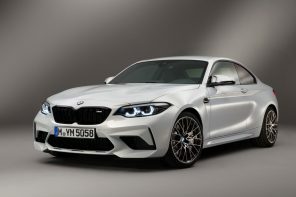 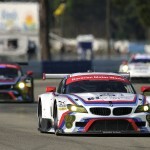 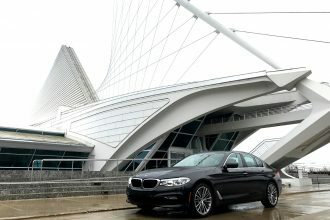 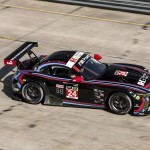 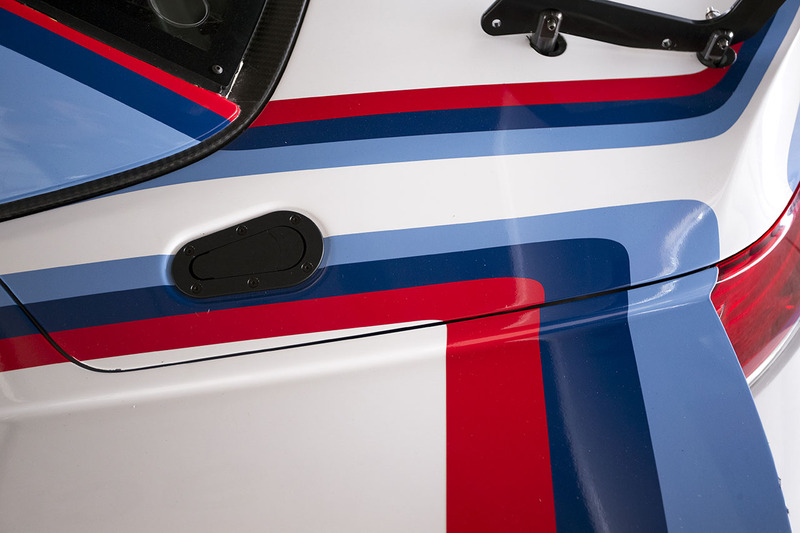 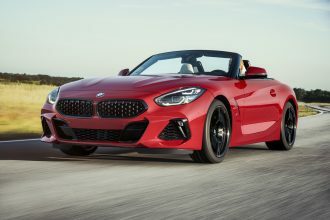 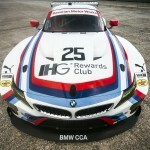 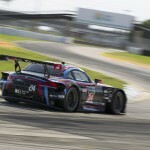 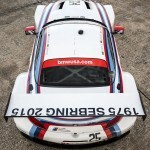 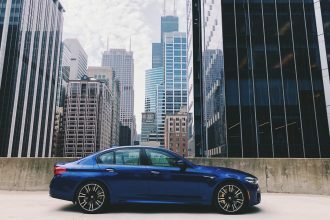 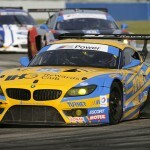 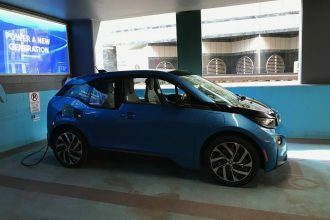 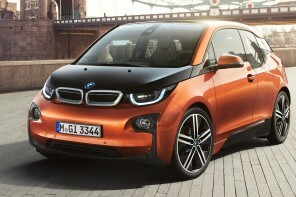 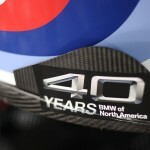 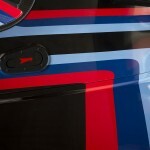 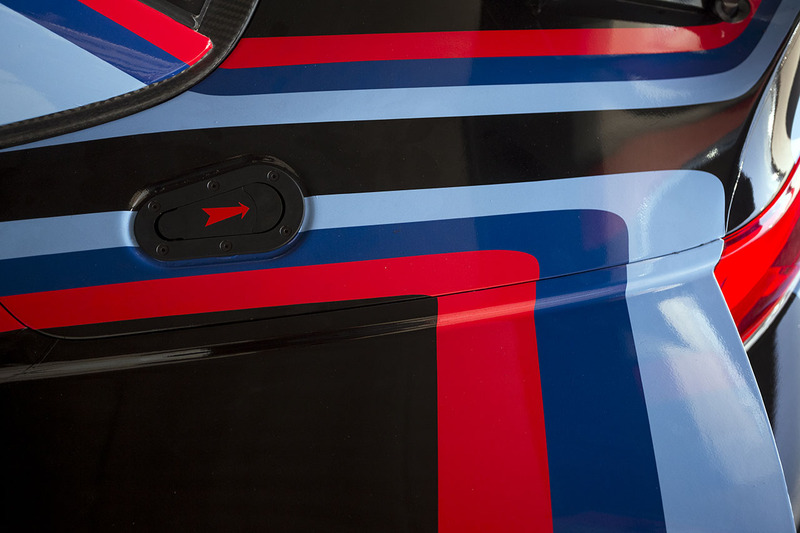 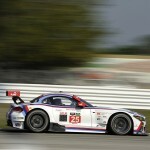 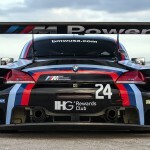 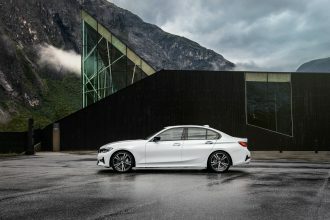 This year BMW has qualified its 40th anniversary liveried cars in 4th and 6th in the thick of the Porsches, Corvettes and Ferraris. 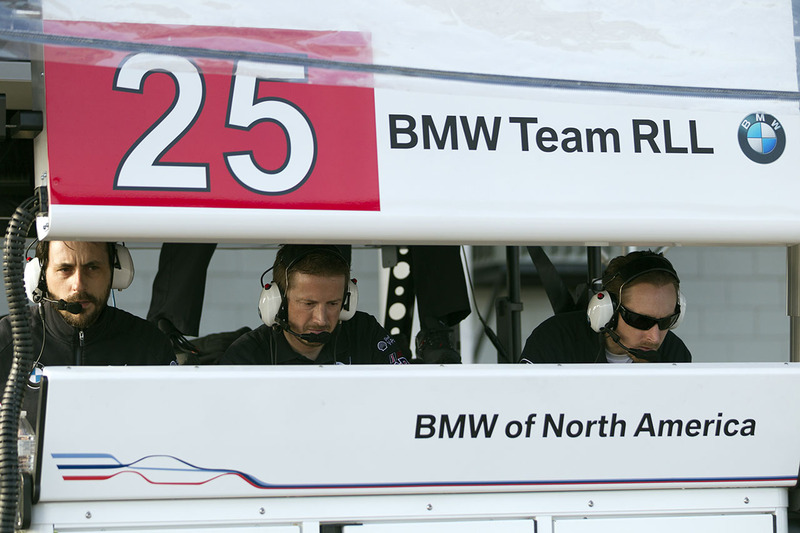 We’ll be updating throughout the day and into the evening. 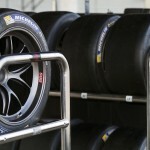 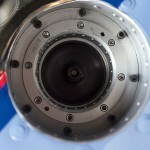 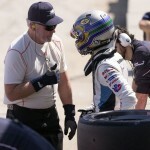 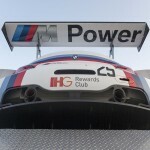 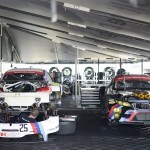 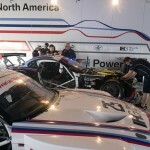 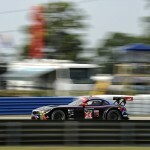 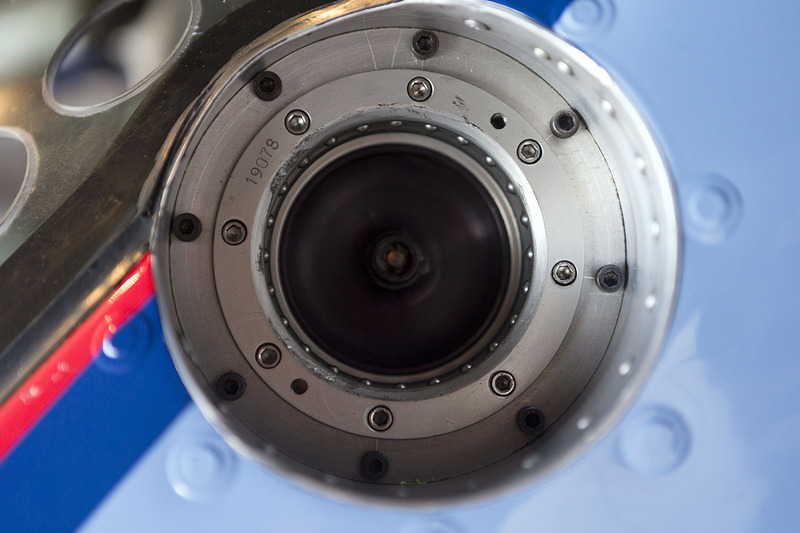 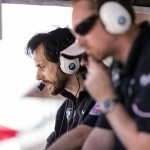 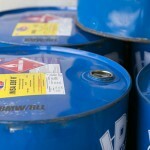 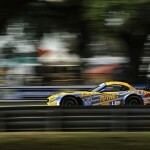 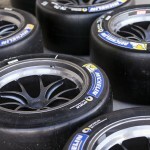 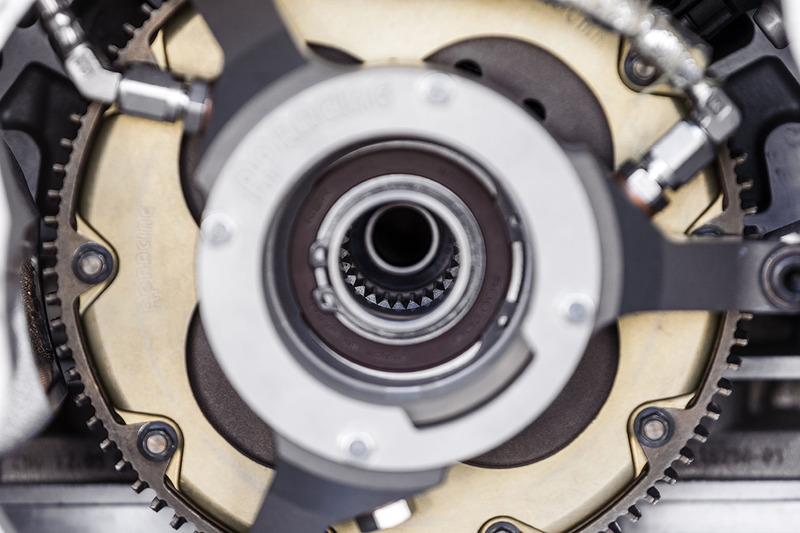 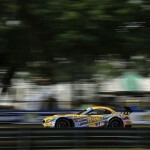 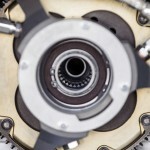 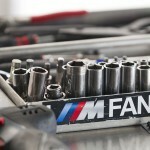 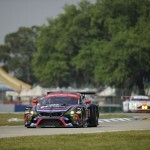 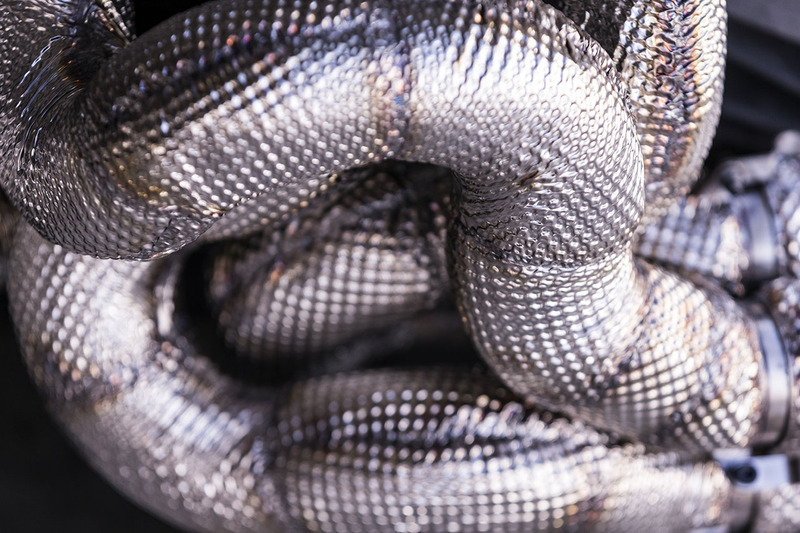 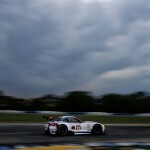 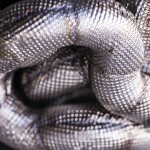 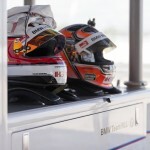 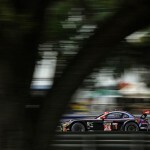 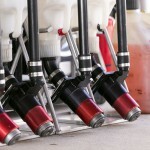 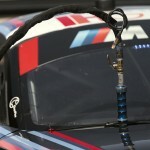 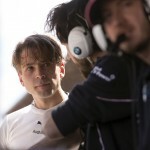 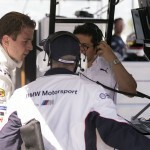 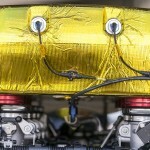 In the meantime click through to get a feel for the track and the race with our updating gallery.